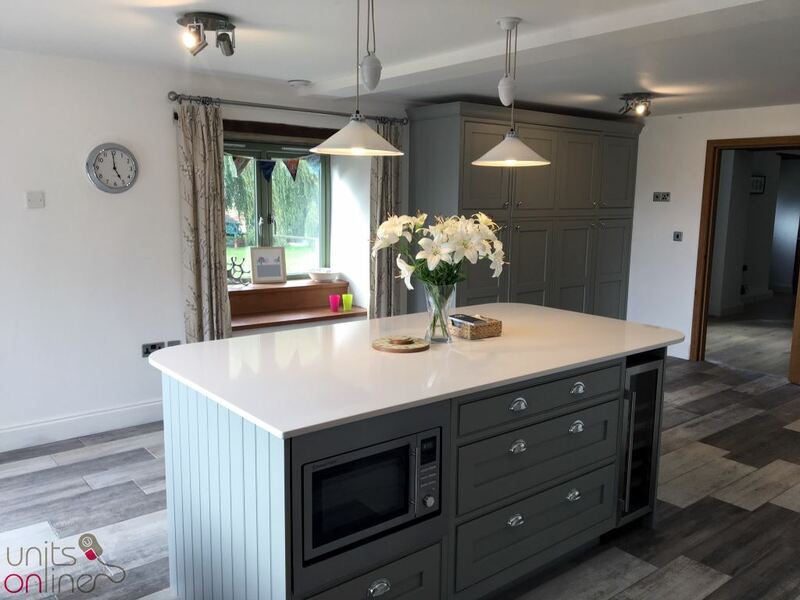 Here are a few of our testimonials we hope you enjoy reading them. 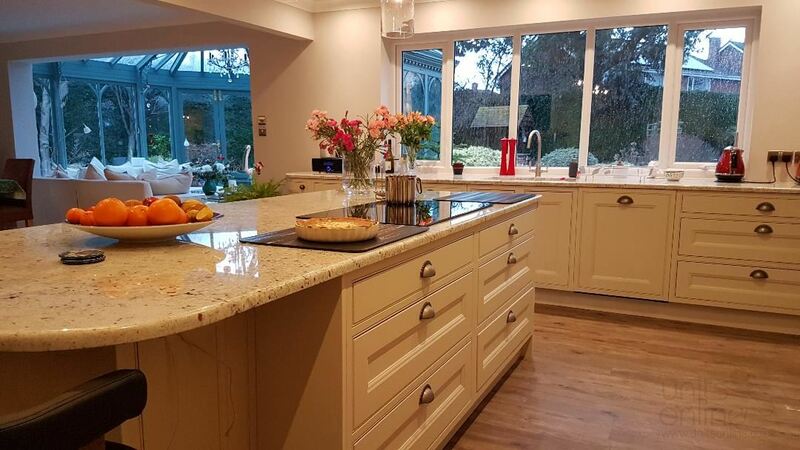 Customer referrals and recommendations are very important to us as they help us measure our product quality and service levels. 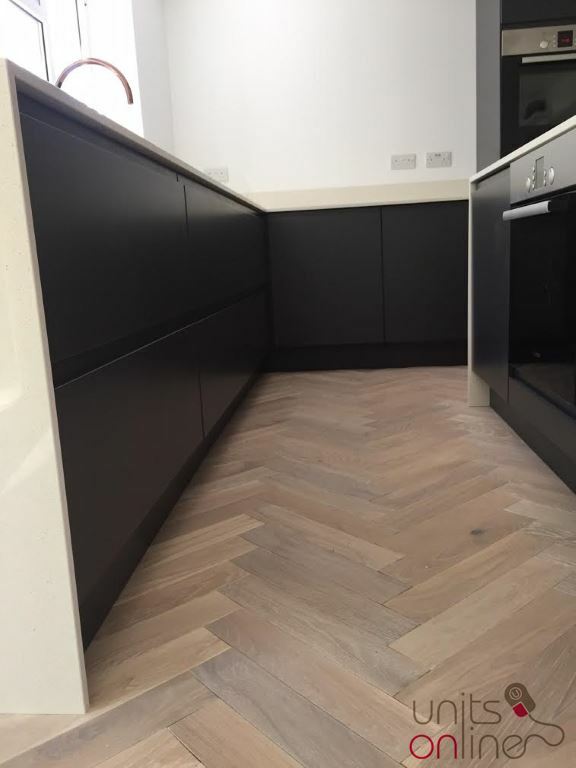 Great customer service, delivered quickly and packaged extremely well. 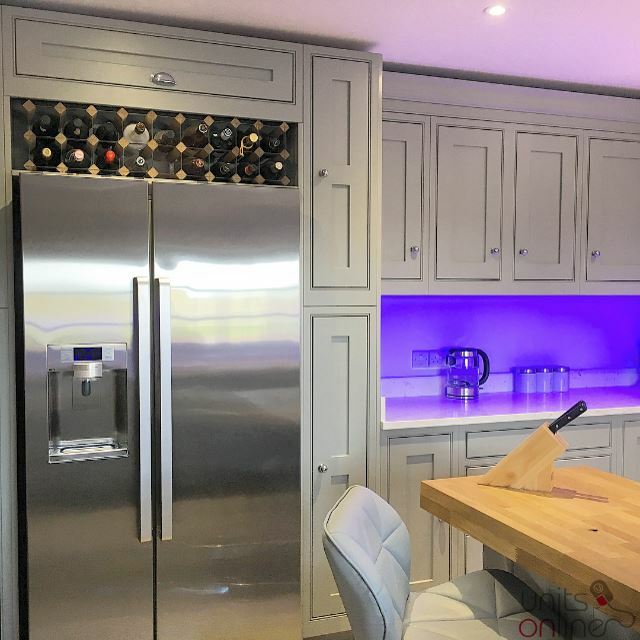 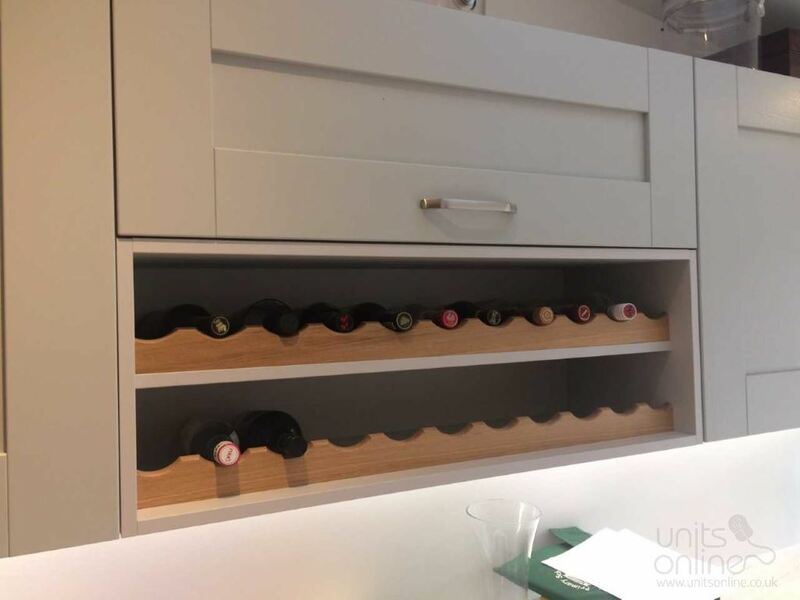 Once I placed the order I received a phone call about my customisations and over the phone, they were able to make suggestions to make the wine rack over the fridge fit perfectly and exactly how we had envisioned. 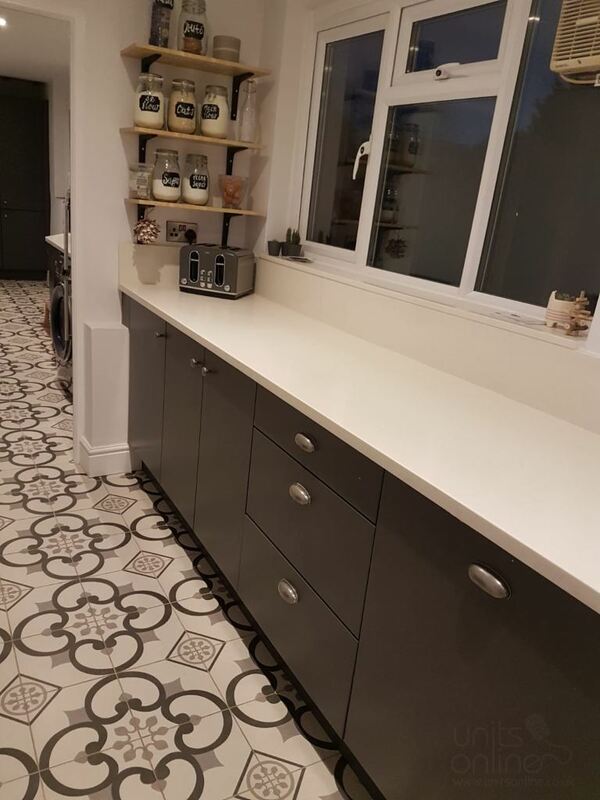 So happy with the end result, thank you so much! 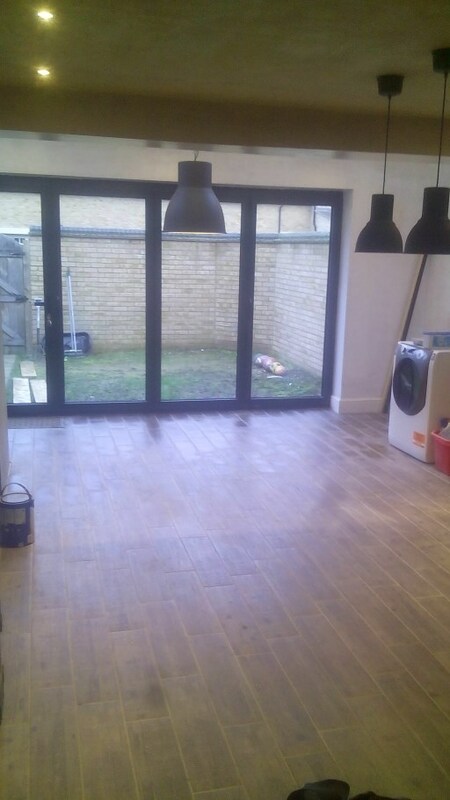 I would like to say what a pleasure it has been to deal with your company. 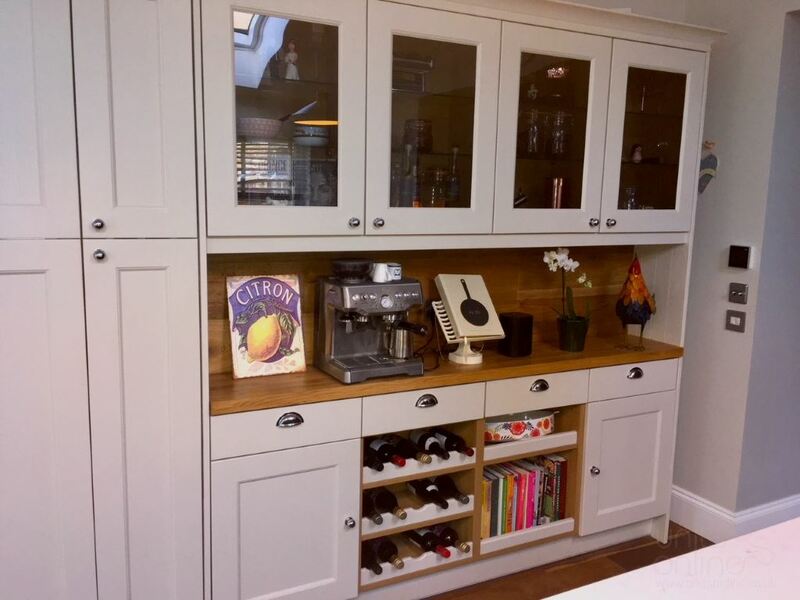 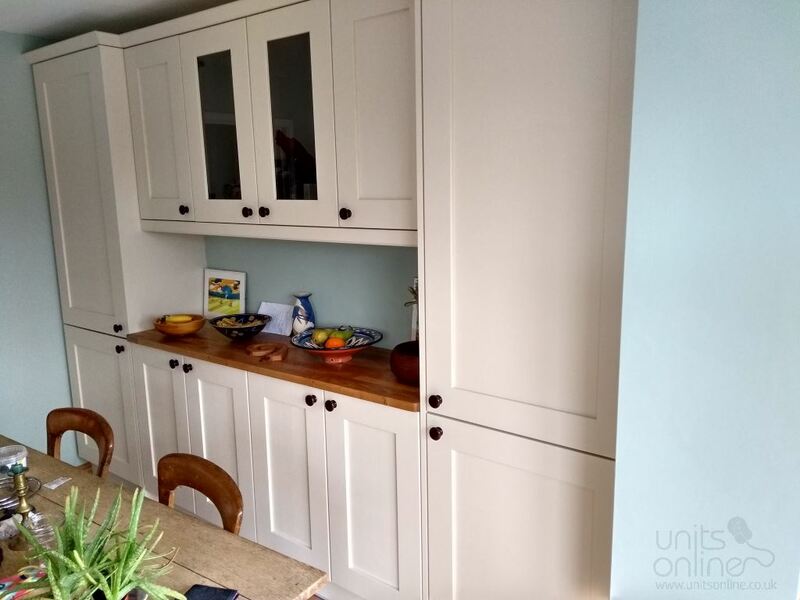 Excellent in every way, from initial advice, through Richard knowing my design by heart, through superb quality and helpful modification of a cupboard size, to great after sales service. 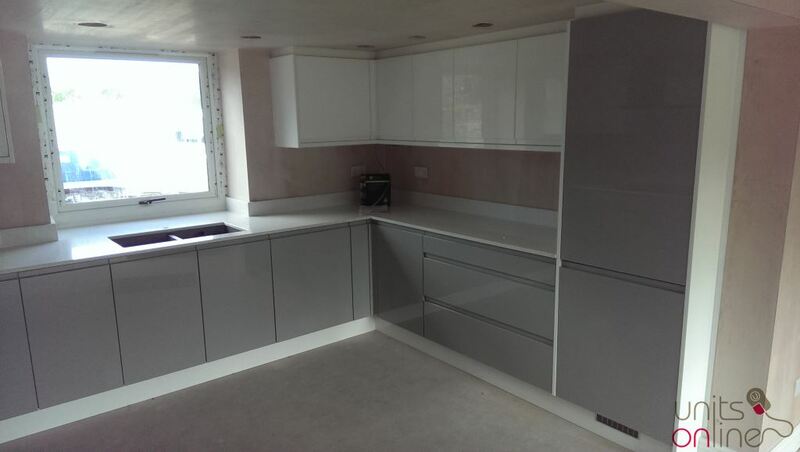 Thanks also to Lois and the people associated with despatch and delivery. 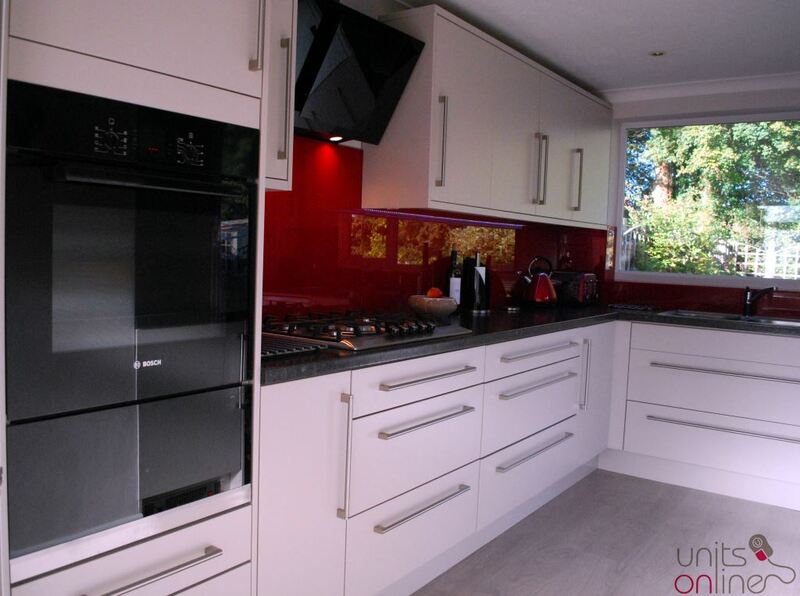 Big contrast to some of the moans I have heard from friends about some other companies! 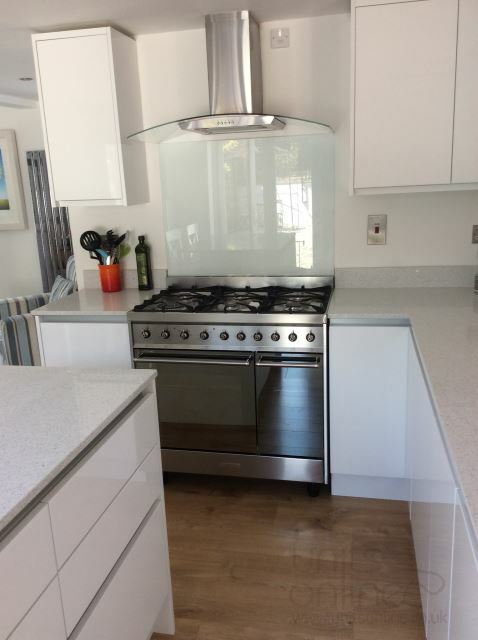 Keep up the good work, we are recommending you to anyone who might be interested. 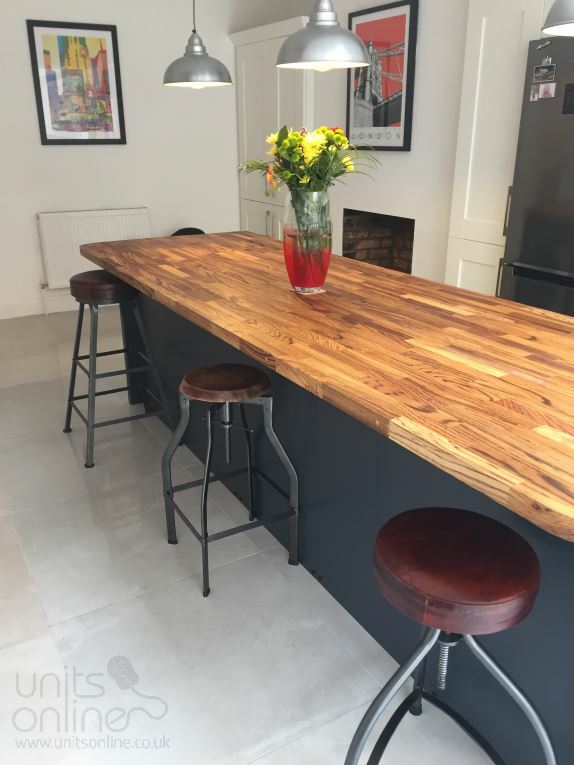 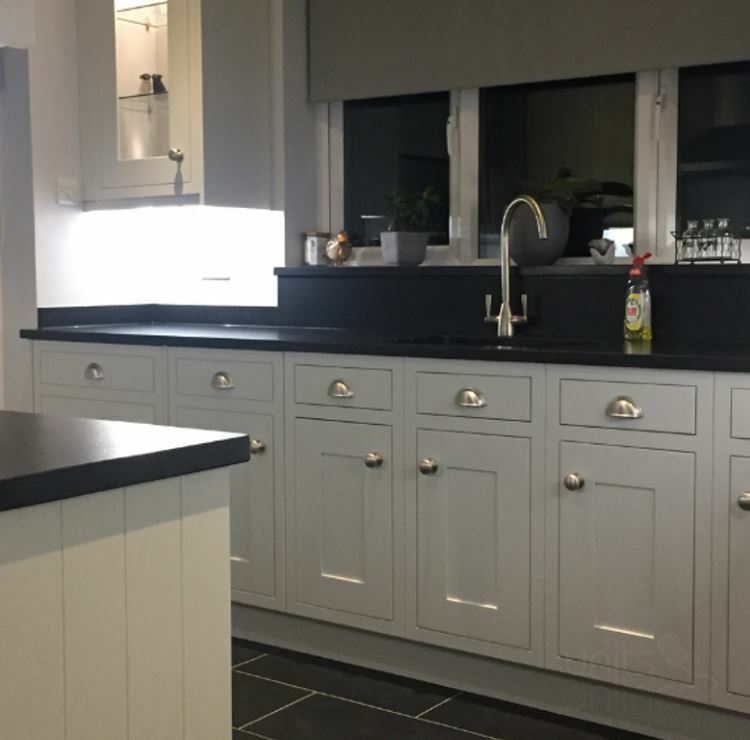 Hi Nathan, just wanted to write a quick note to thank you for all your help with the kitchen, we could have been left to hang out to dry with the worktop situation, but your company was fantastic! 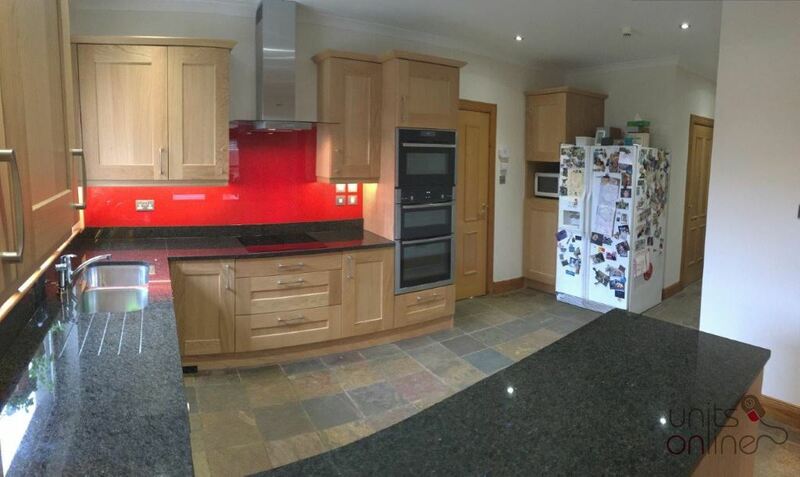 You not only have a customer for life, but I will recommend you to everyone I know who needs a new kitchen. 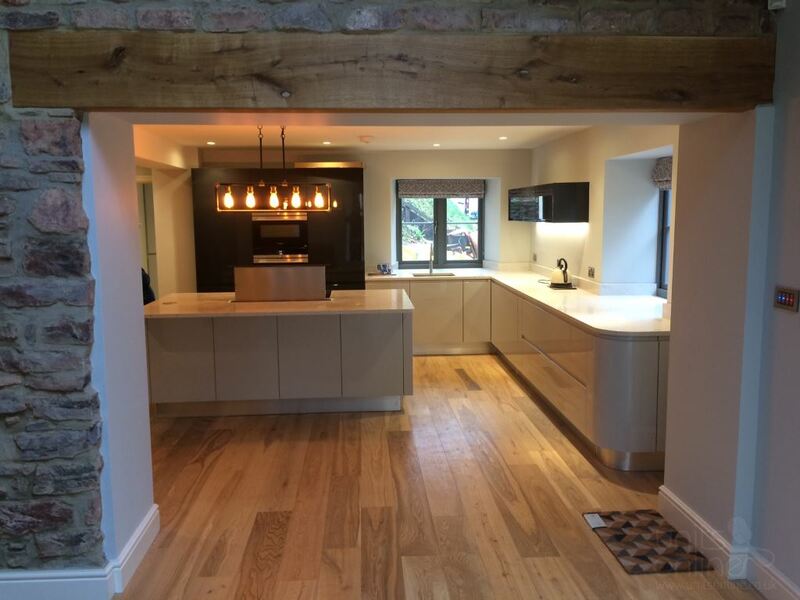 Thank you (and your team) again, from the bottom of our hearts, our kitchen looks AMAZING we absolutely love it. 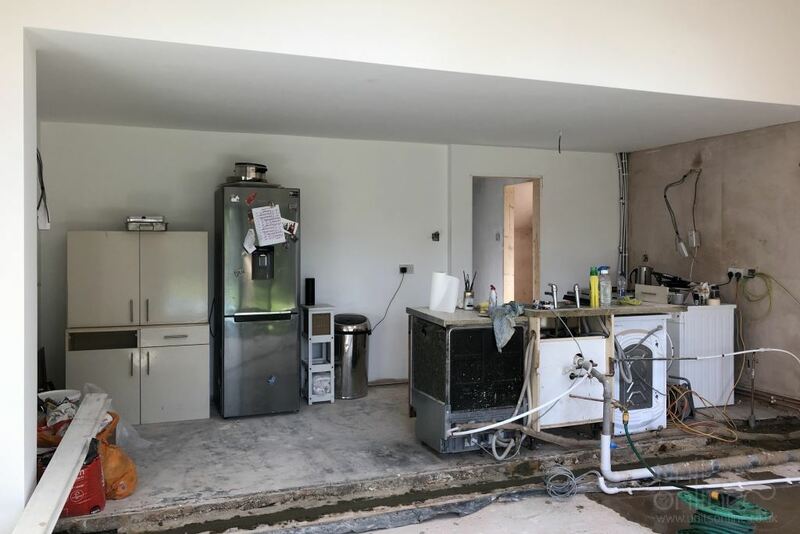 As you can see our kitchen is looking great! 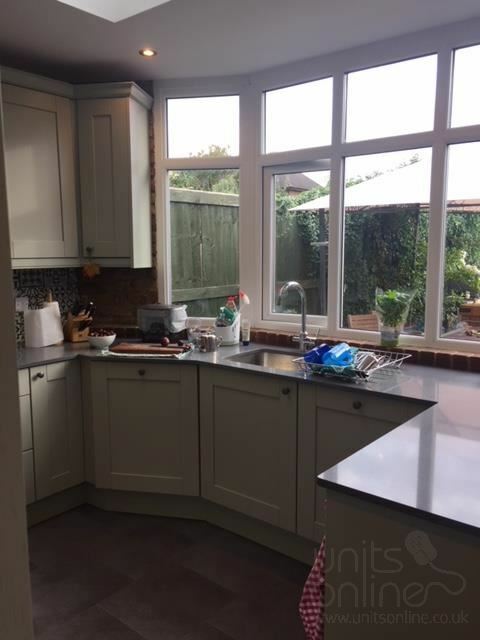 Have just removed all the bubble wrap that has covered it since fitting last year; to give it a good clean and put the final pieces together. 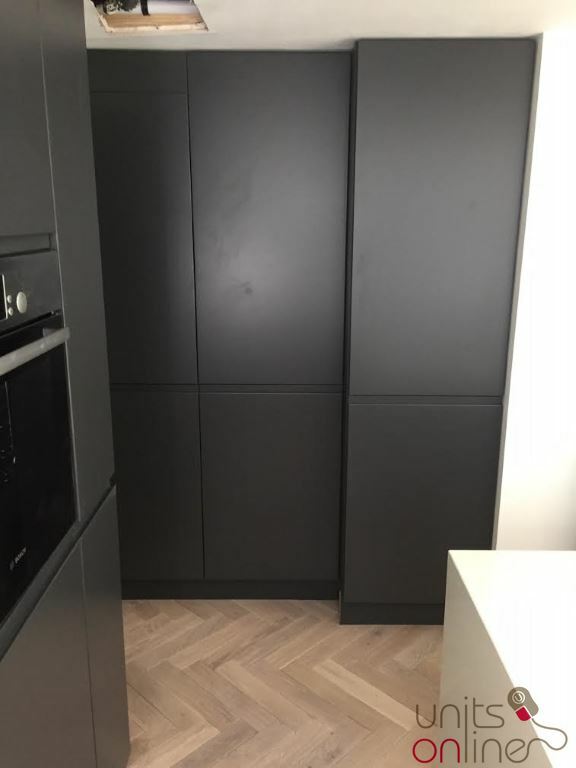 Thanks for your help, as always. 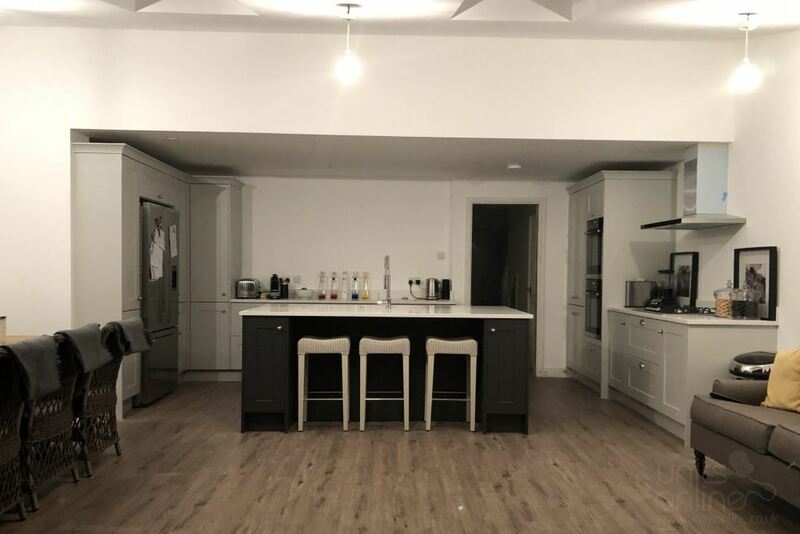 Buying online was a worry for us. 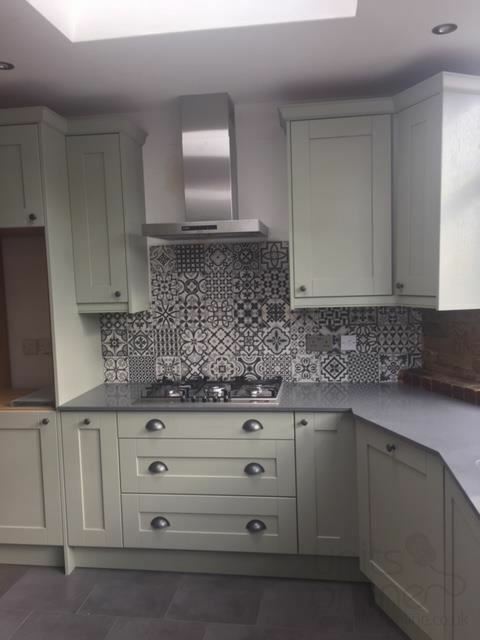 No need to have worried! 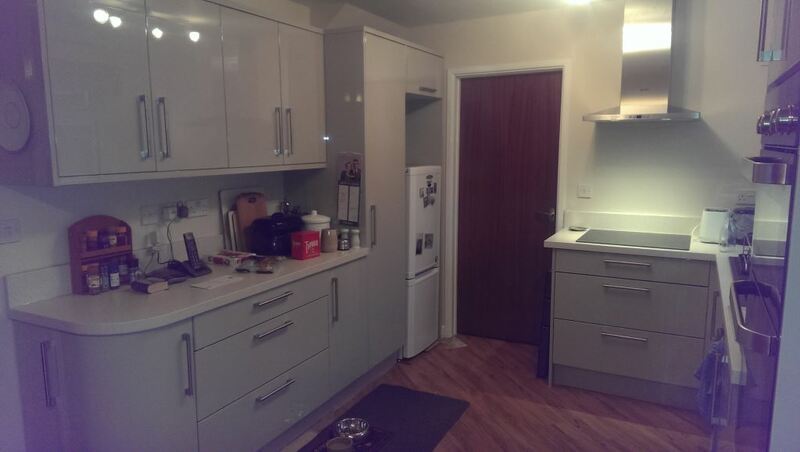 We love our new kitchen. 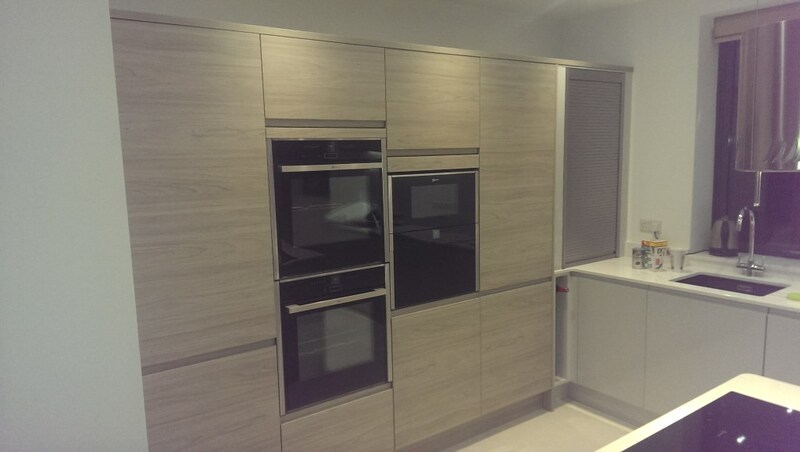 Everything ran as planned and our fitter commented on how impressed he was with the quality of the units. 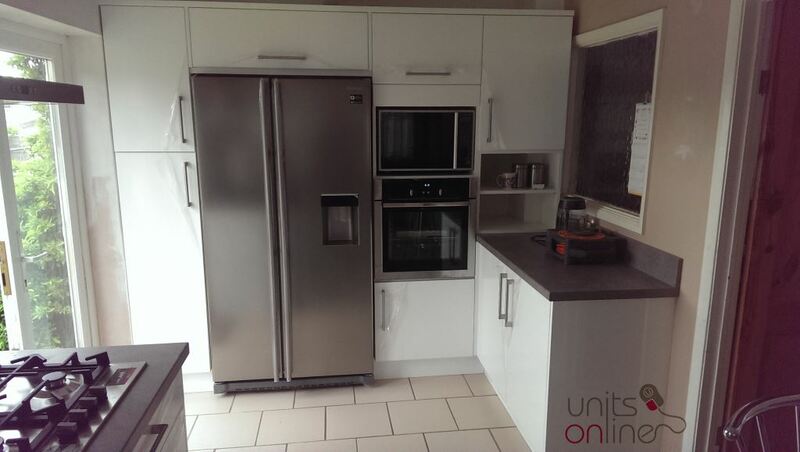 We will certainly be recommending Units Online. 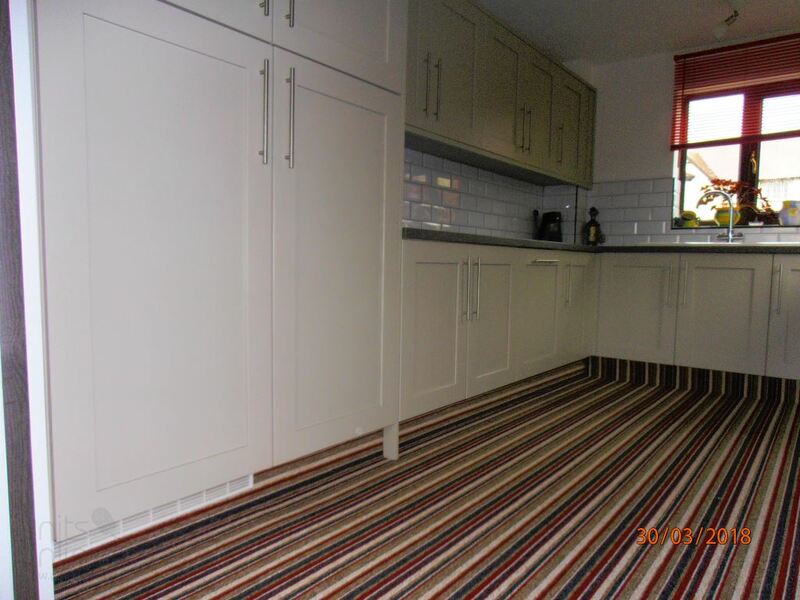 Hi Richard, hope you like the pictures. 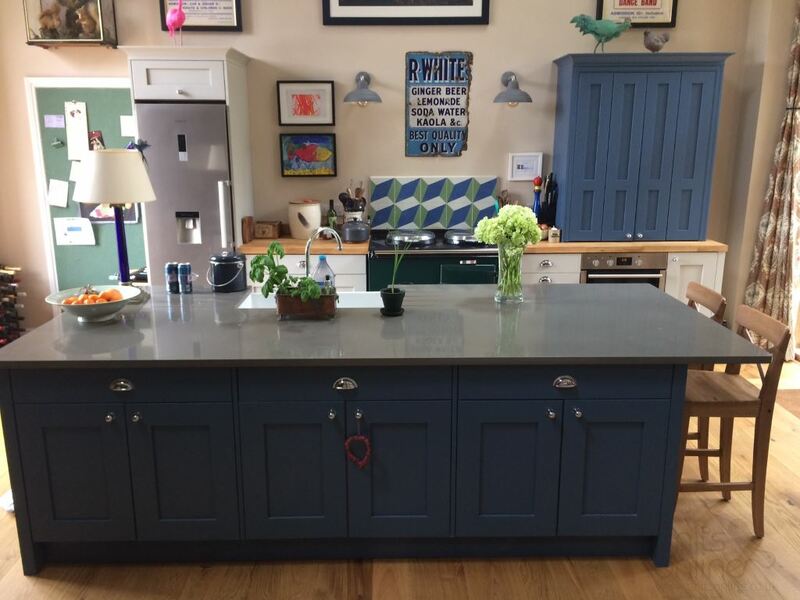 We are absolutely delighted with our kitchen. 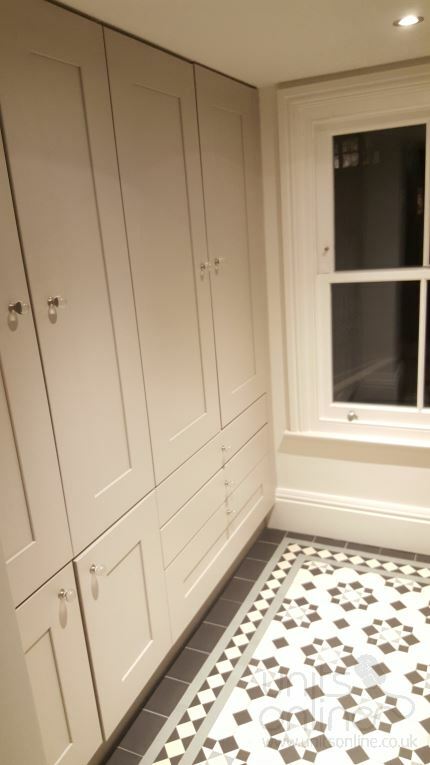 Thanks for all your design advice, we could not have done without you! 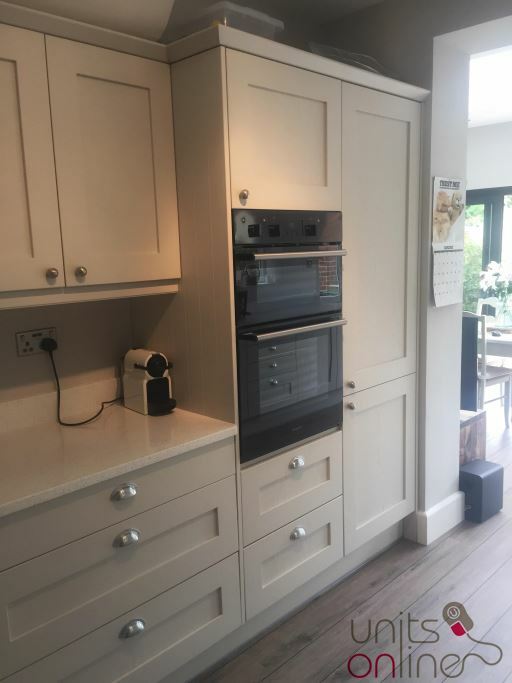 I just wanted to say a really big thank you to Bob for all his great ideas and patience during and after the design of our kitchen. 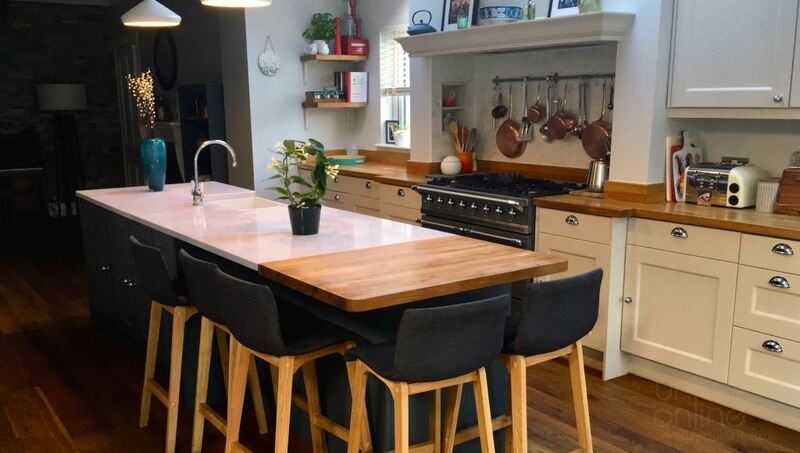 You really did design us our dream kitchen. 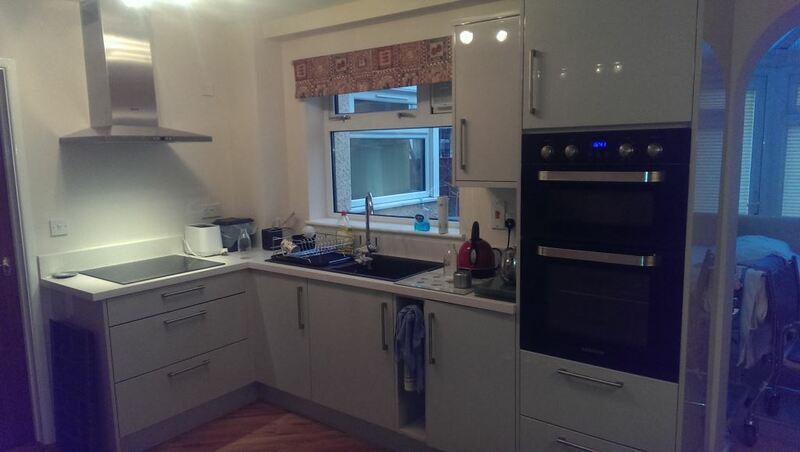 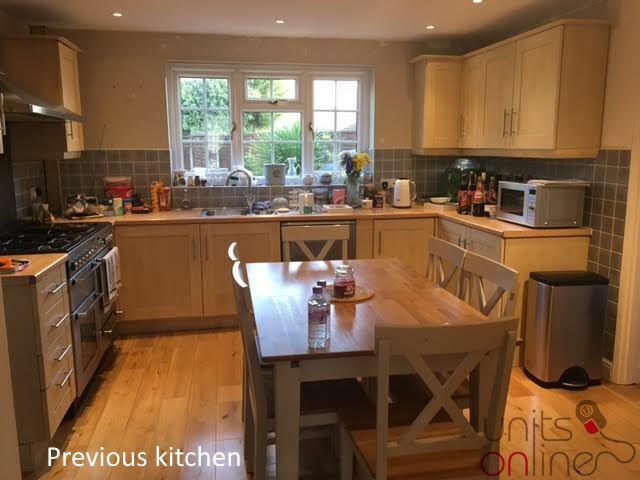 Having priced up the same units elsewhere I know the kitchen was an excellent price. 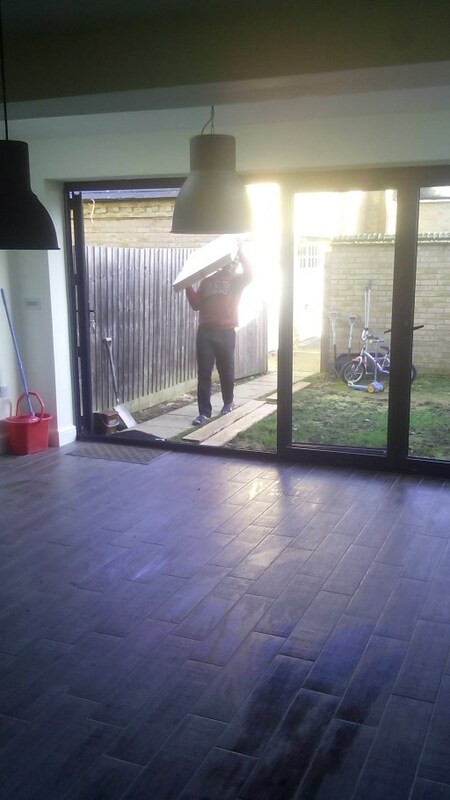 The delivery arrived when promised and the guy was so good. 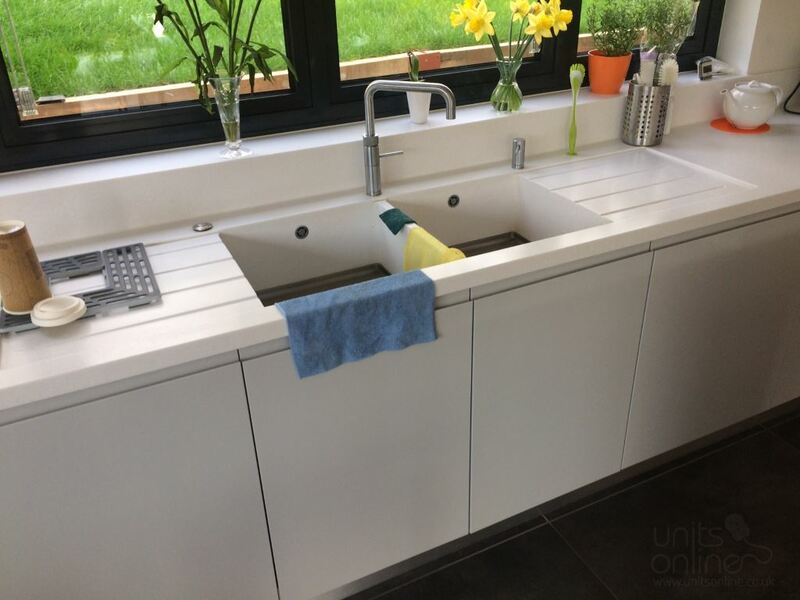 We had a couple of things that needed replacing and these where dealt with quickly and without fuss. 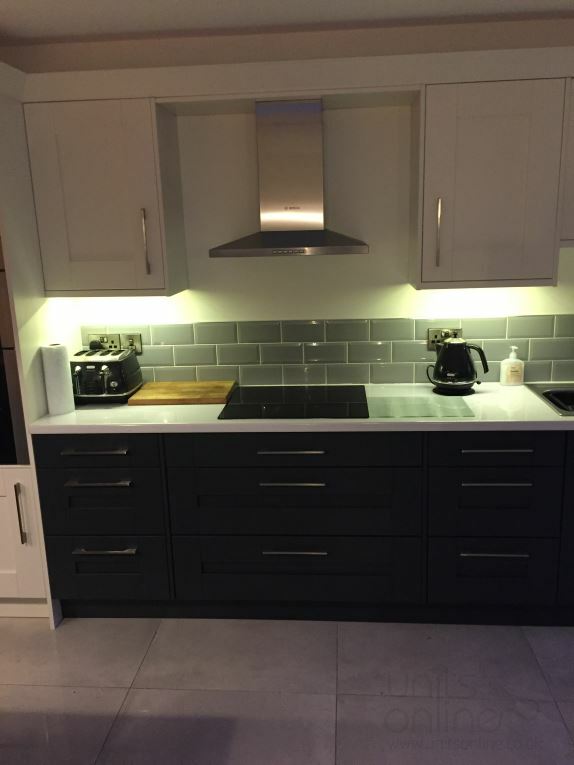 I cannot recommend this company highly enough. 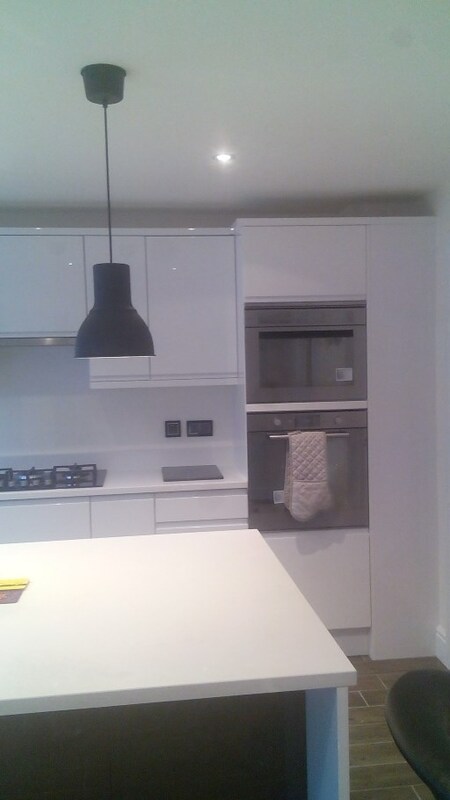 Thanks again to all of you. 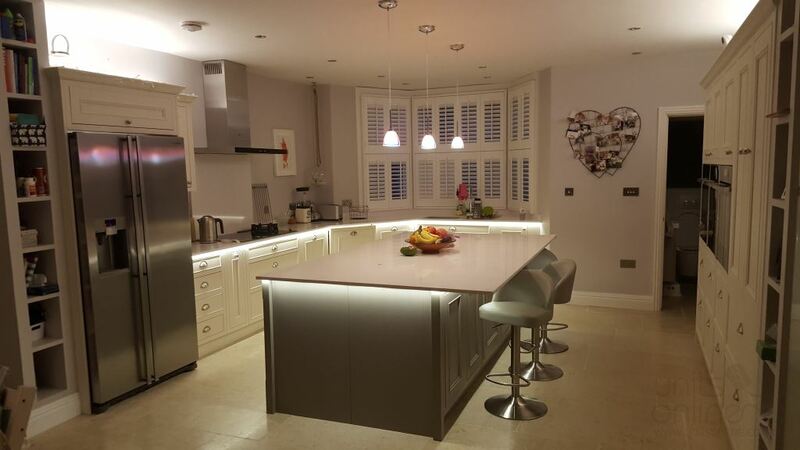 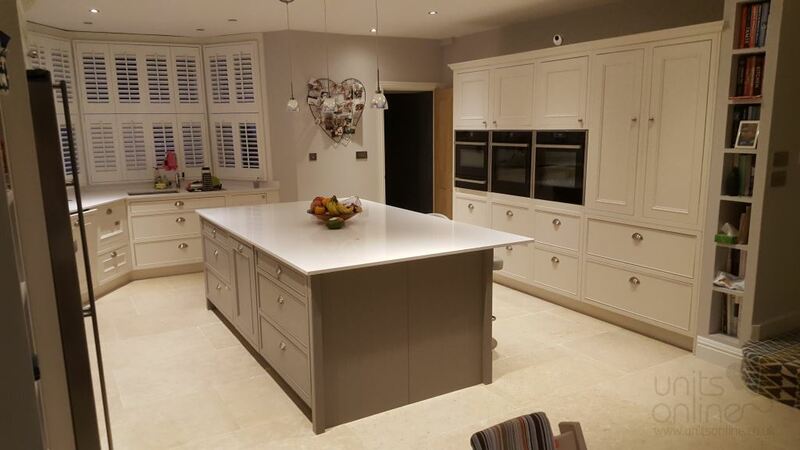 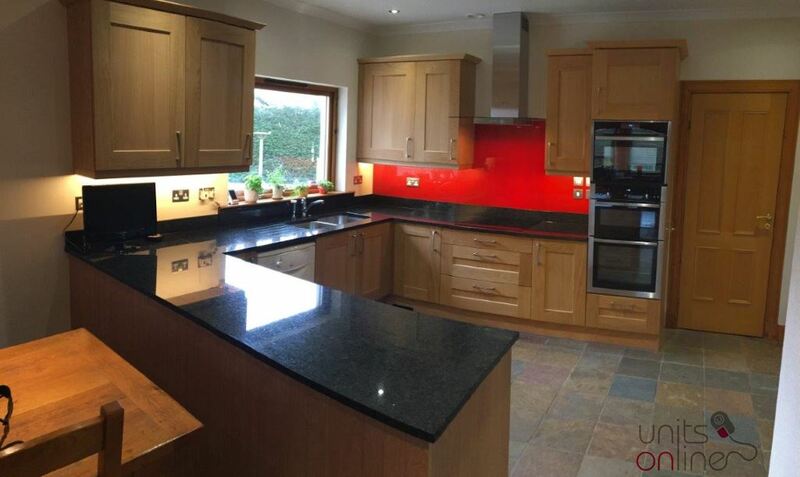 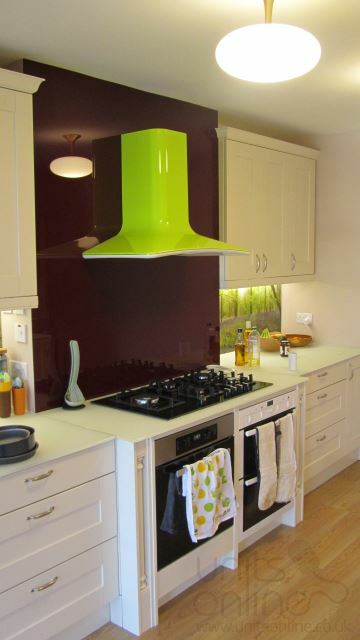 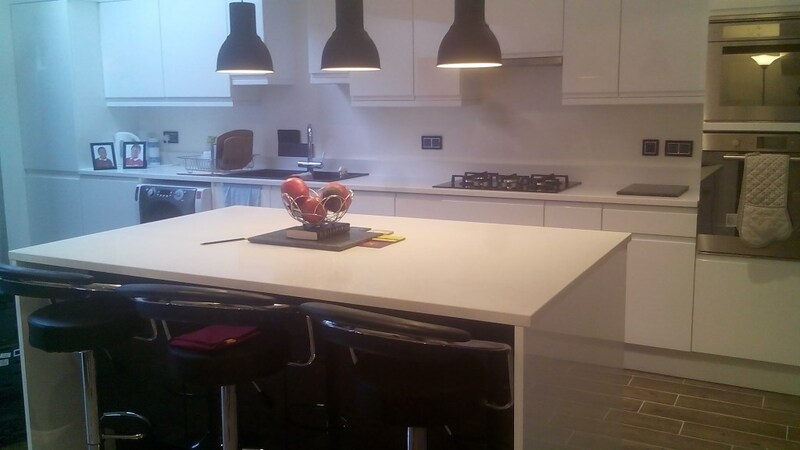 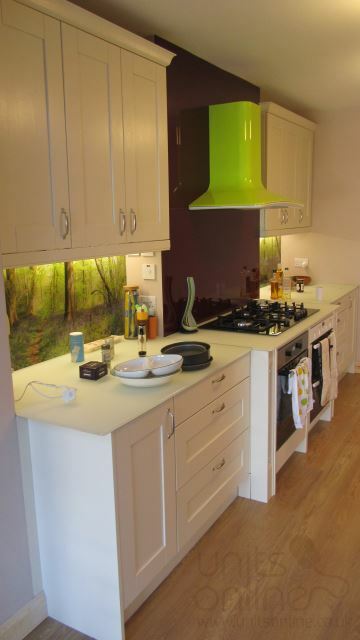 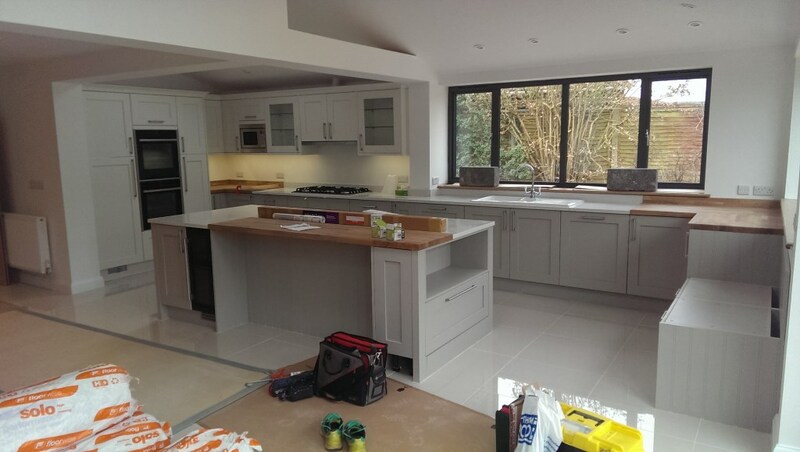 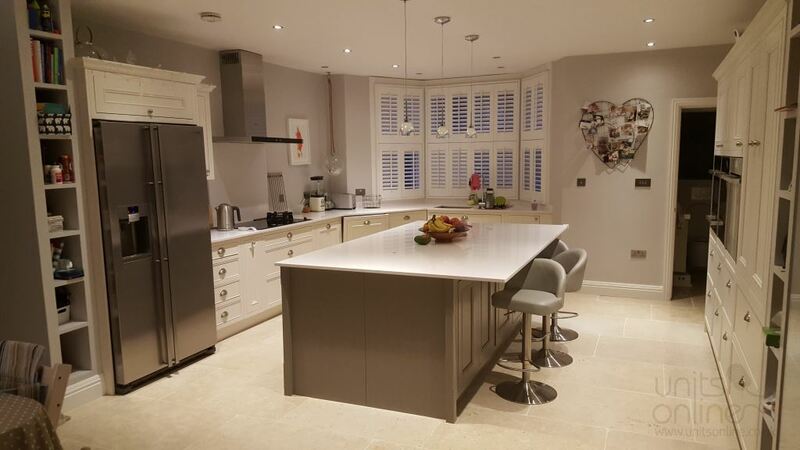 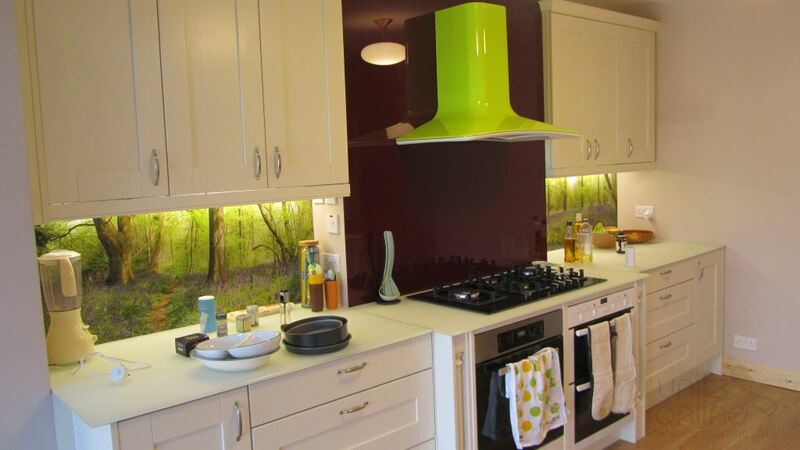 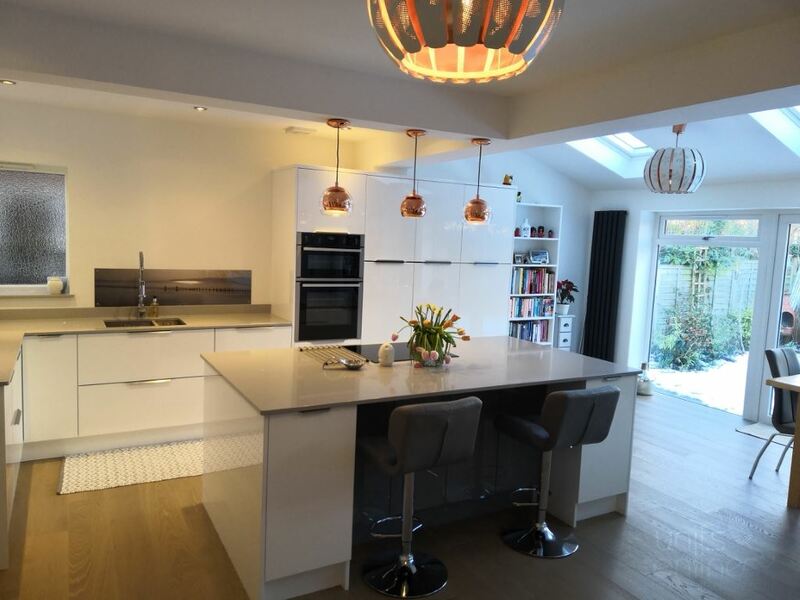 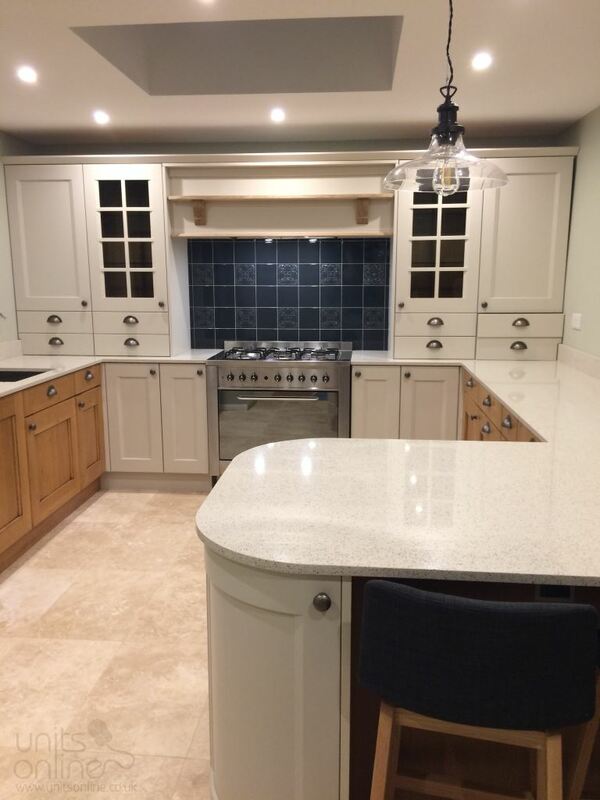 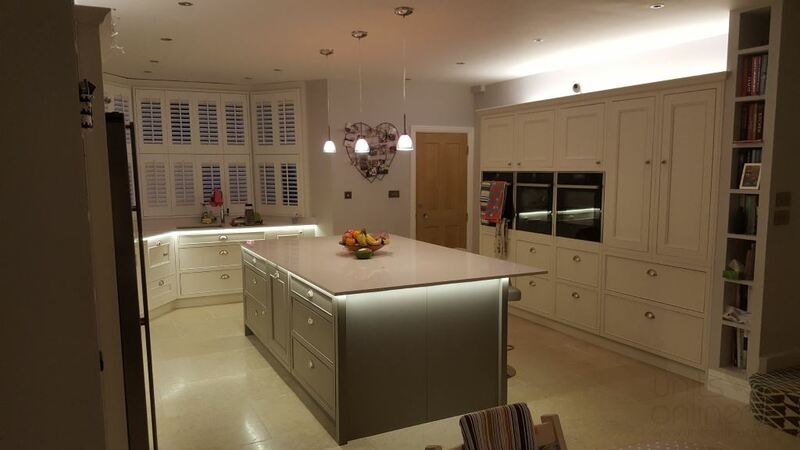 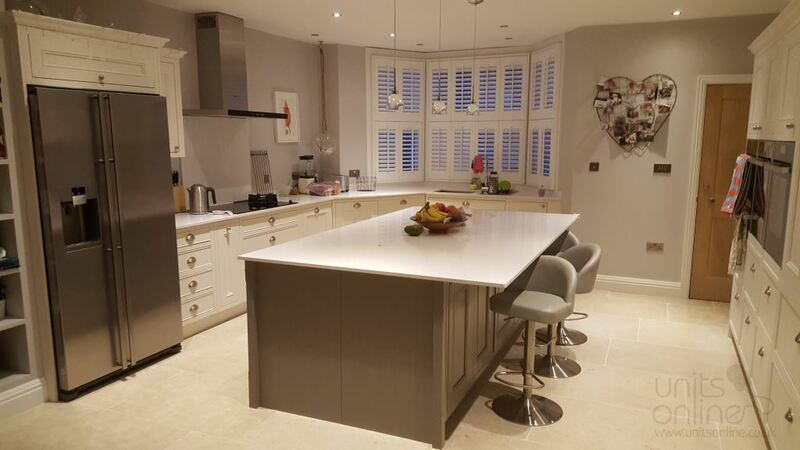 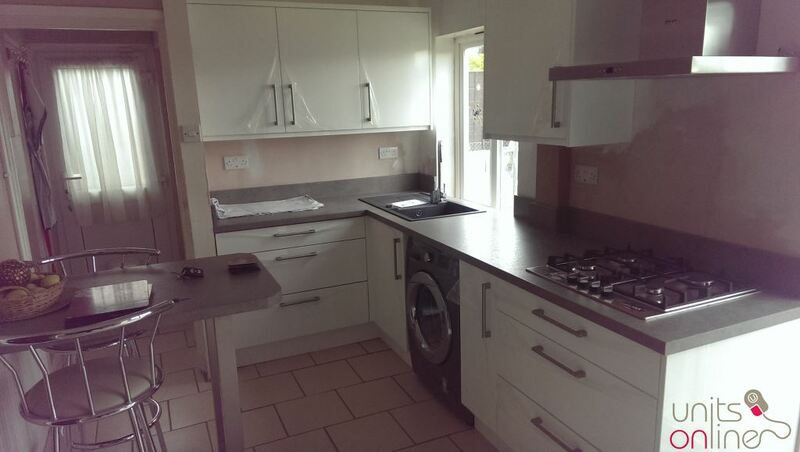 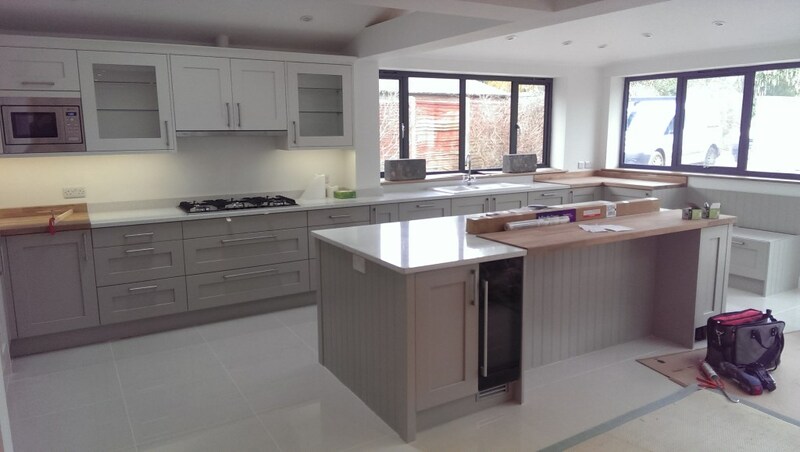 “Working with Tony at the initial stages of our kitchen and rear extension concept design was excellent. 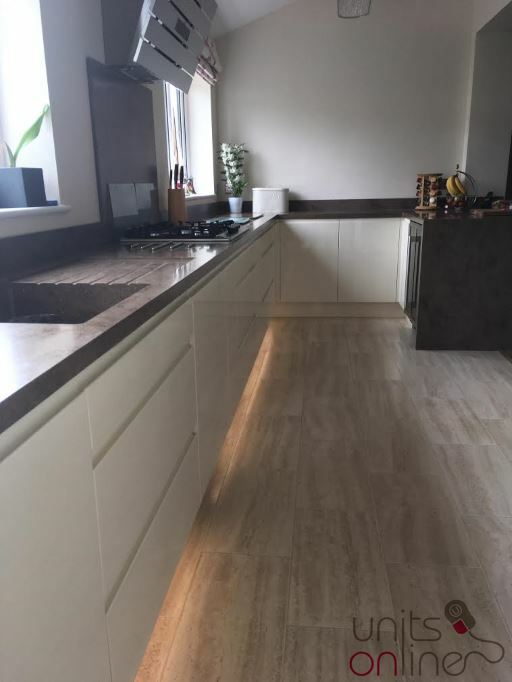 It brought his added value in the technical refinement of our desires and requirements, resulting in a perfect solution for our family kitchen/diner. 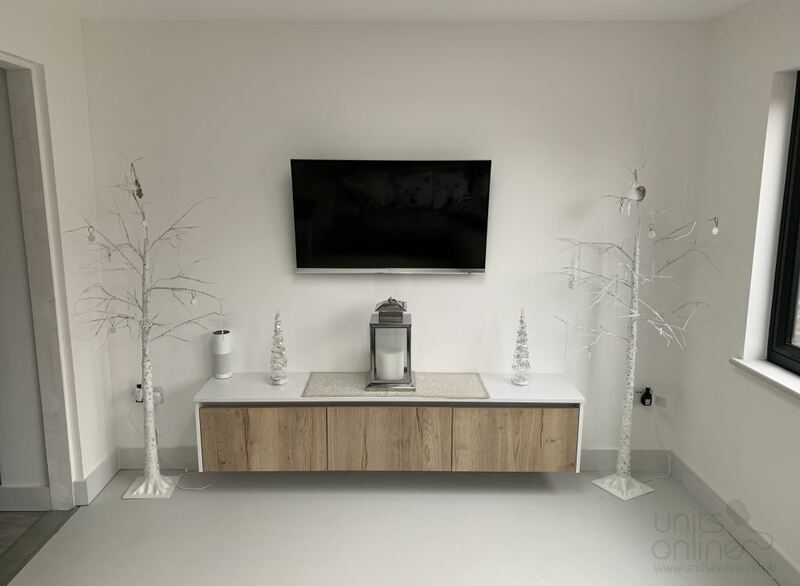 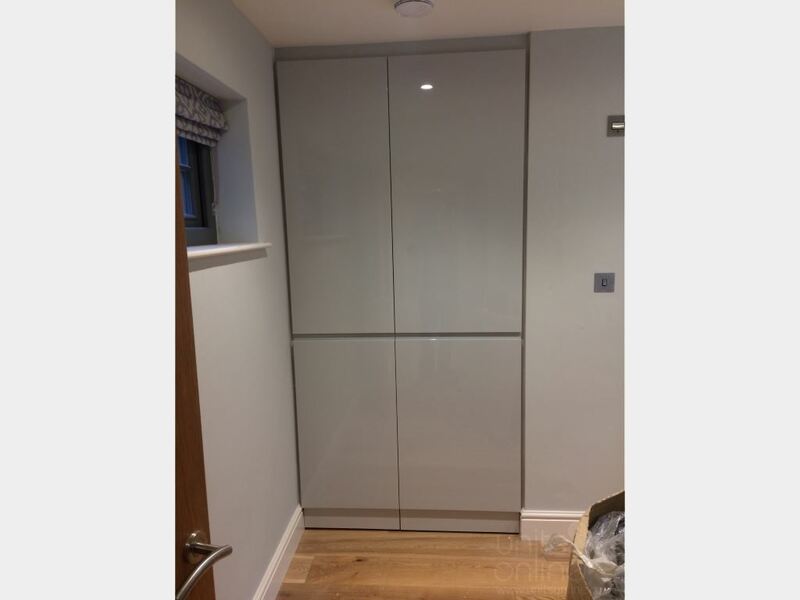 The delivery of the units was well organised and Units Online were very accommodating with great communications that allowed for the delivery to commence at a point where the new room was ready to store, before being fitted. 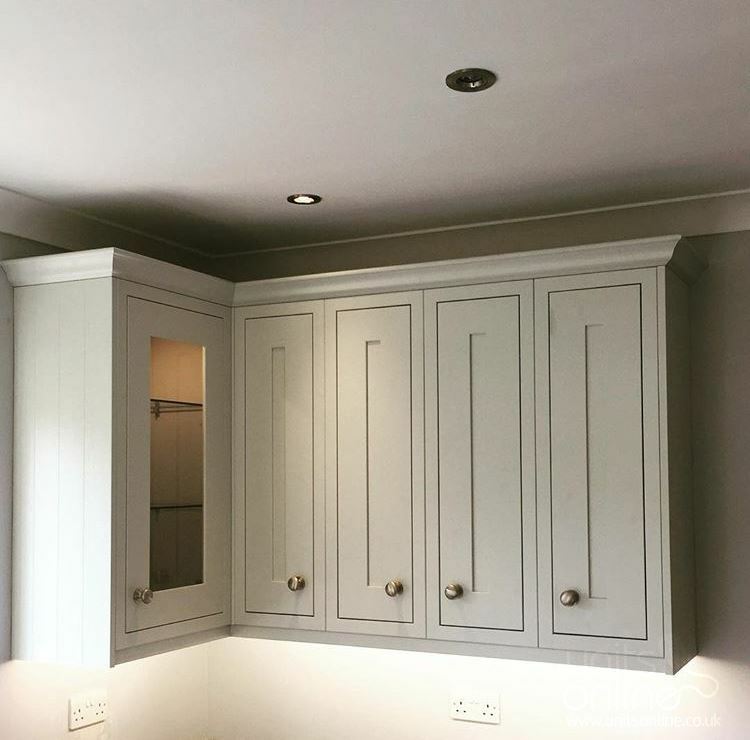 This removed a huge amount of stress from the overall project and is something that may not have been possible with another supplier. 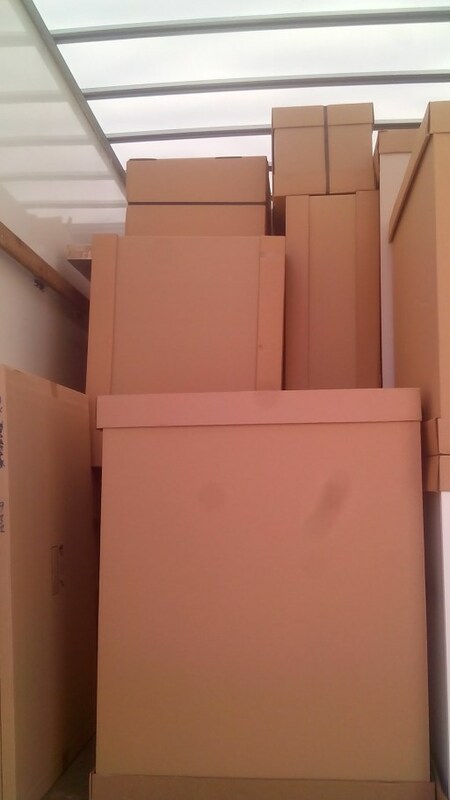 I certainly appreciated the patience and support of the warehouse/delivery team through that period. 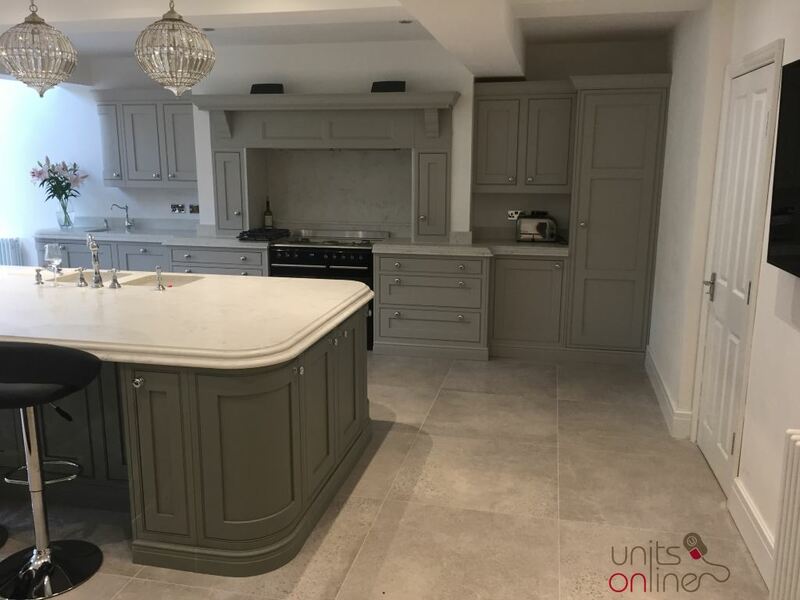 Completing the works myself I was also grateful for the ongoing support from the Units Online team who were always willing to assist in running through fit out options before elements were finally placed and attached. 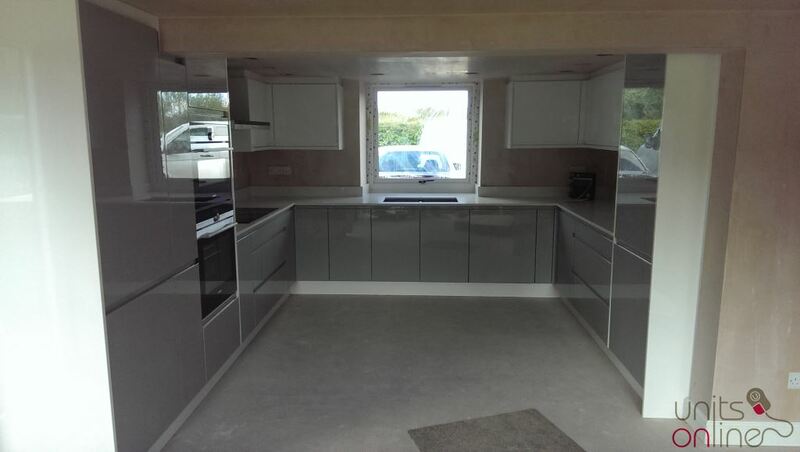 “We collected the units in a hire van and I had a little wobble that the van was not big enough. 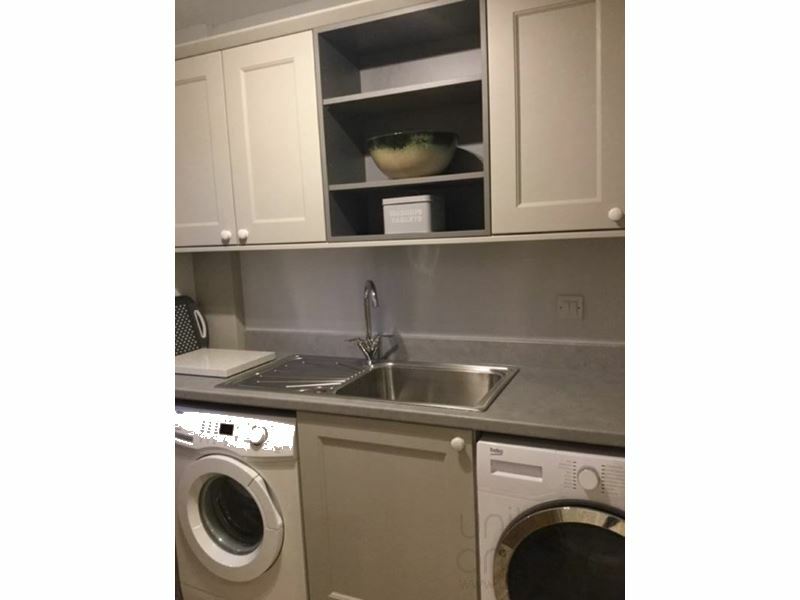 The guys in the warehouse were great at loading and you were spot on with your suggested van size. 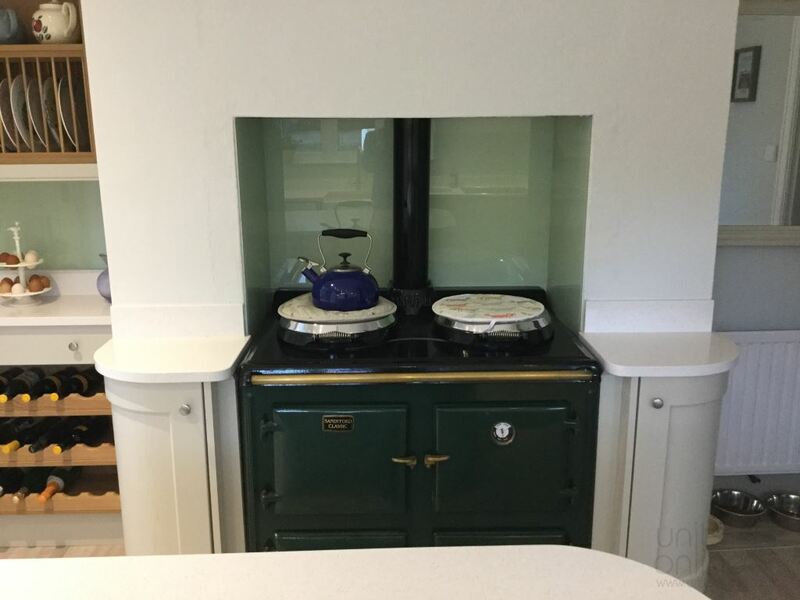 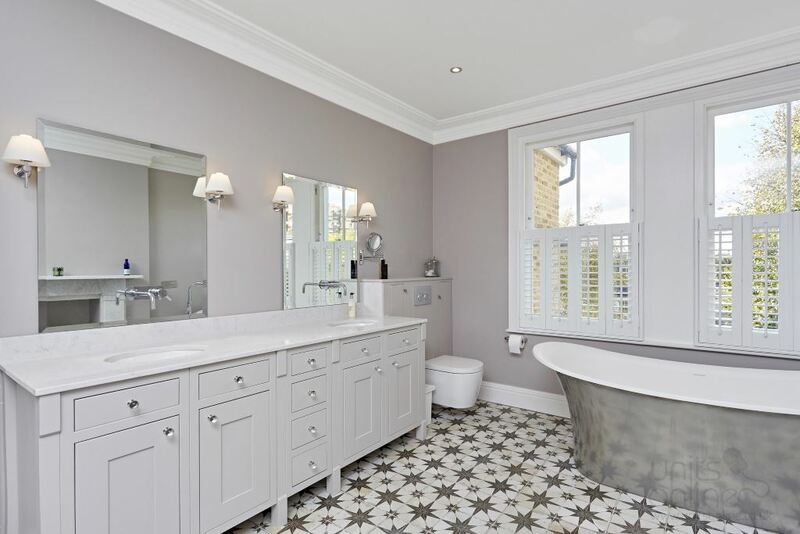 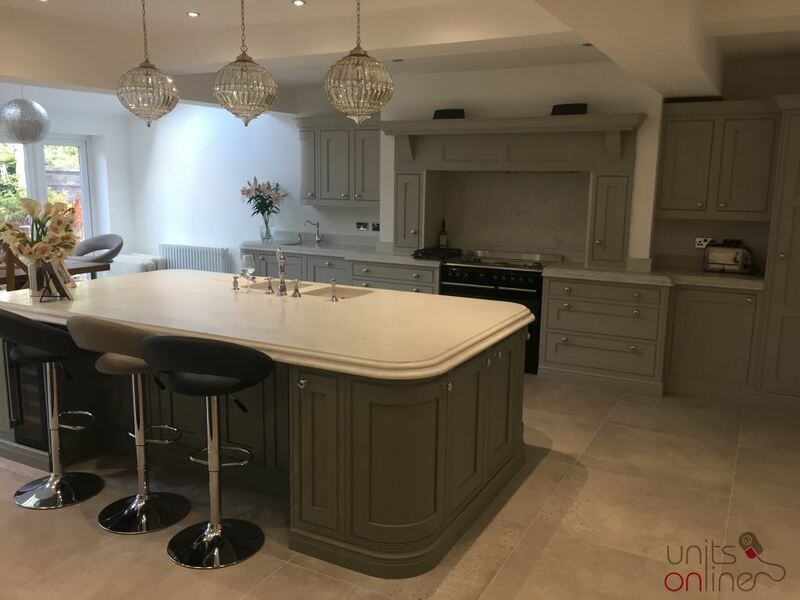 “I found Units Online through Google and was delighted to find that they are only an hour and a half away, so we went to meet with Richard and look at the showroom. 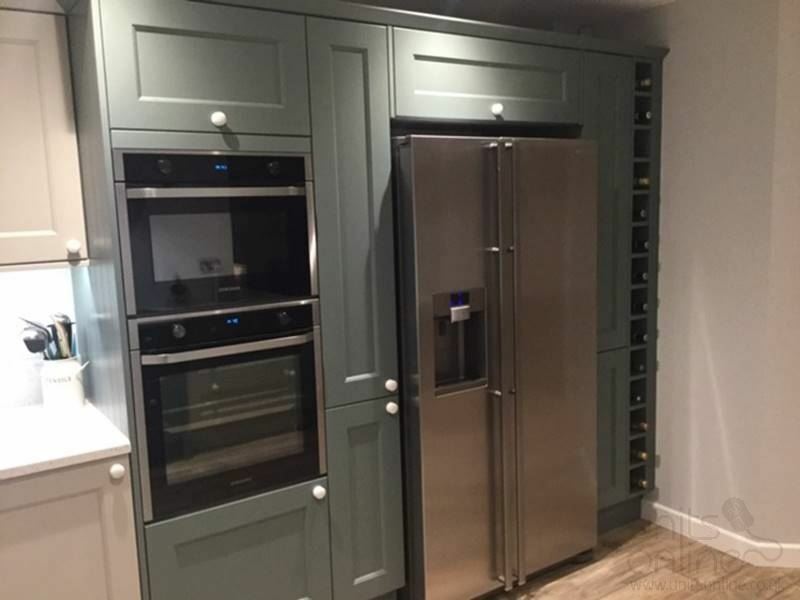 Seeing the doors and colours in the flesh was a real help in making our choices, and once we had seen the new thyme and soft grey shades we were sorted. 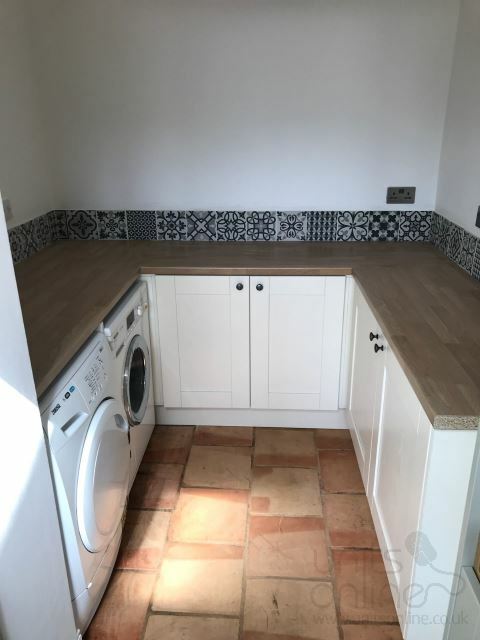 I already had a good idea of the layout I wanted, but was daunted about the fine tuning and Richard drew up a great plan for us, covering all the details about space for the fridge freezer, end panels, cornicing etc. 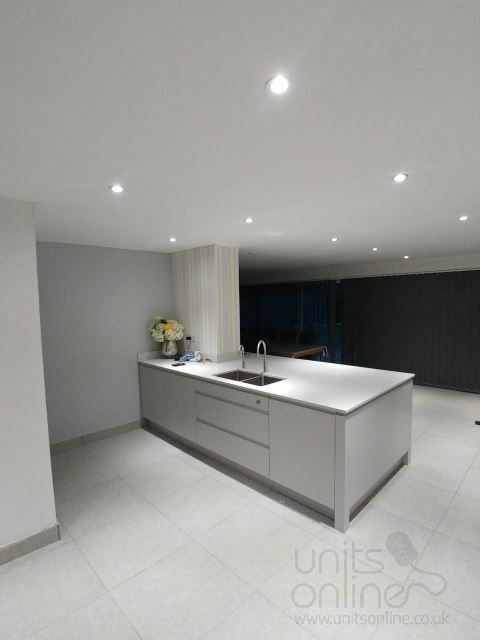 The computerised images were a big help with trying to visualise the finished kitchen, and the final result is testament to that. 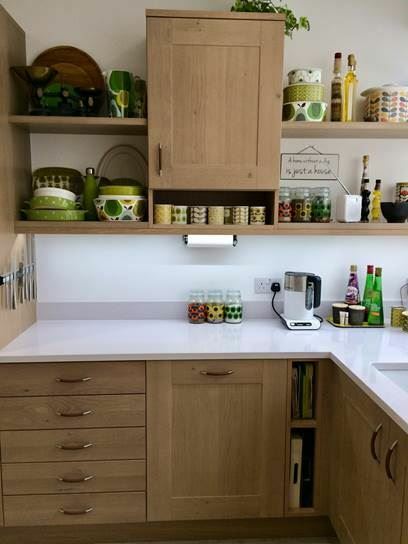 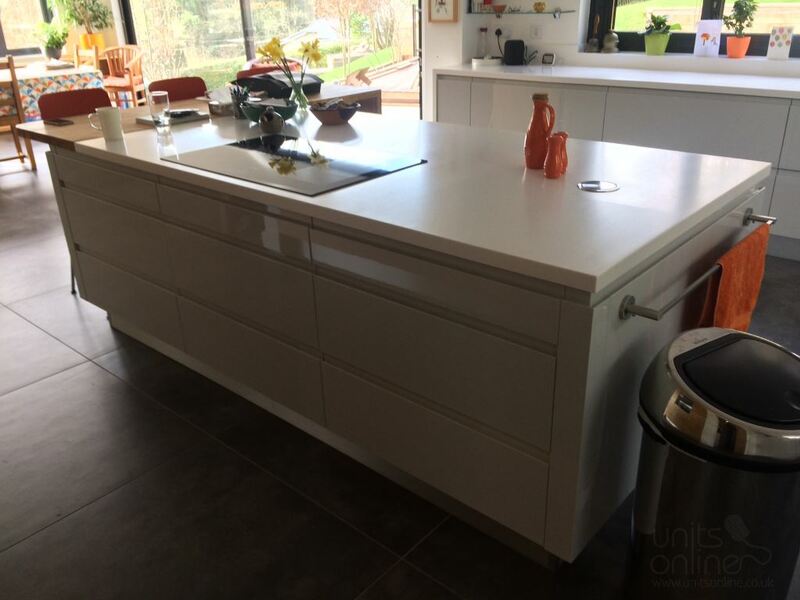 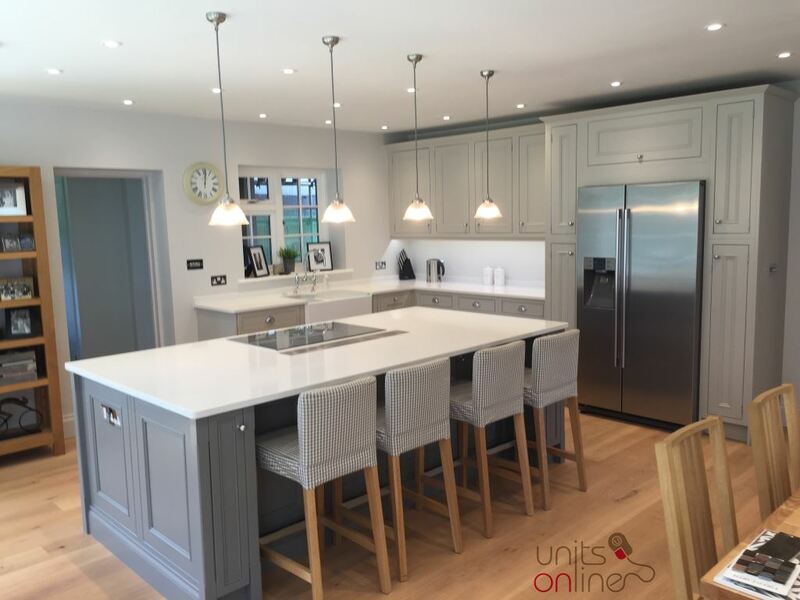 Units Online gave us all the advantages of great value, ready assembled units but with all the professional backup of a designer kitchen supplier. 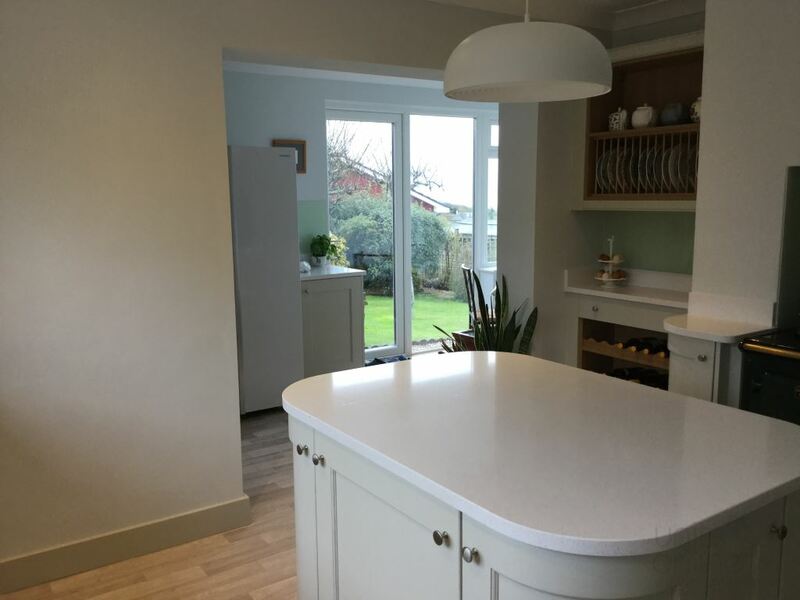 Special mention must go to Andy who delivered the kitchen efficiently and pleasantly, Russell who gave great after sales assistance on a door which was damaged and a filler panel which was missing, and Lois who managed to solve the mystery of the fixing of the carousel hinge! 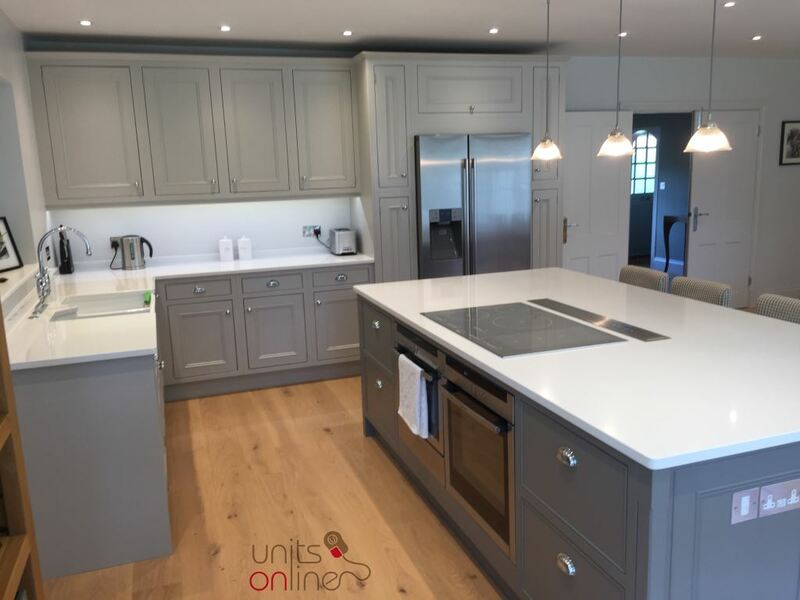 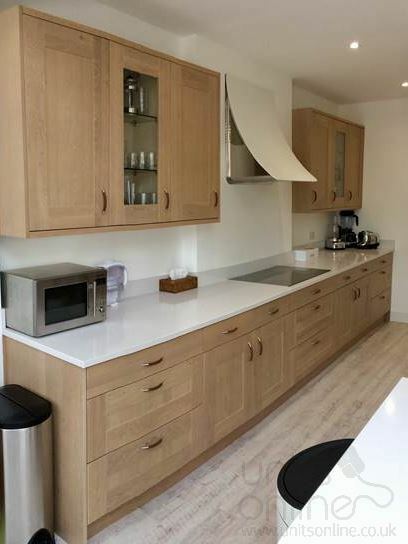 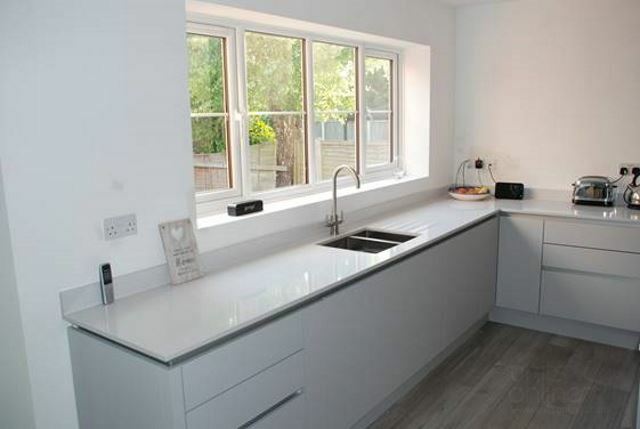 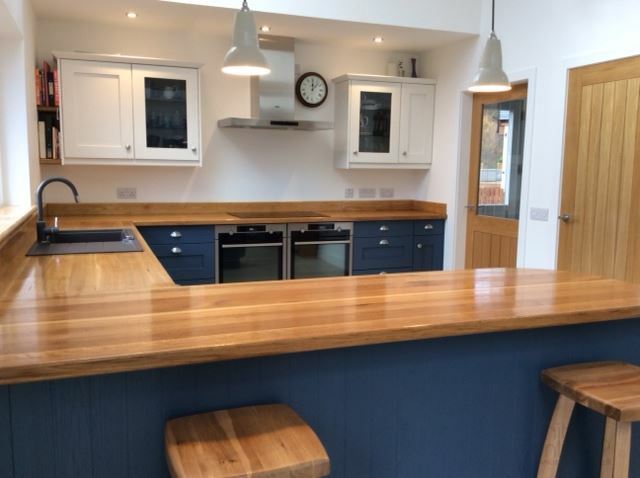 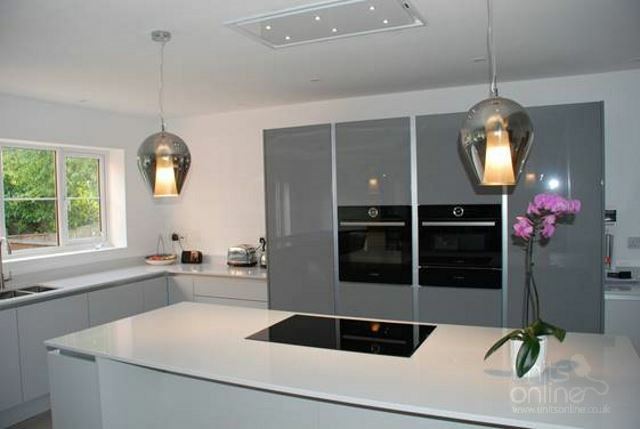 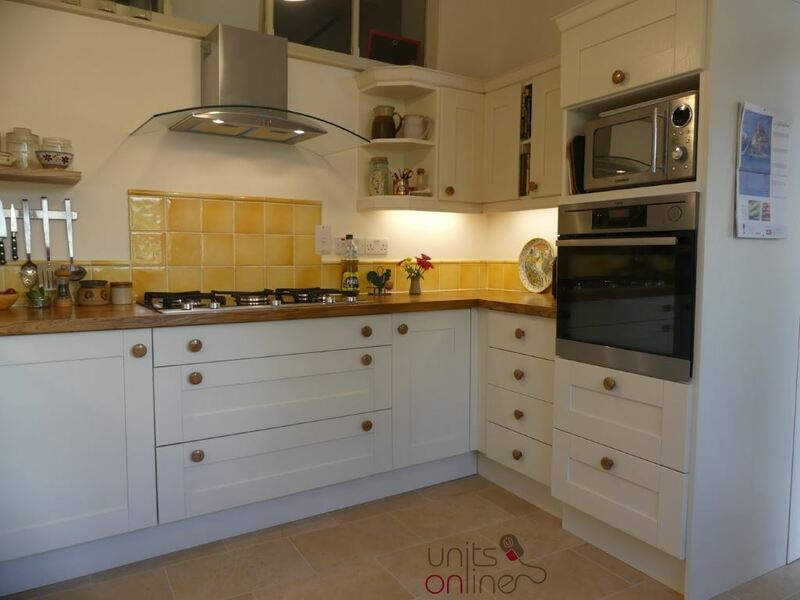 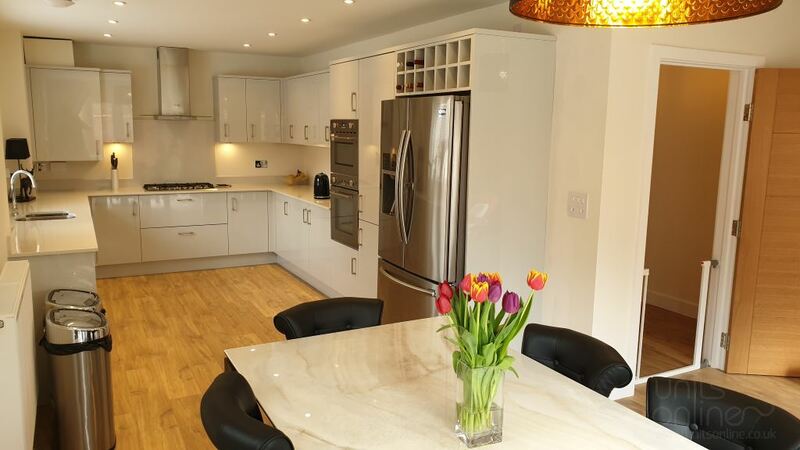 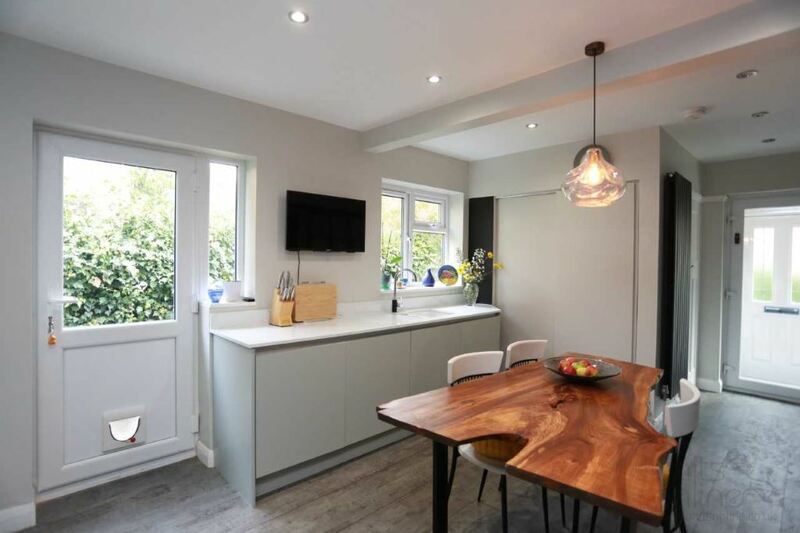 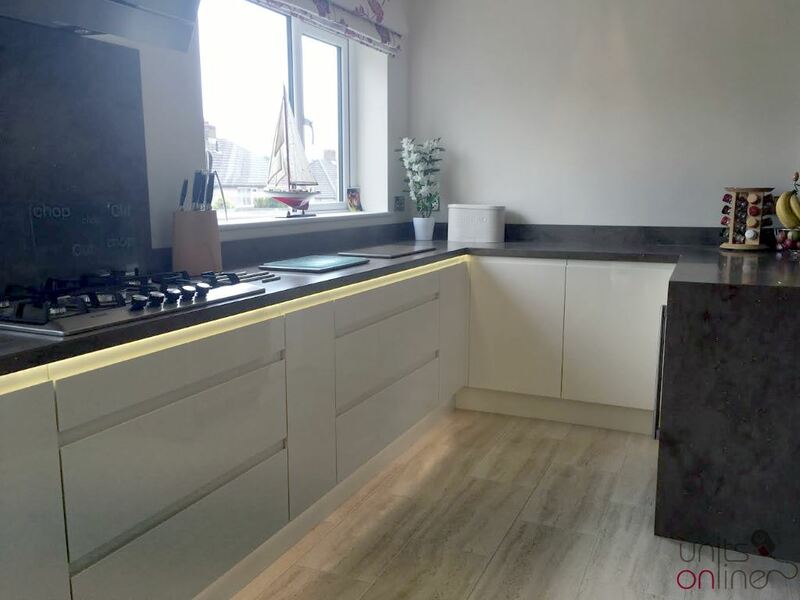 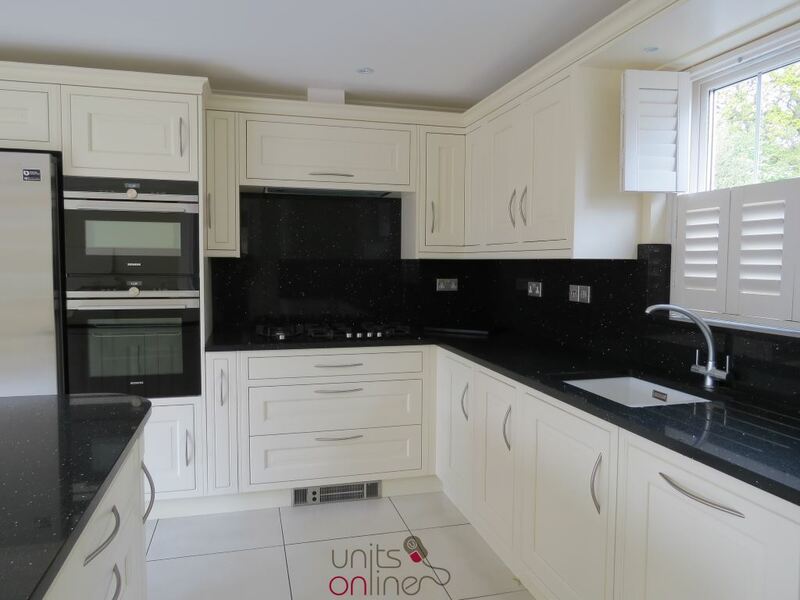 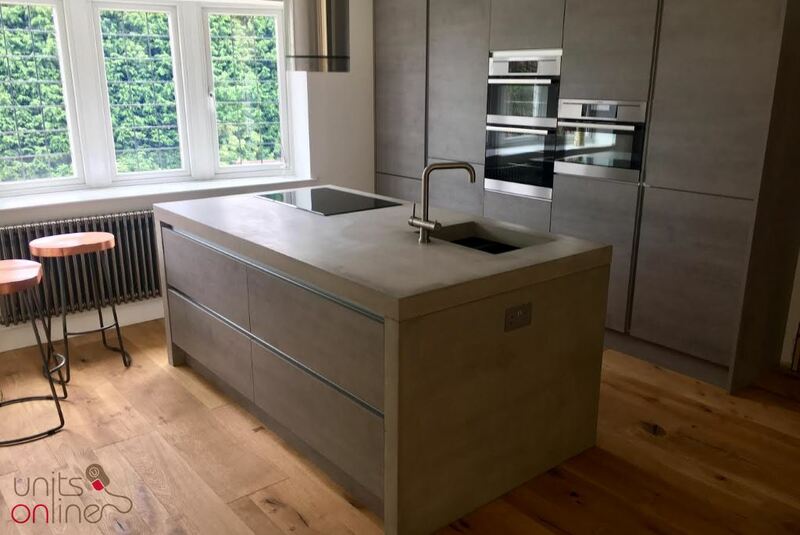 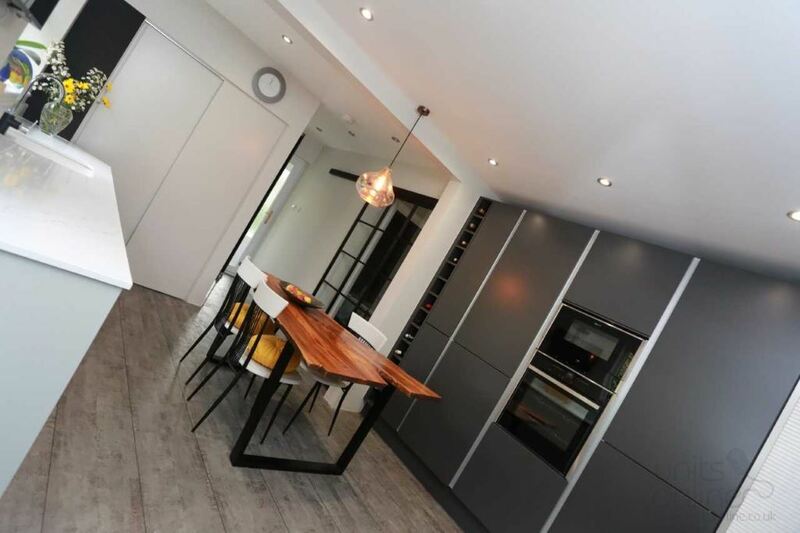 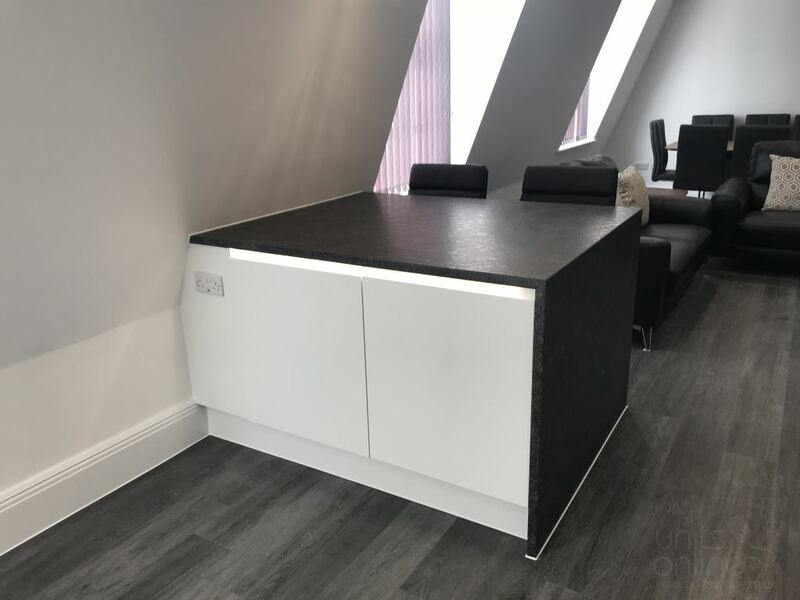 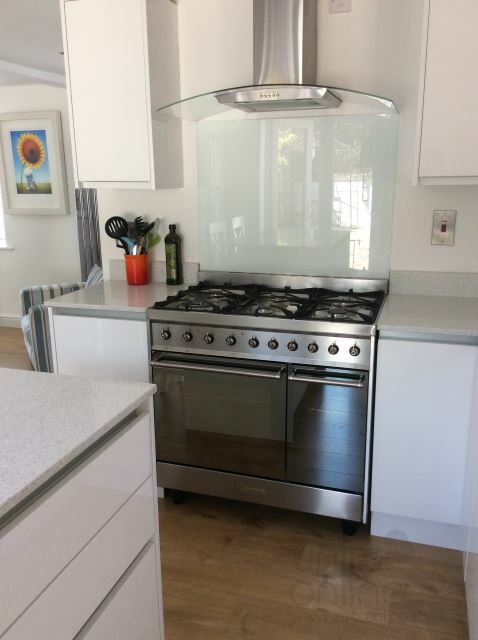 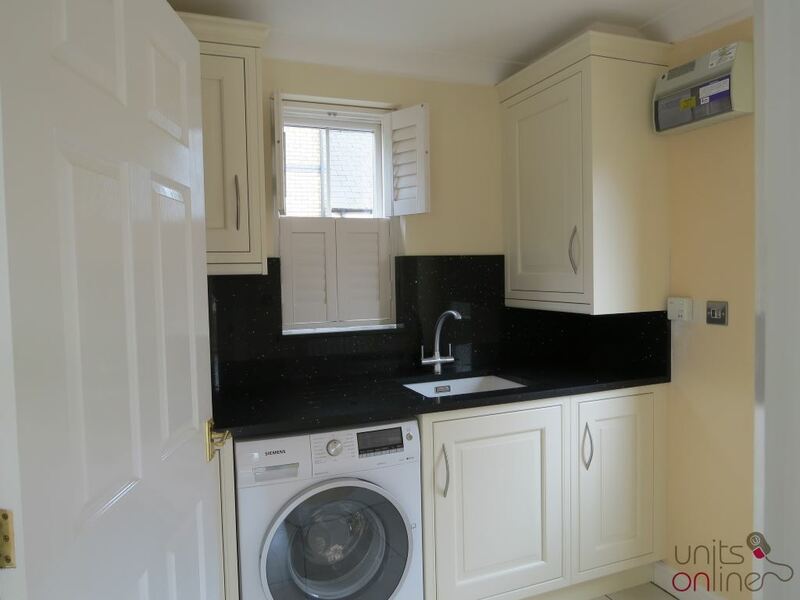 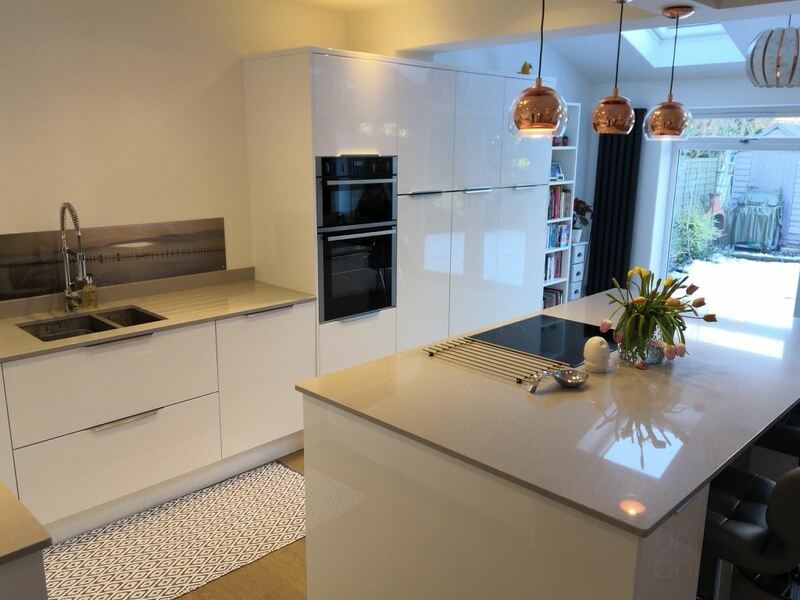 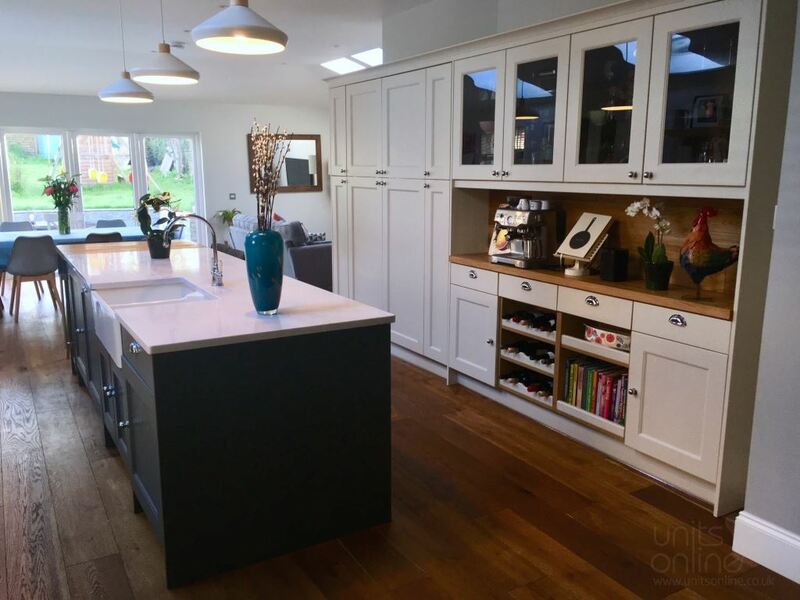 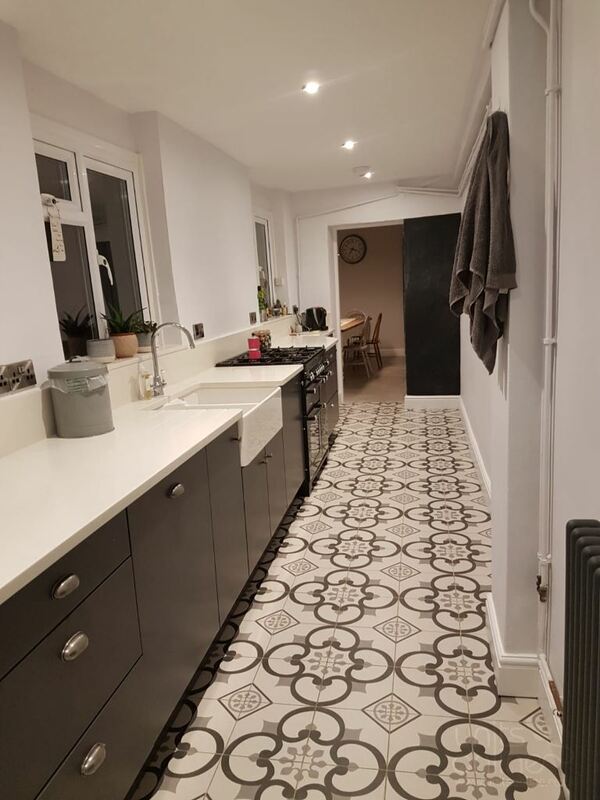 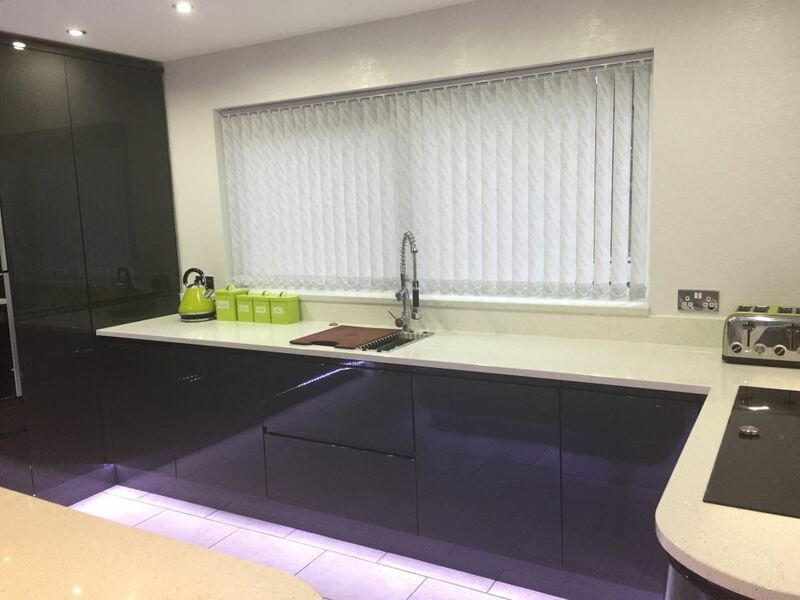 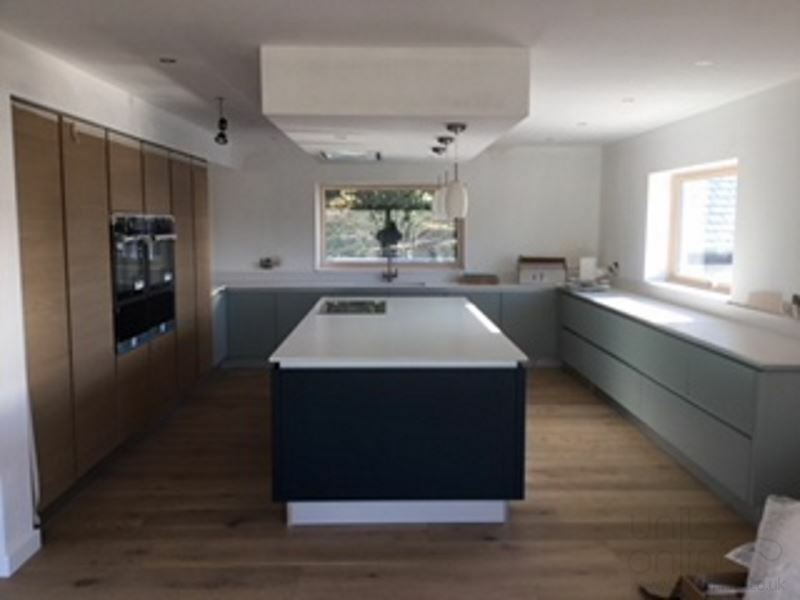 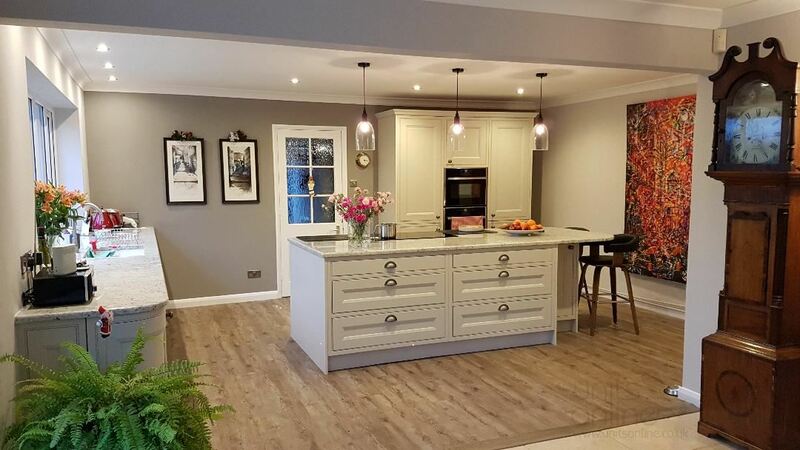 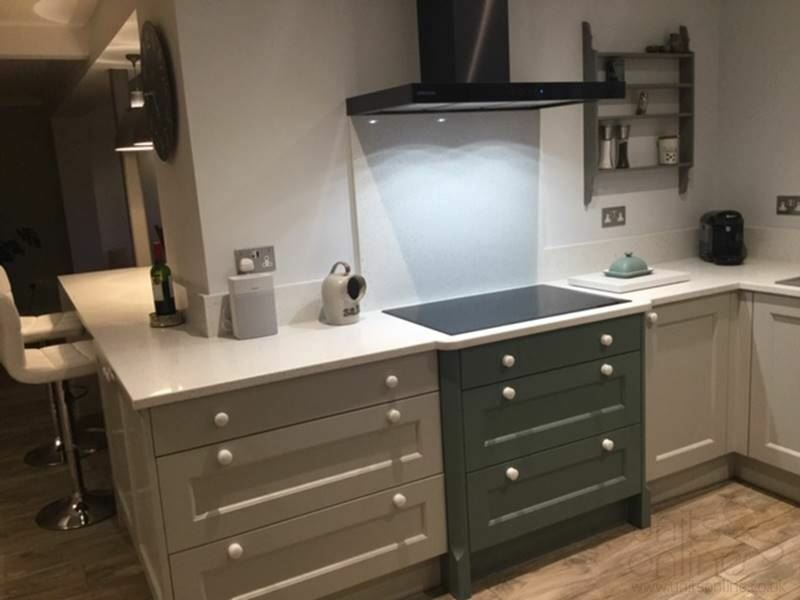 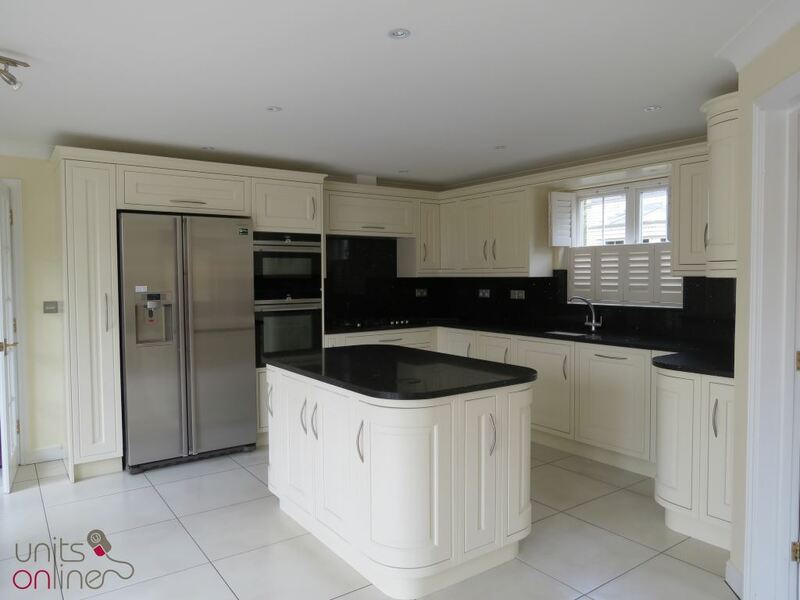 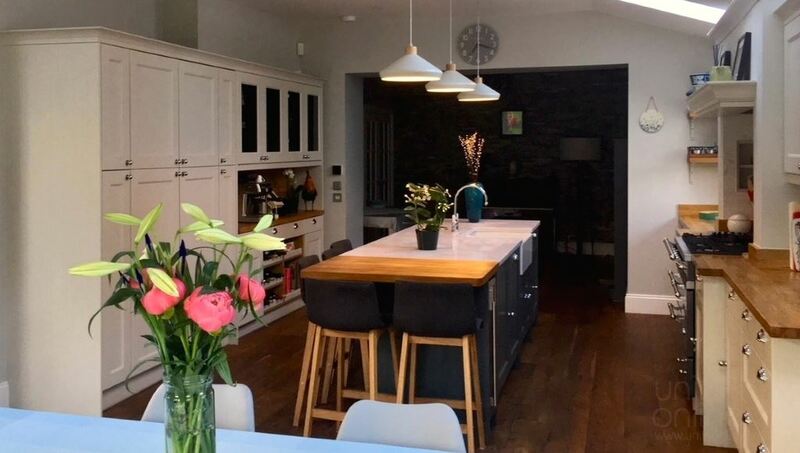 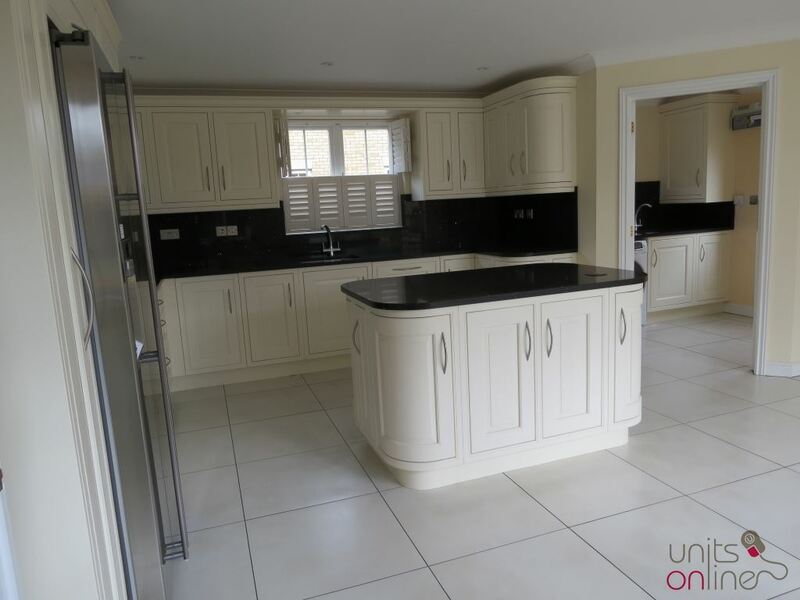 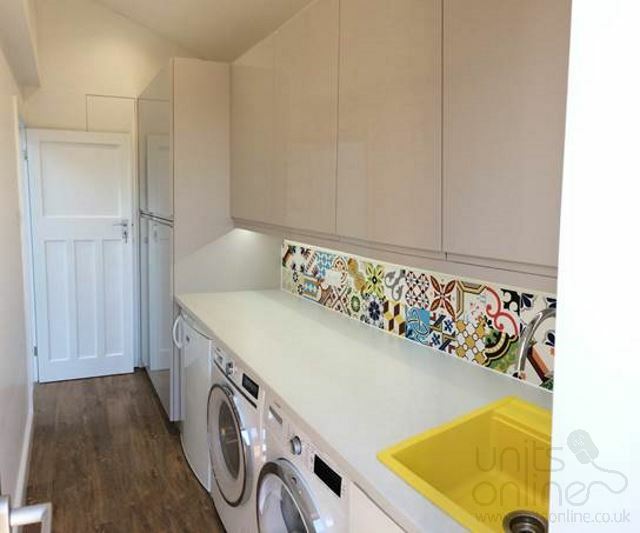 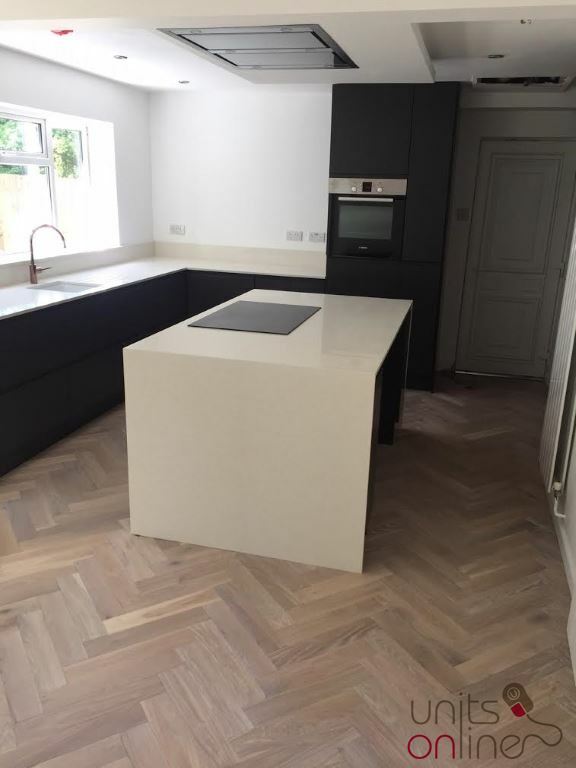 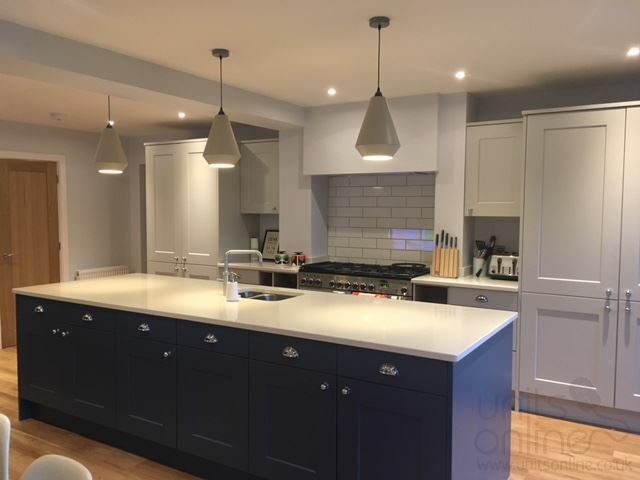 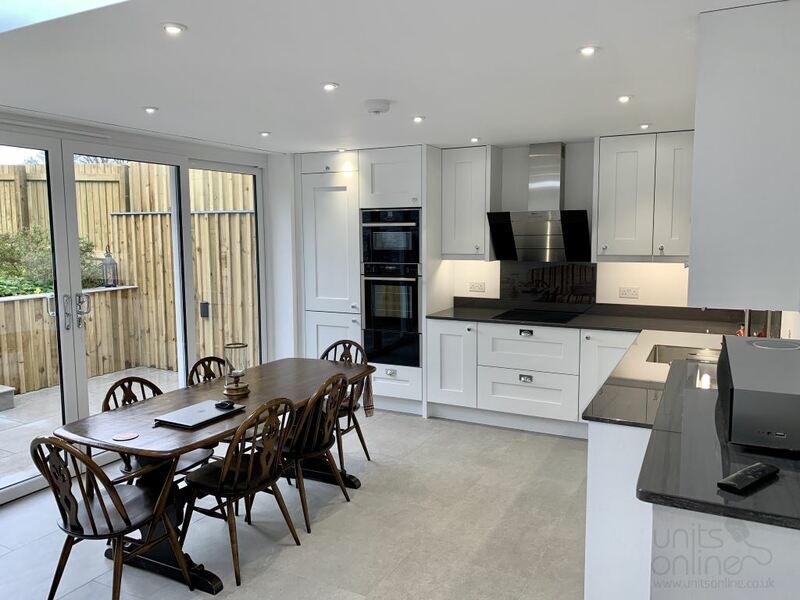 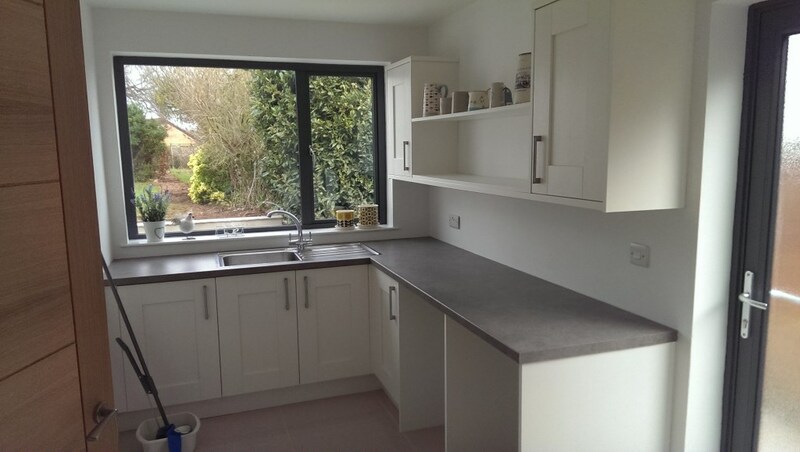 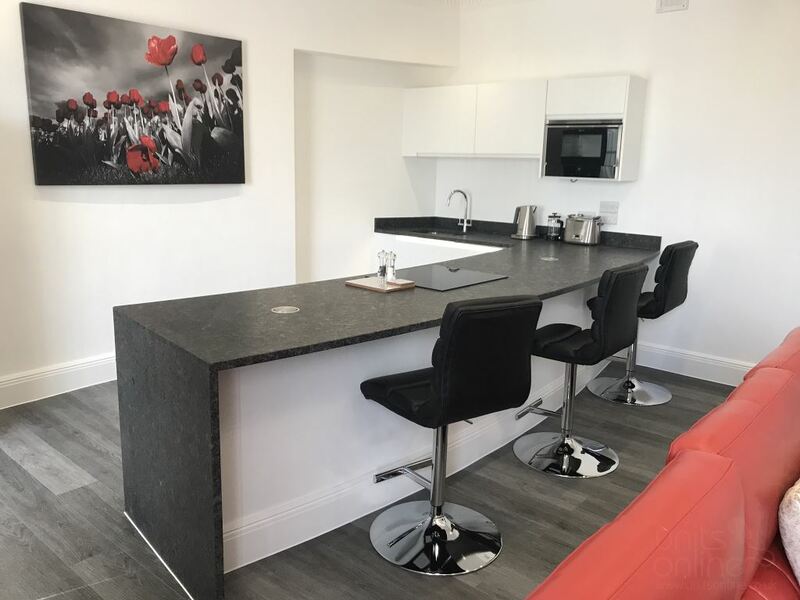 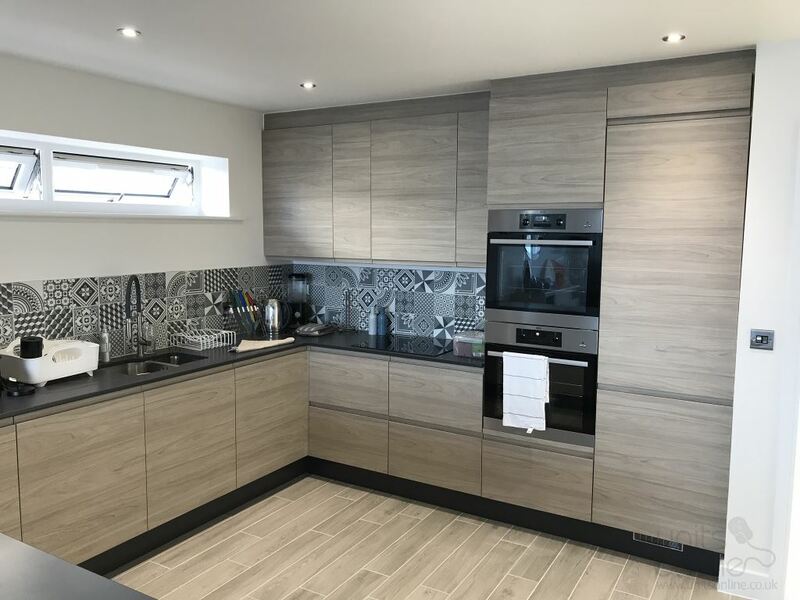 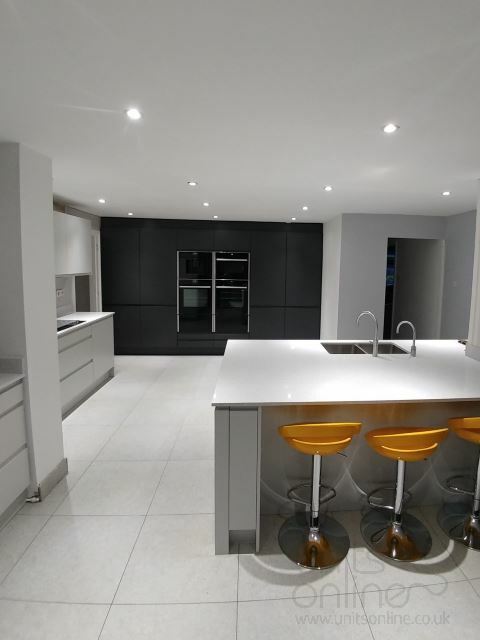 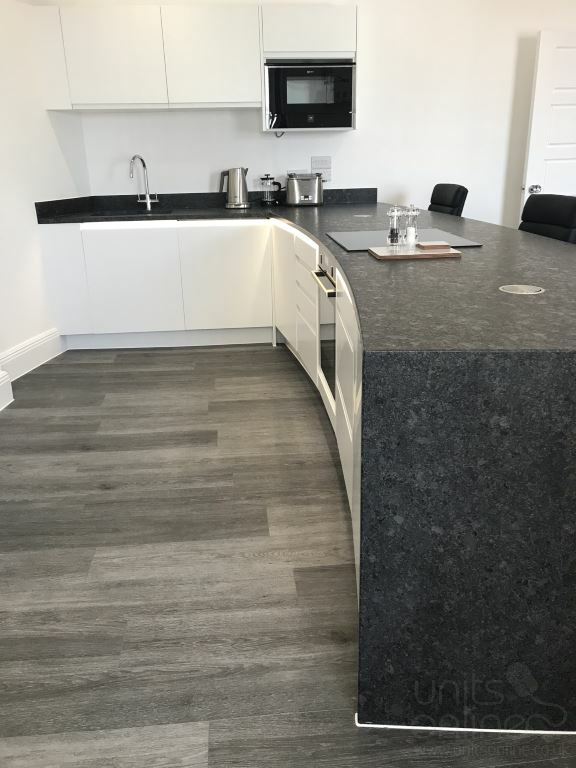 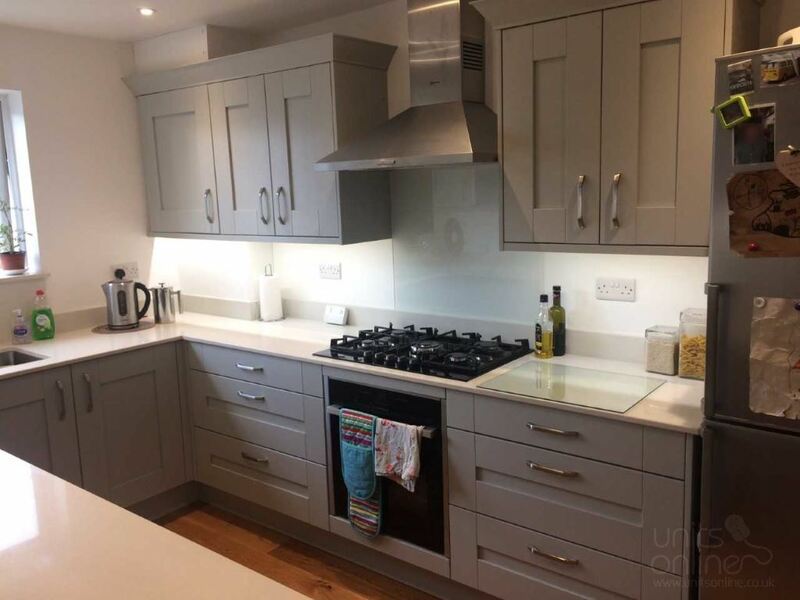 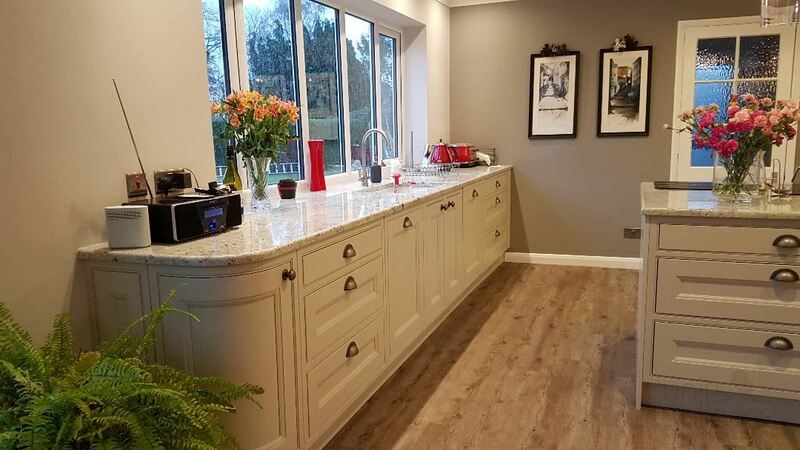 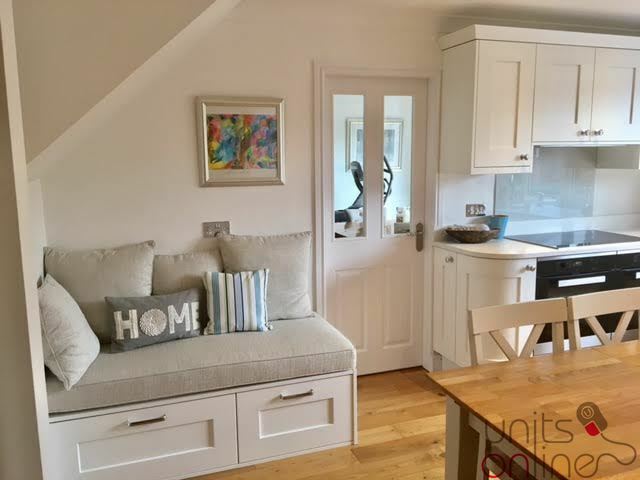 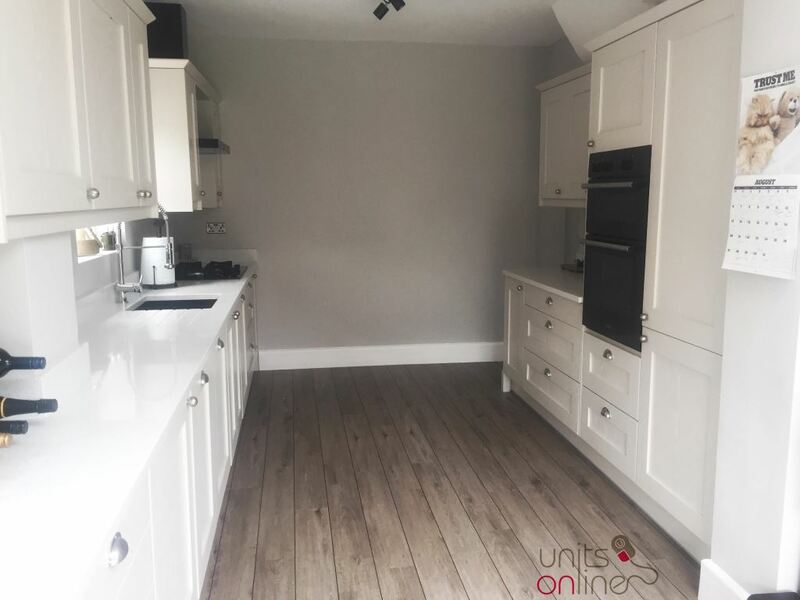 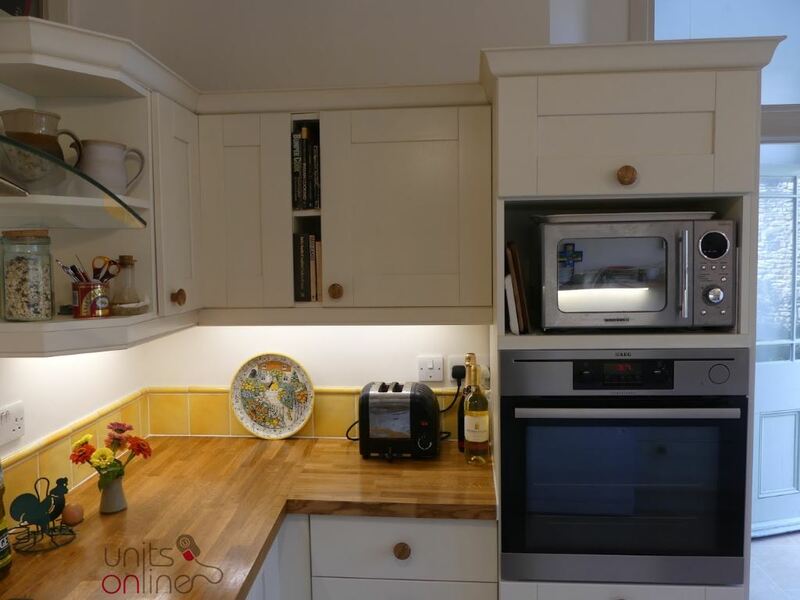 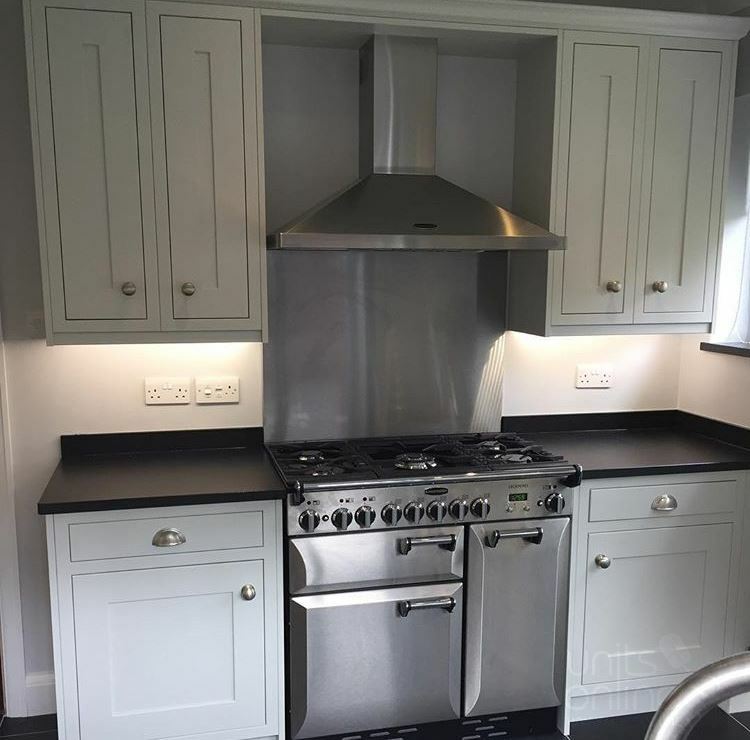 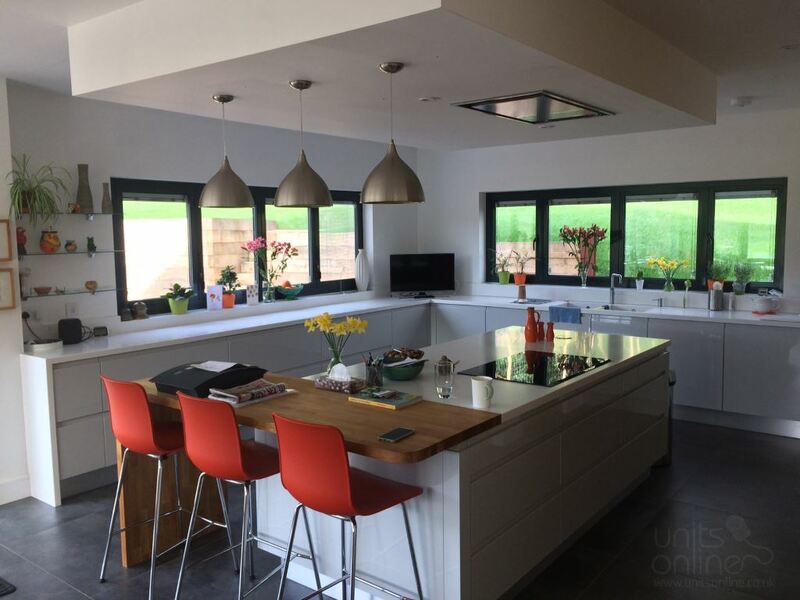 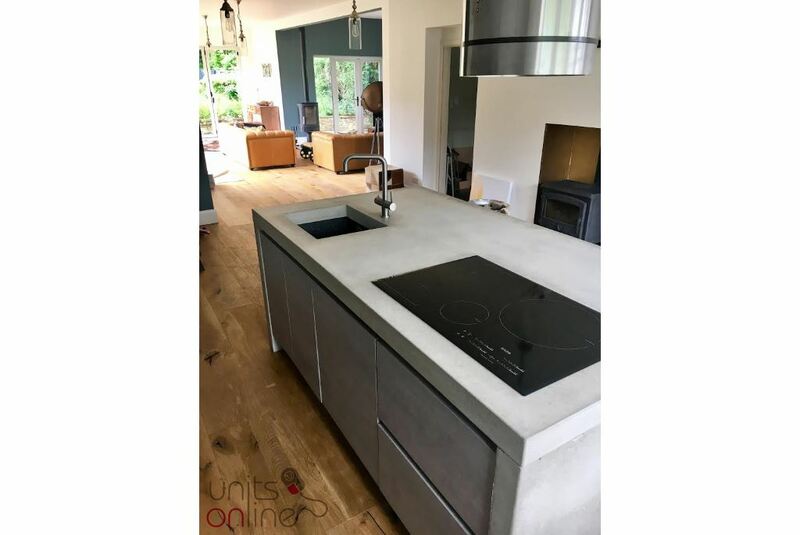 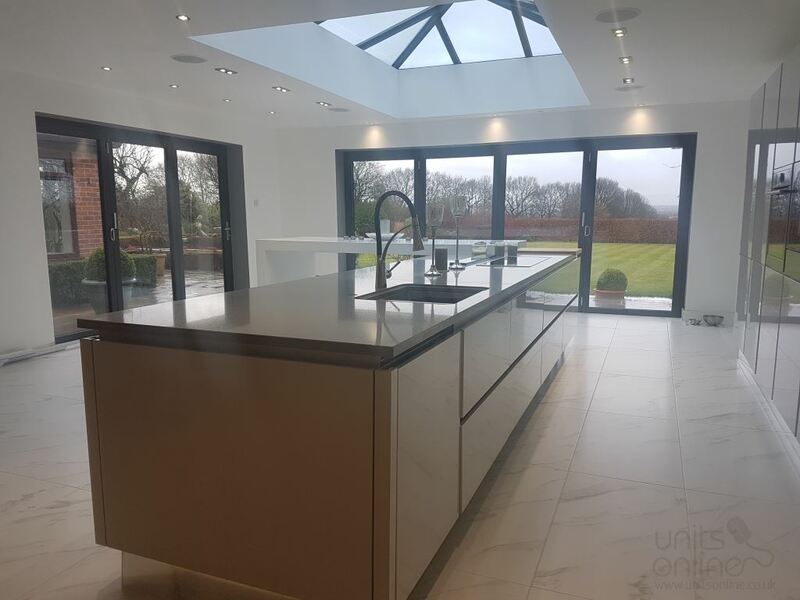 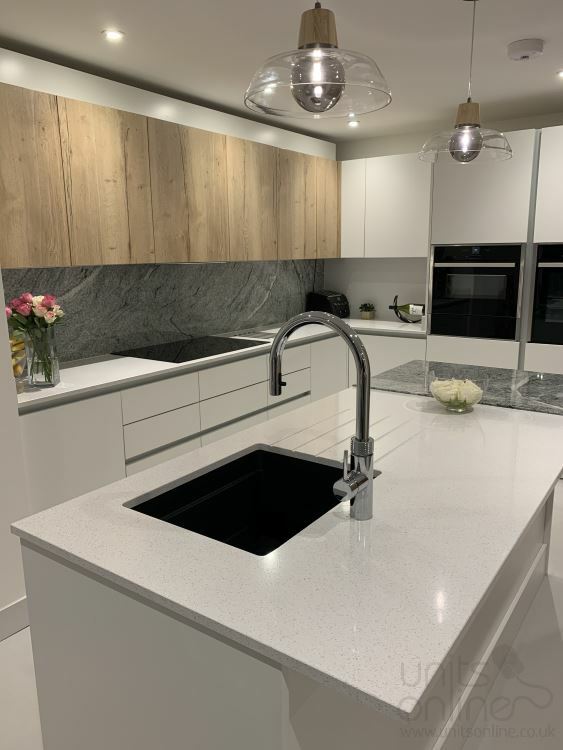 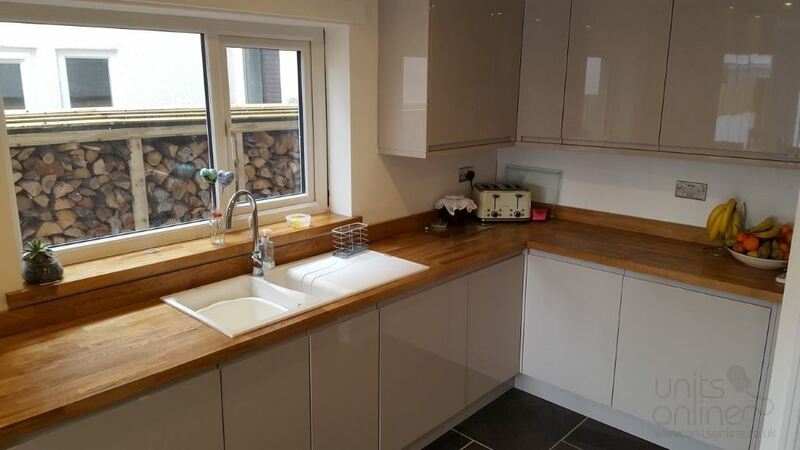 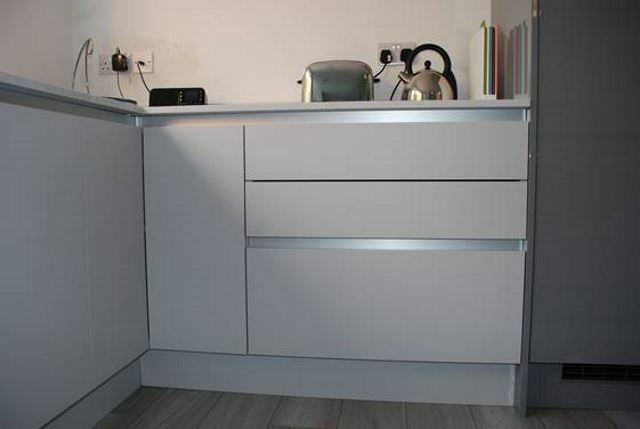 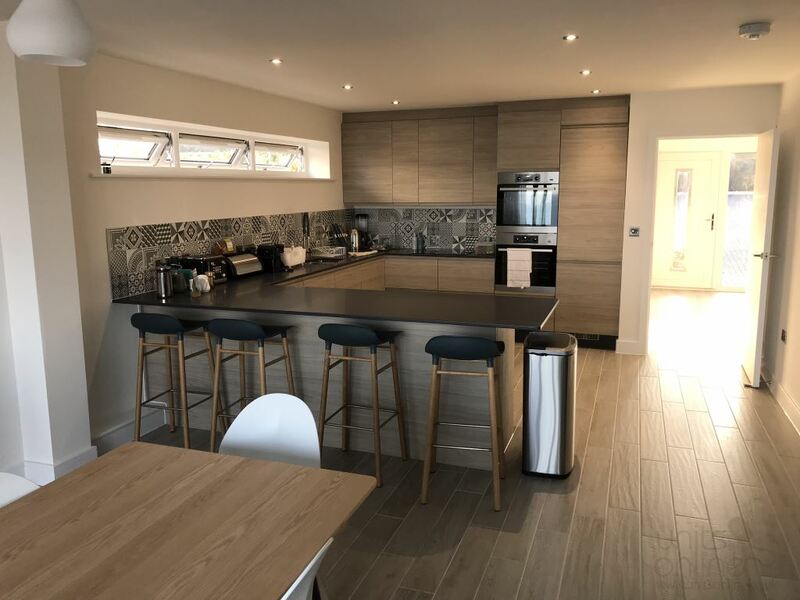 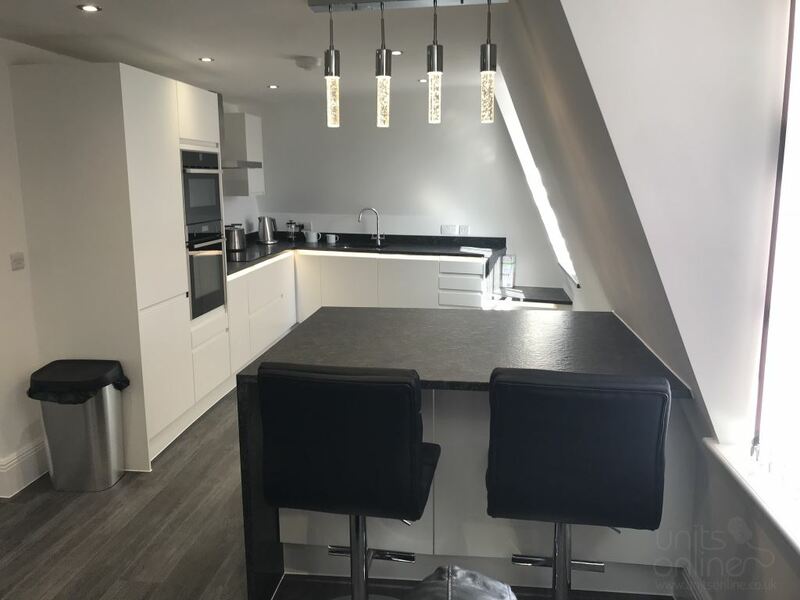 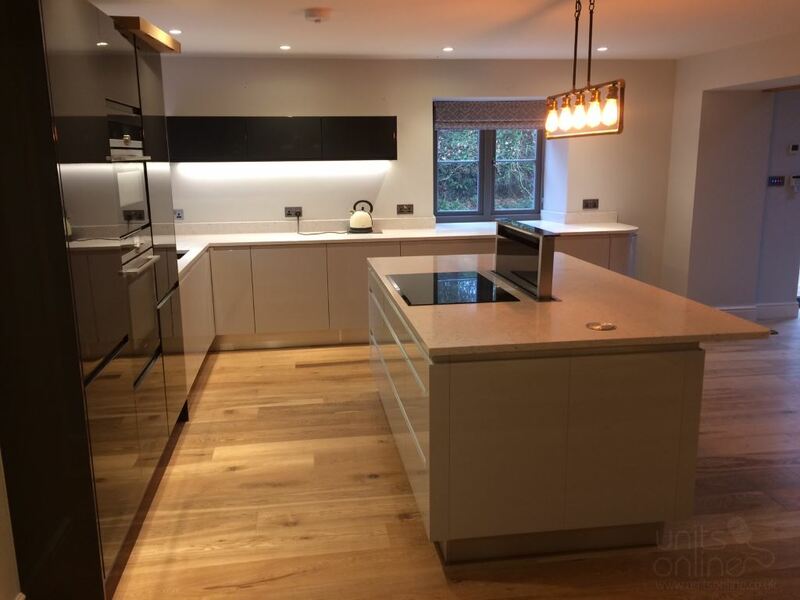 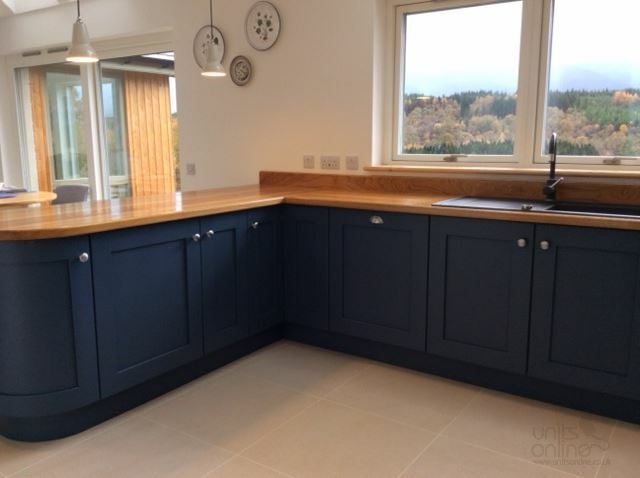 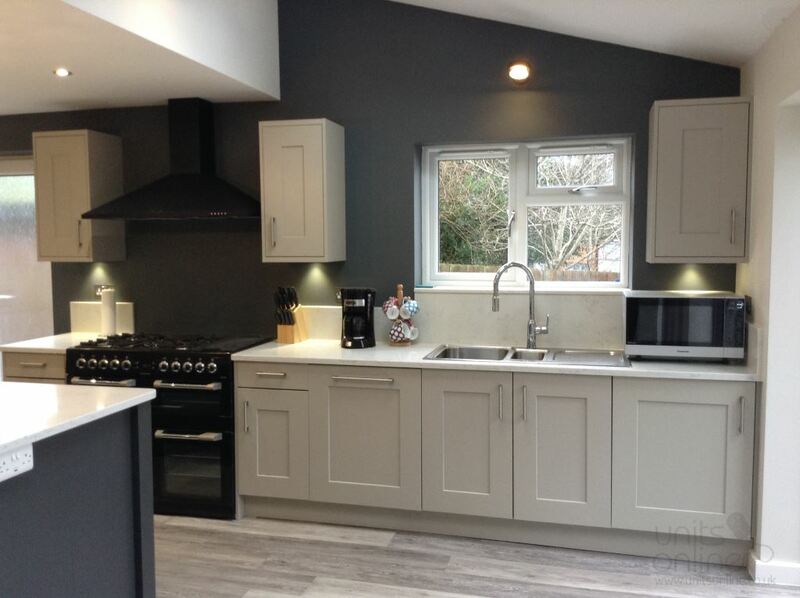 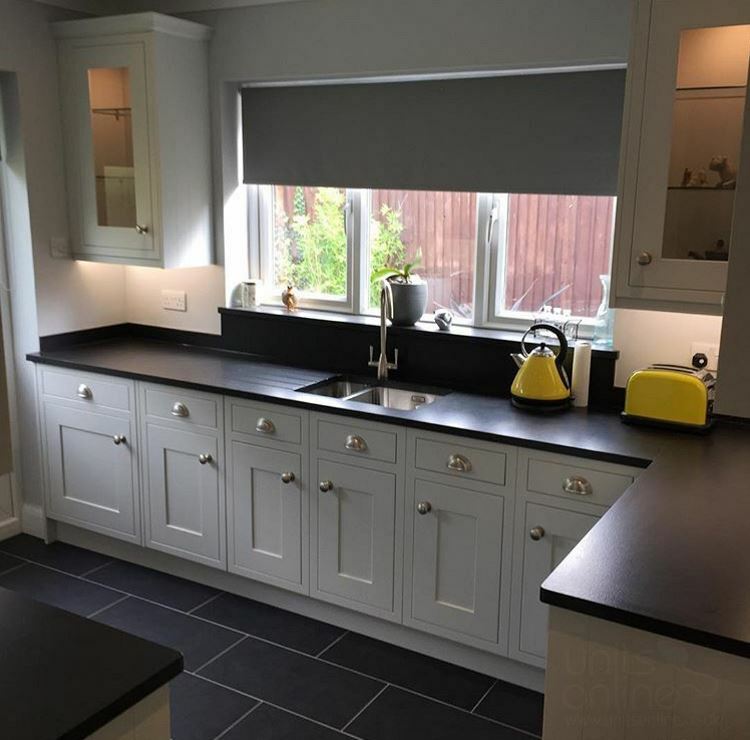 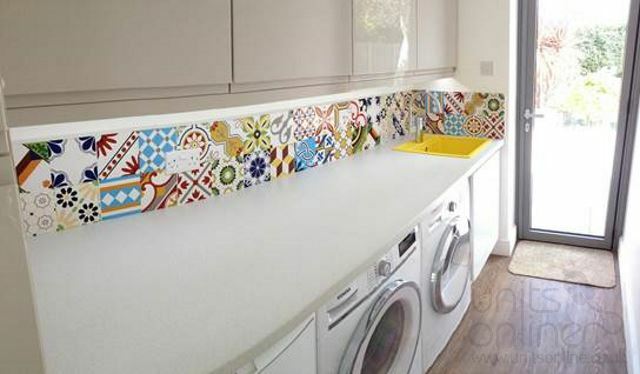 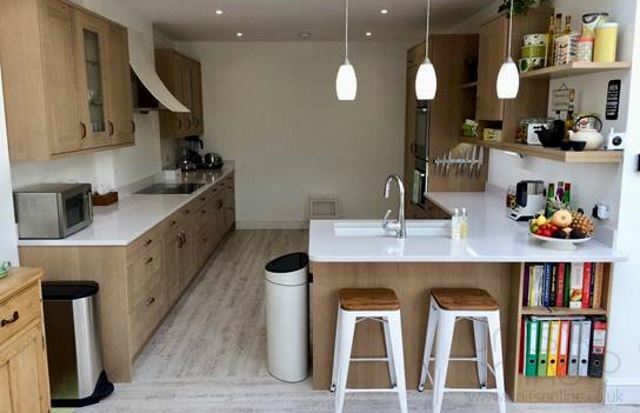 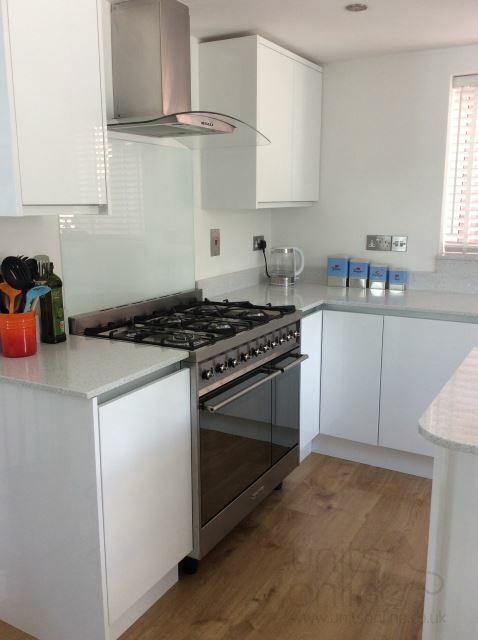 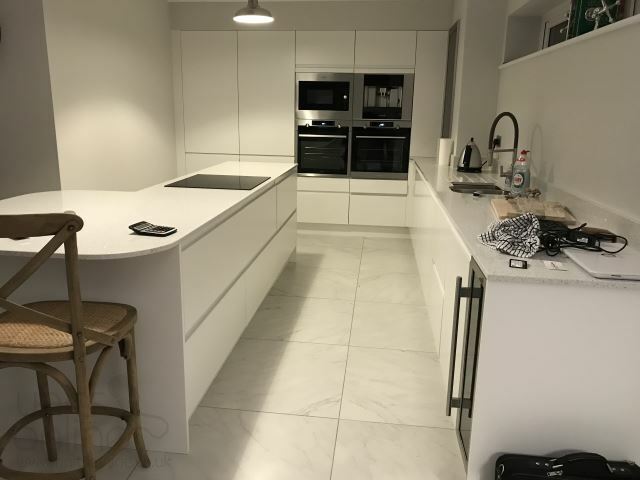 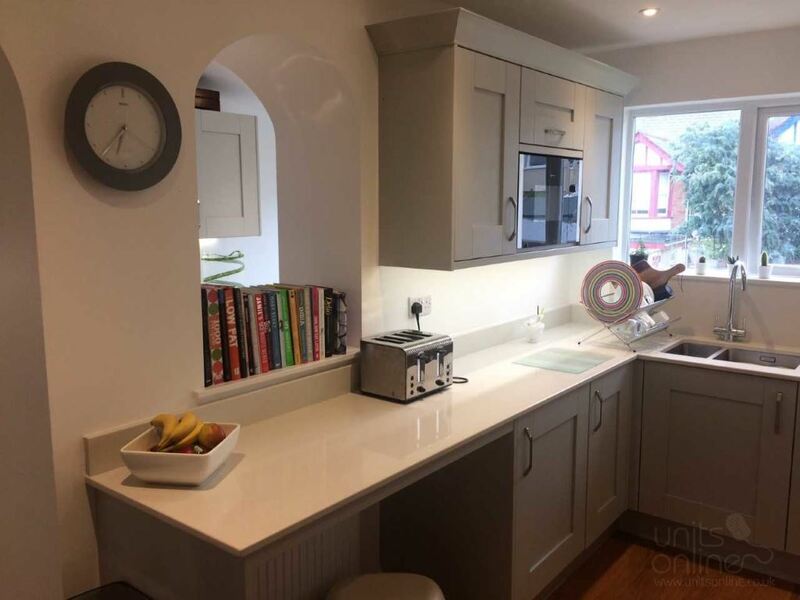 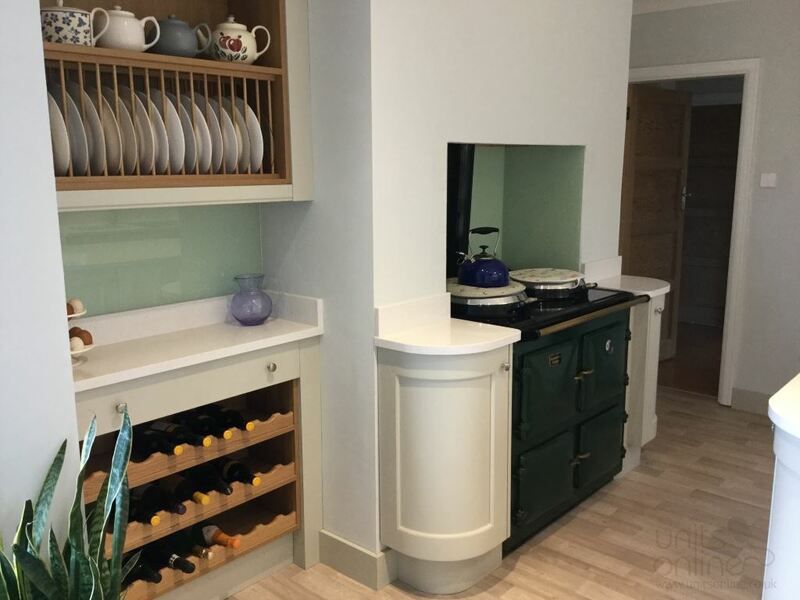 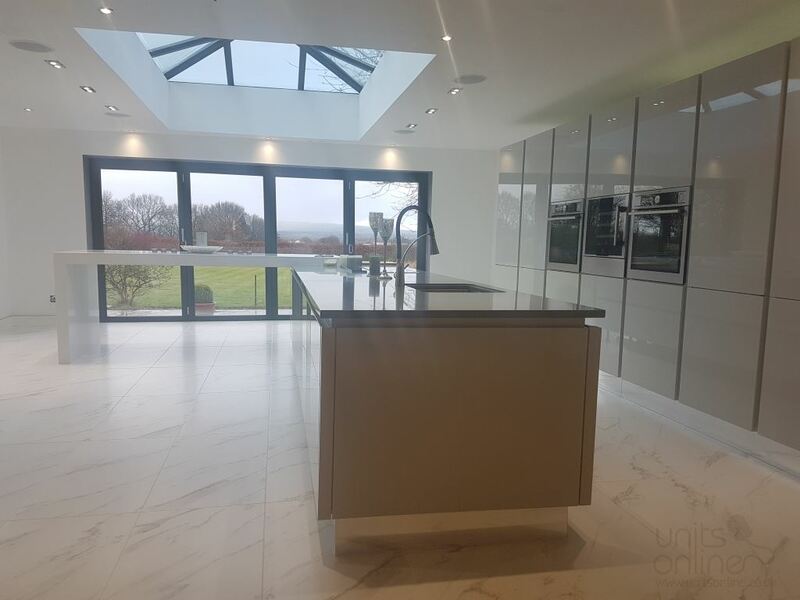 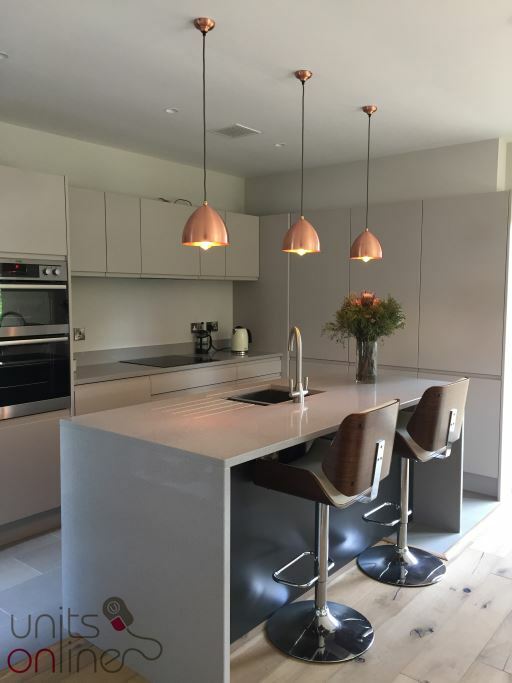 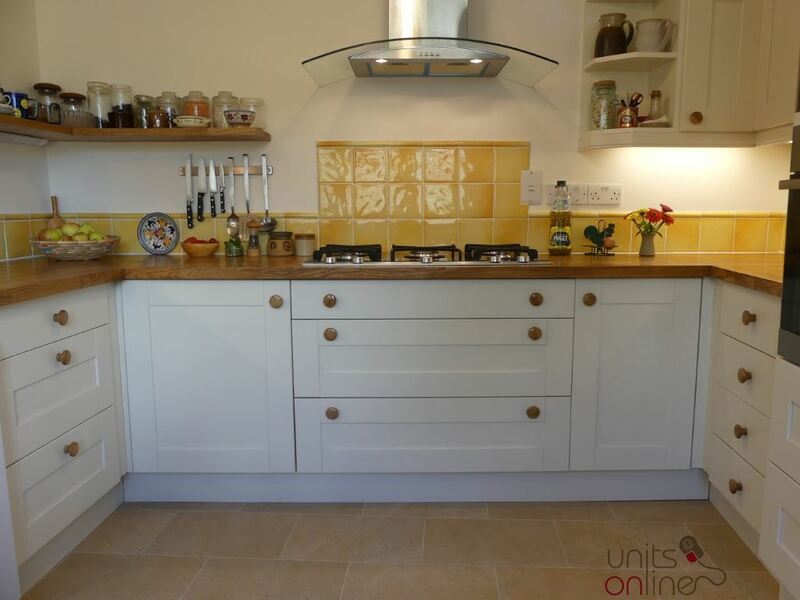 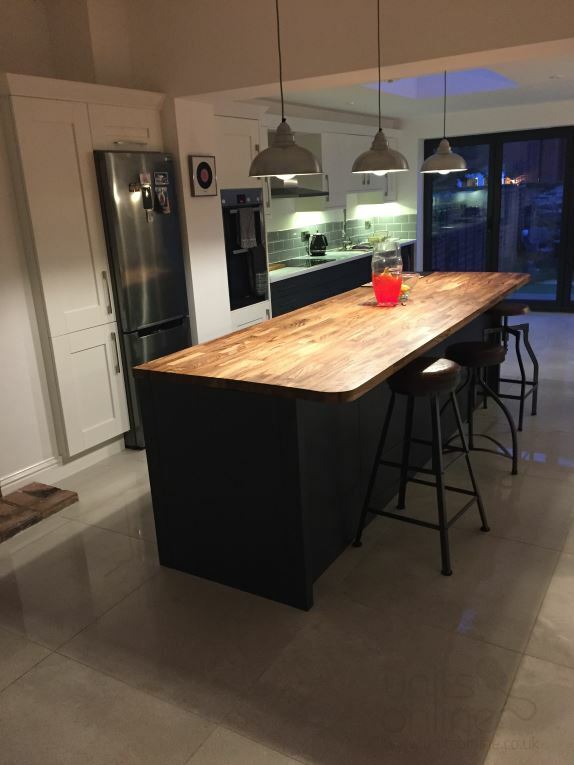 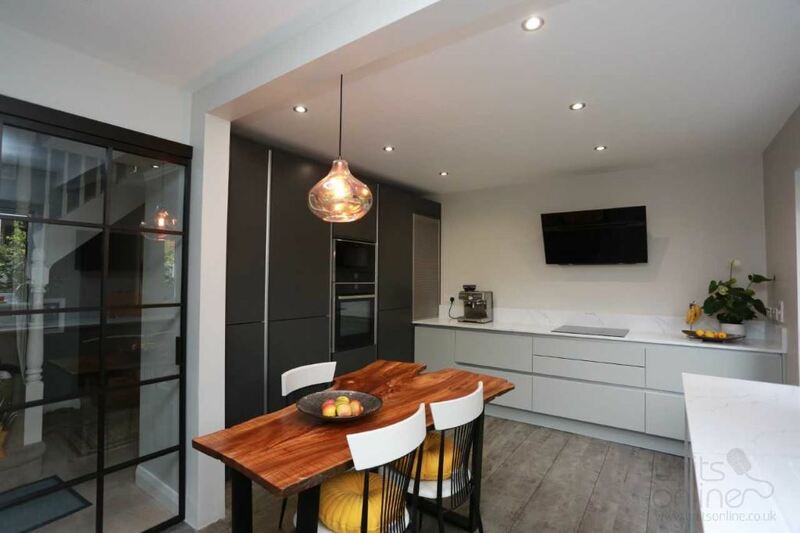 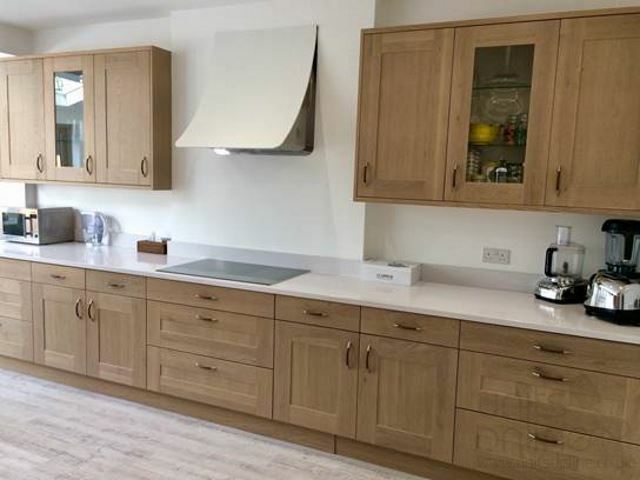 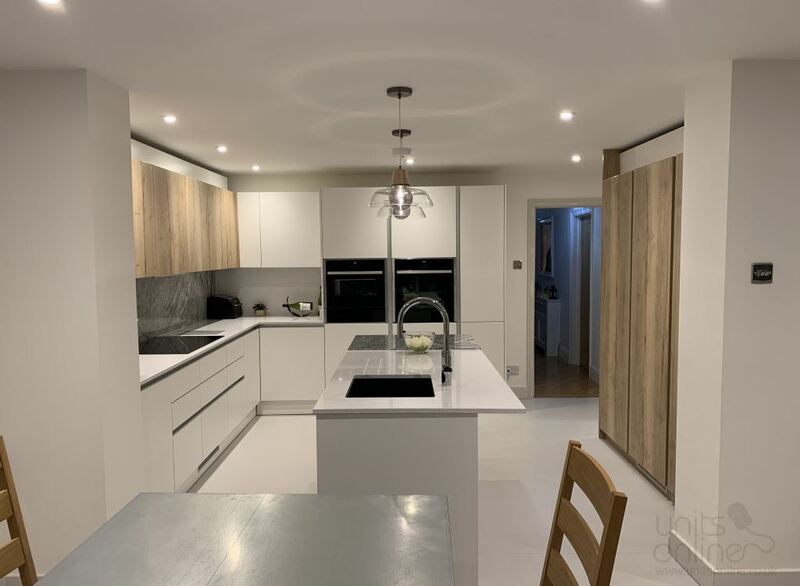 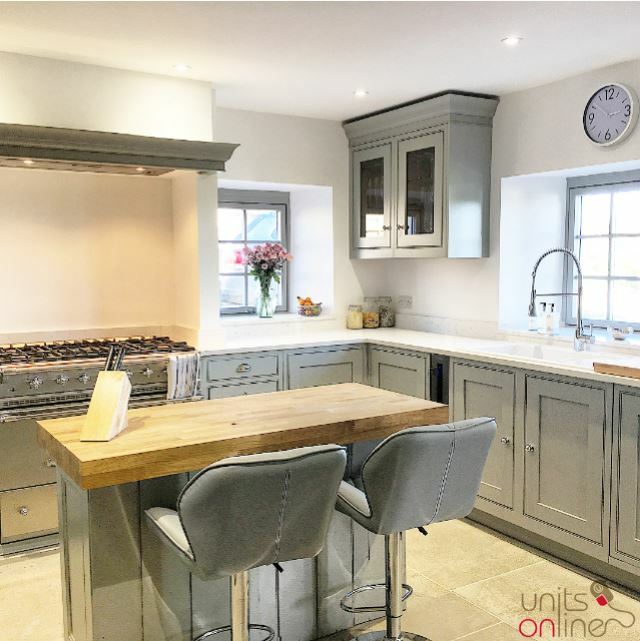 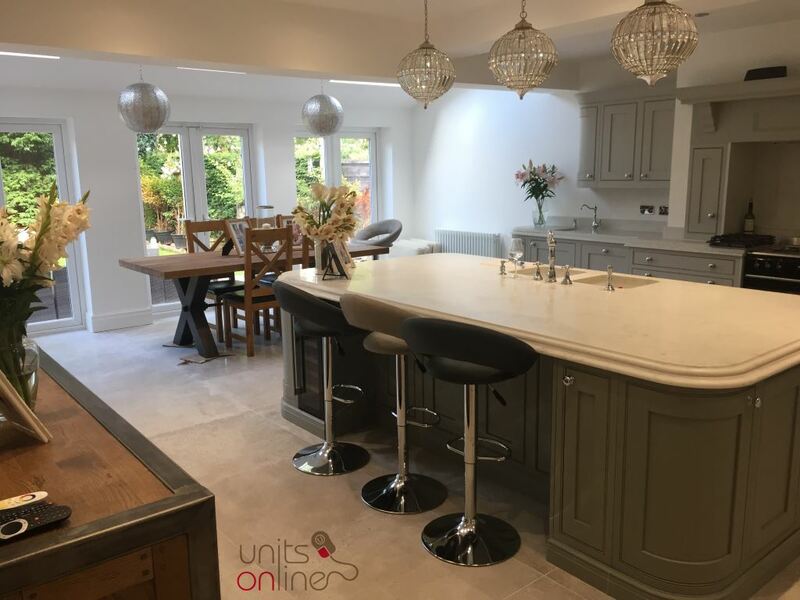 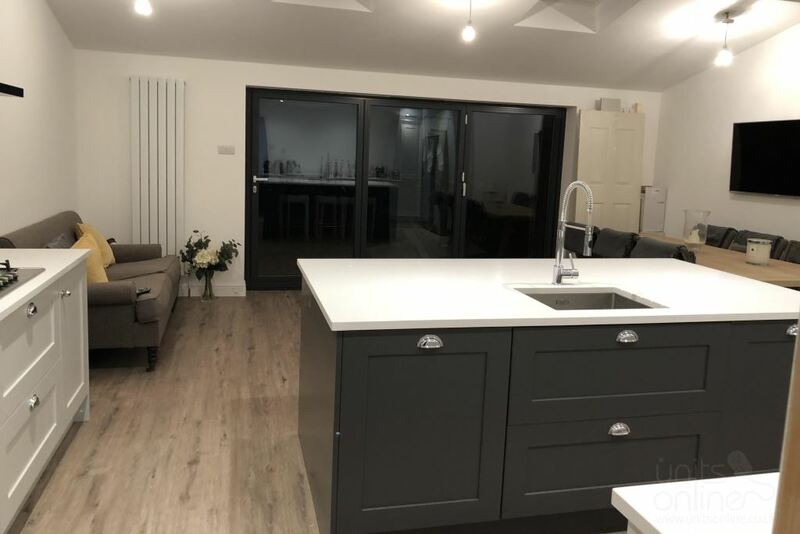 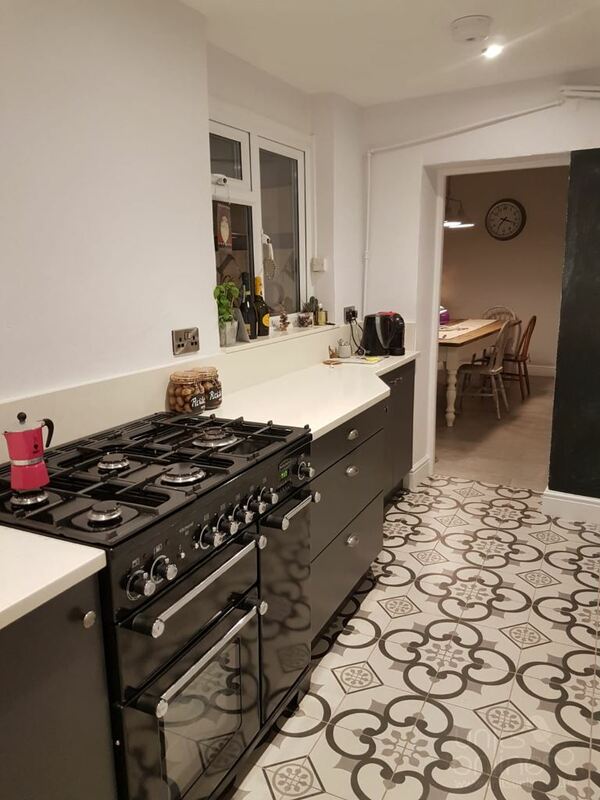 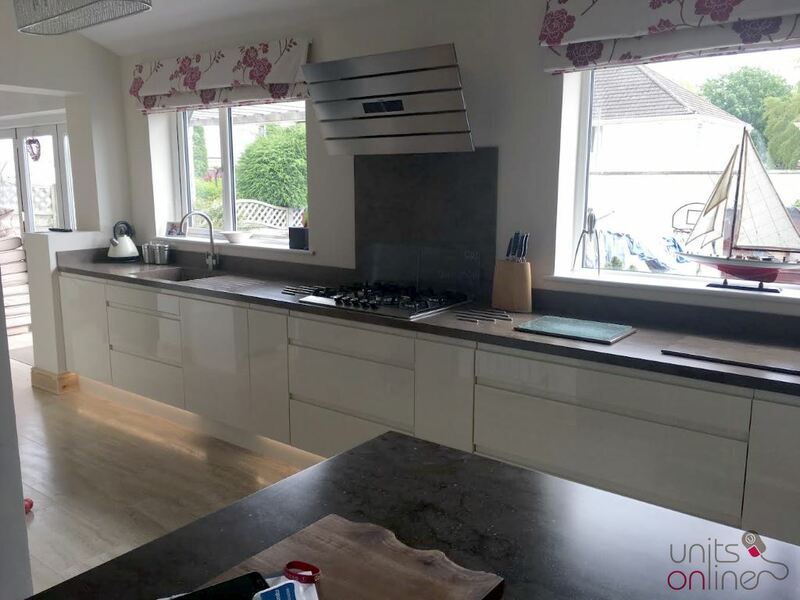 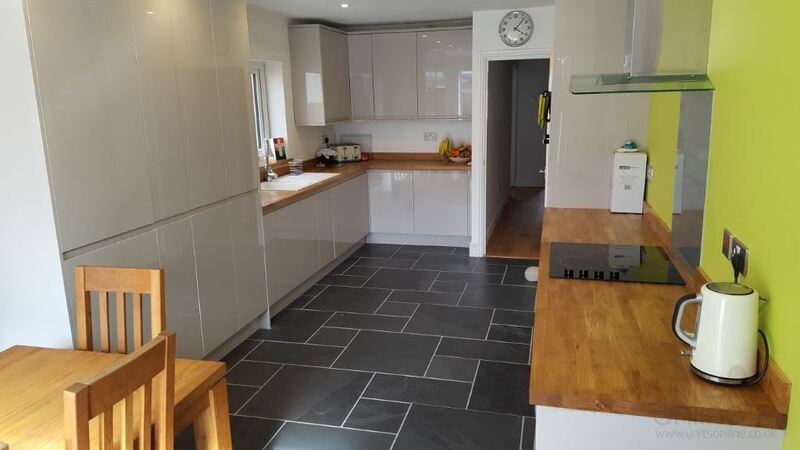 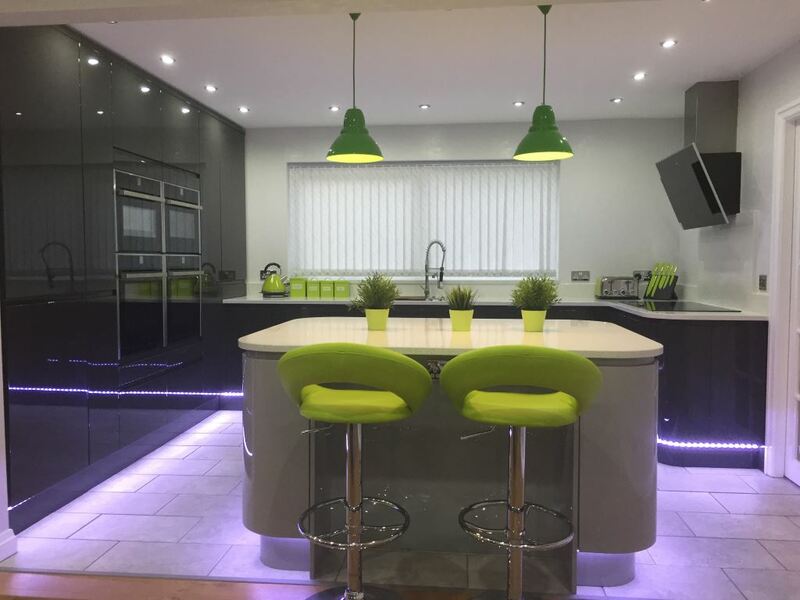 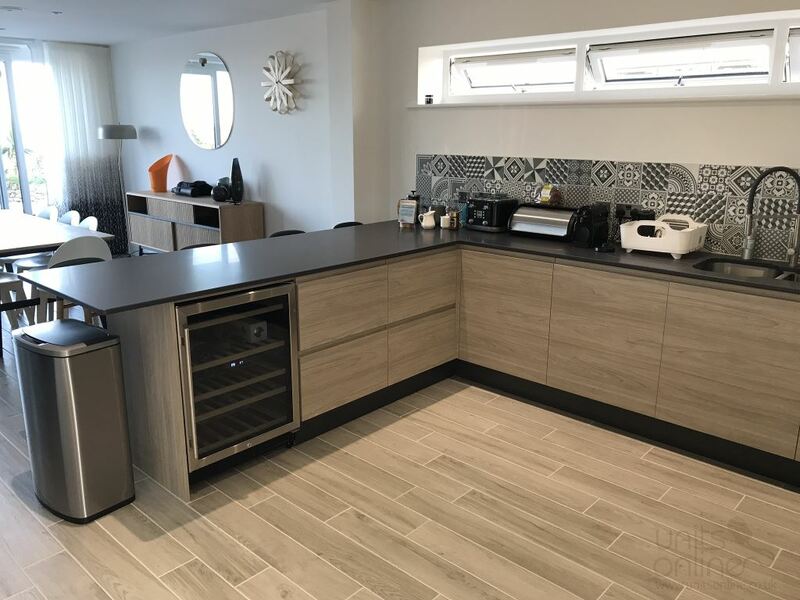 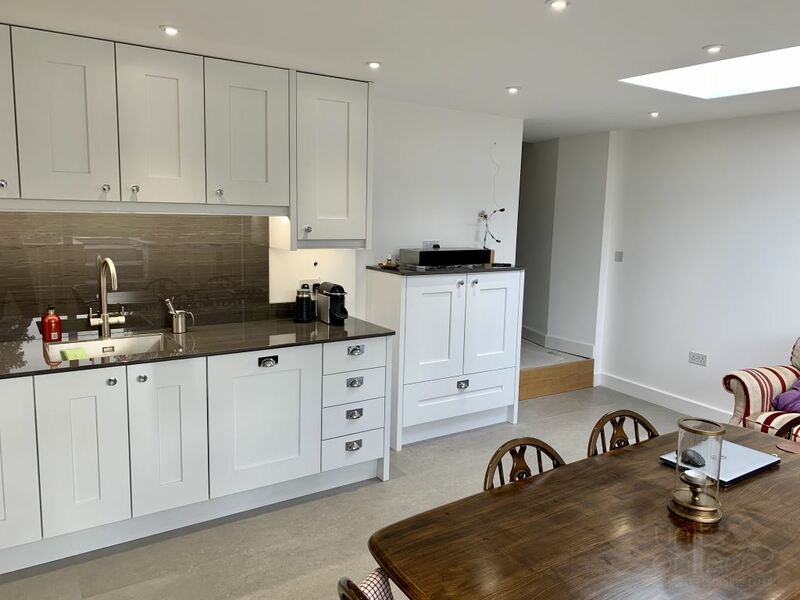 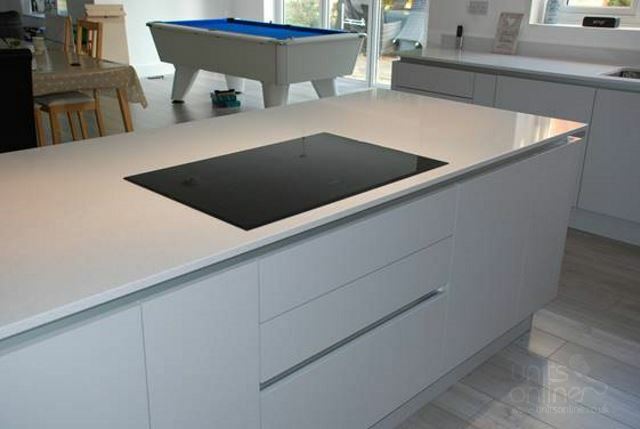 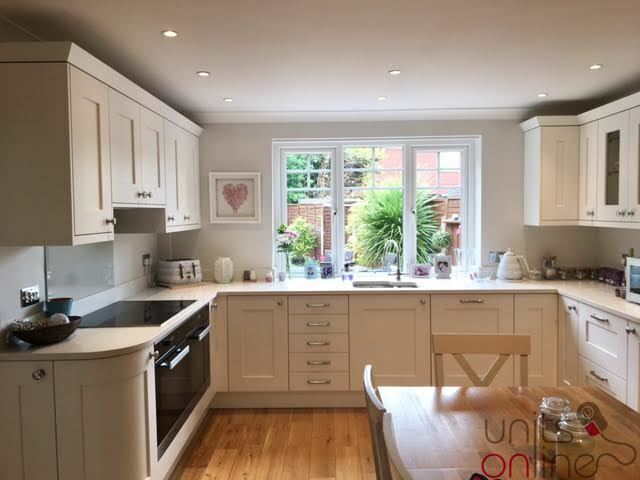 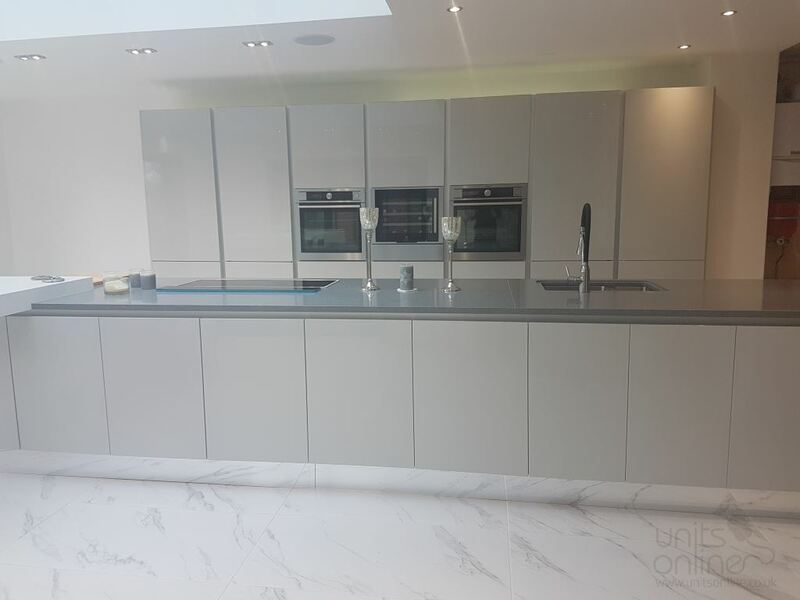 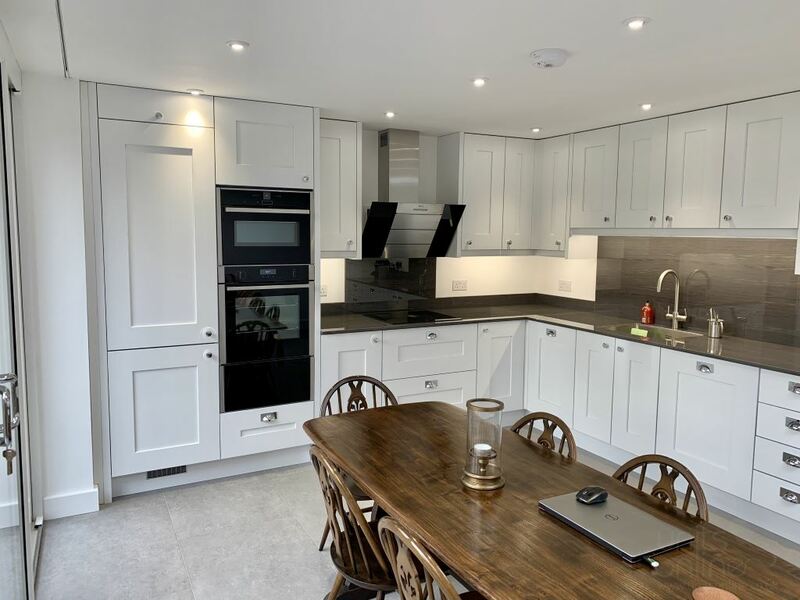 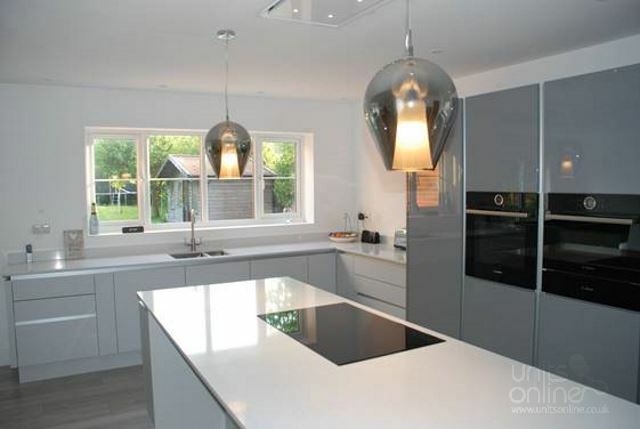 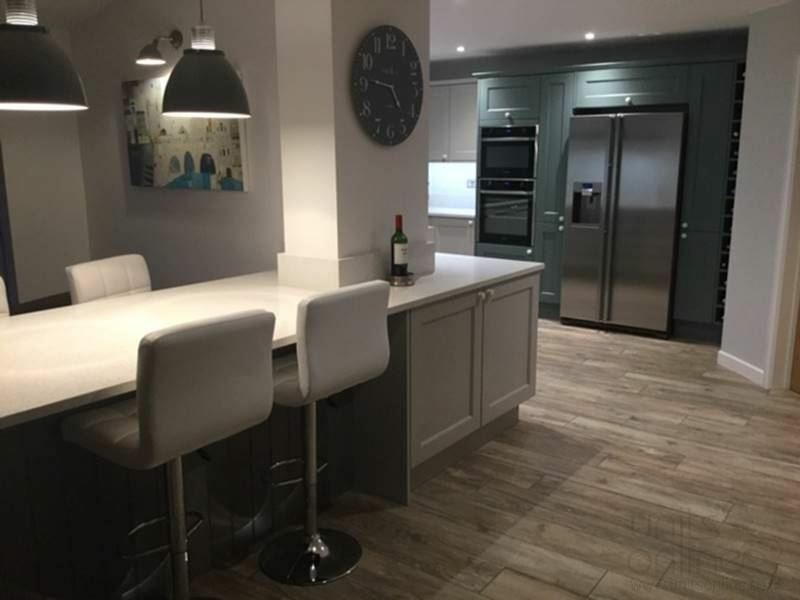 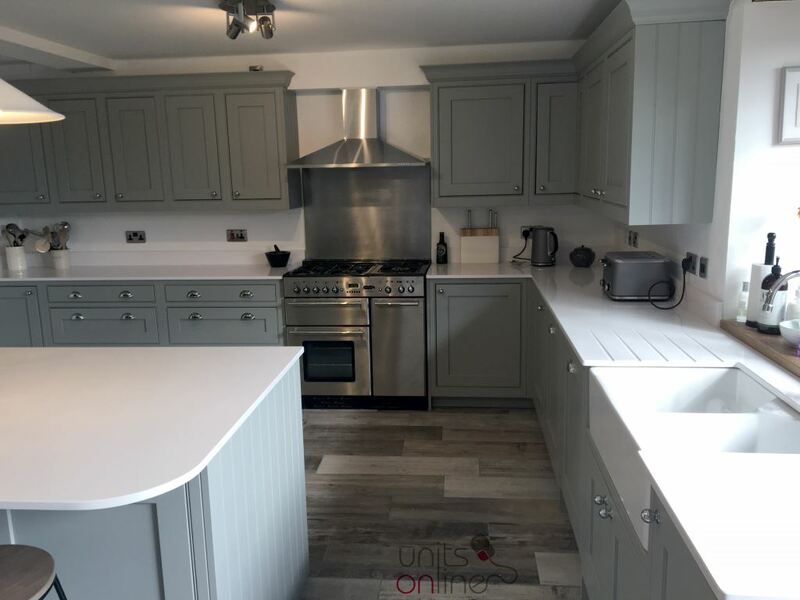 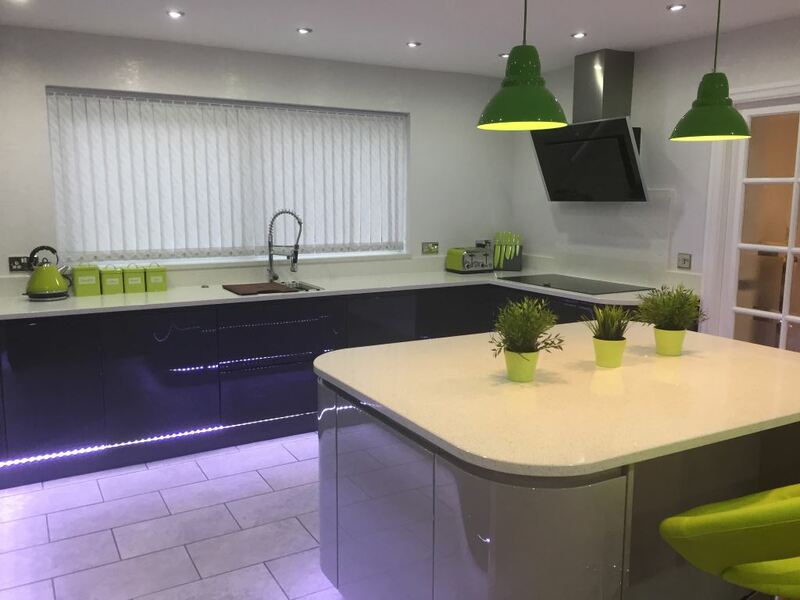 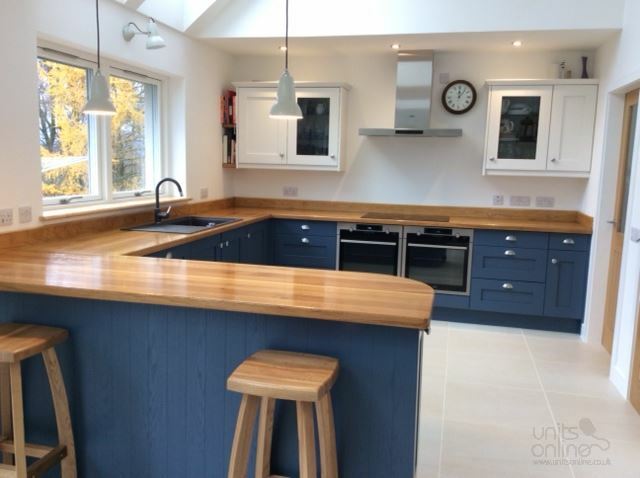 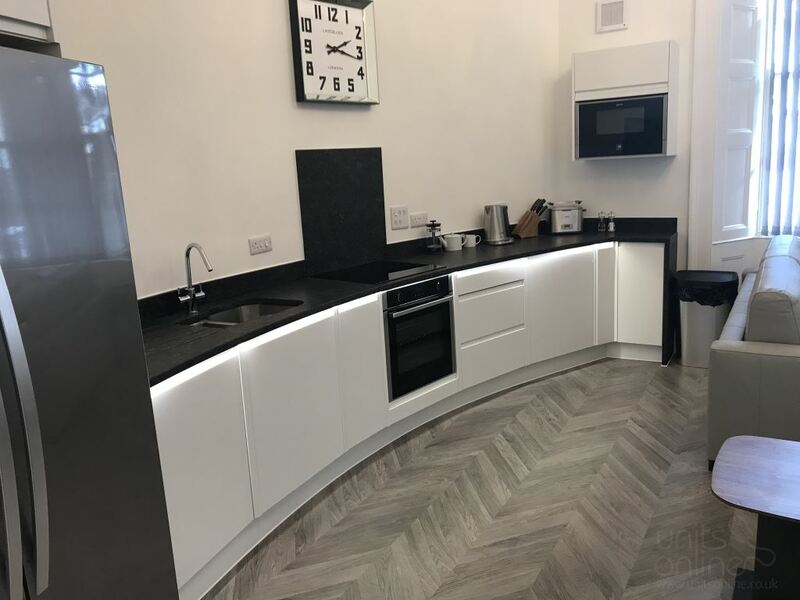 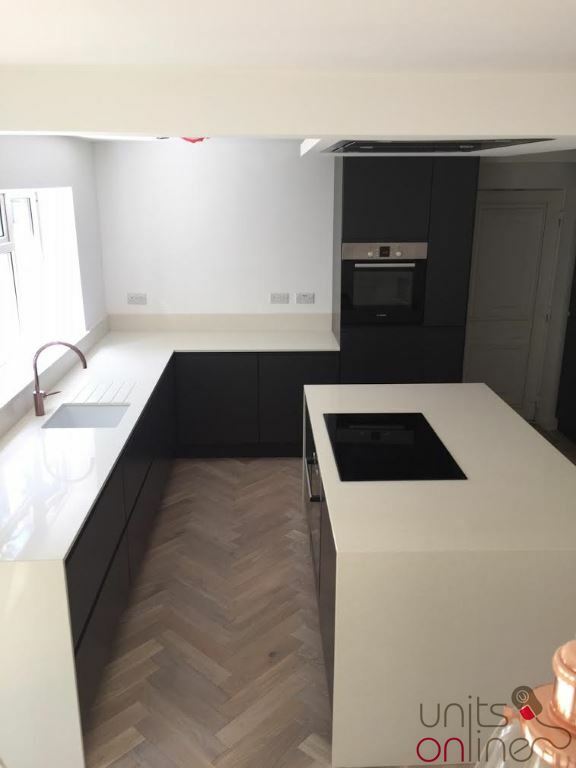 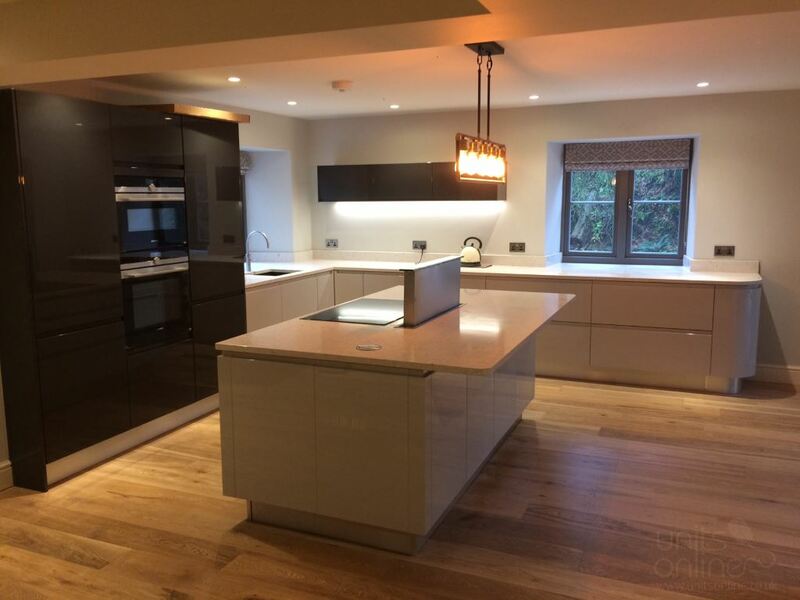 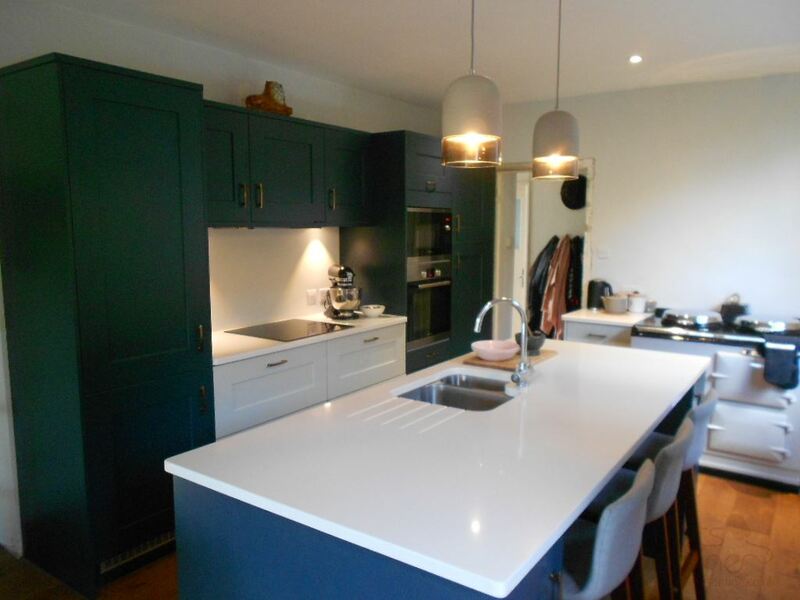 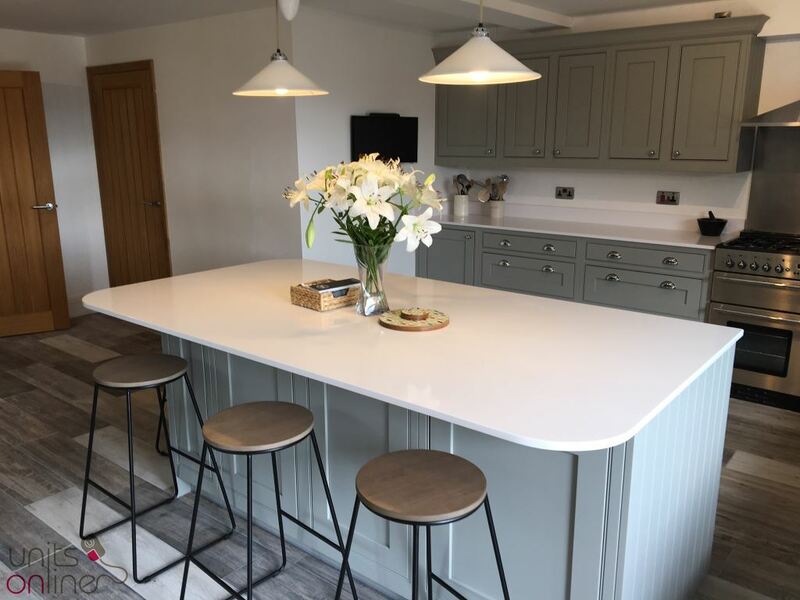 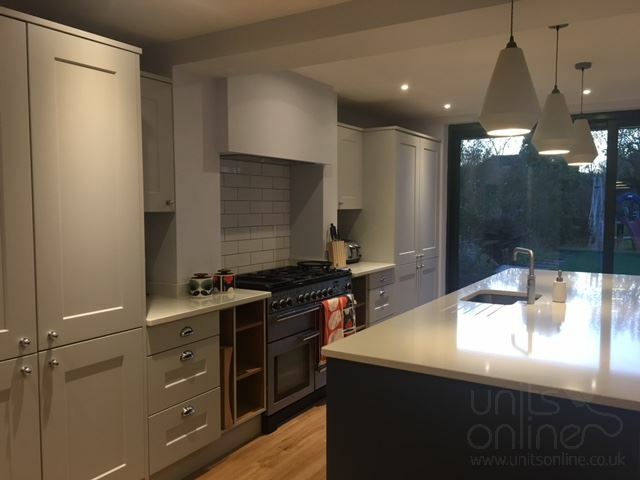 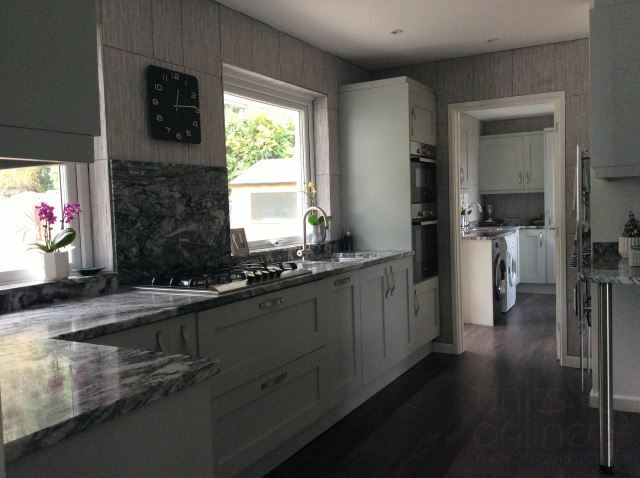 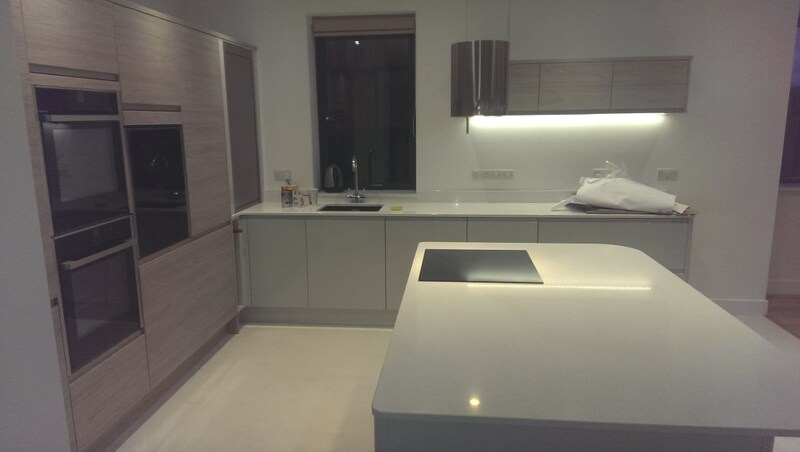 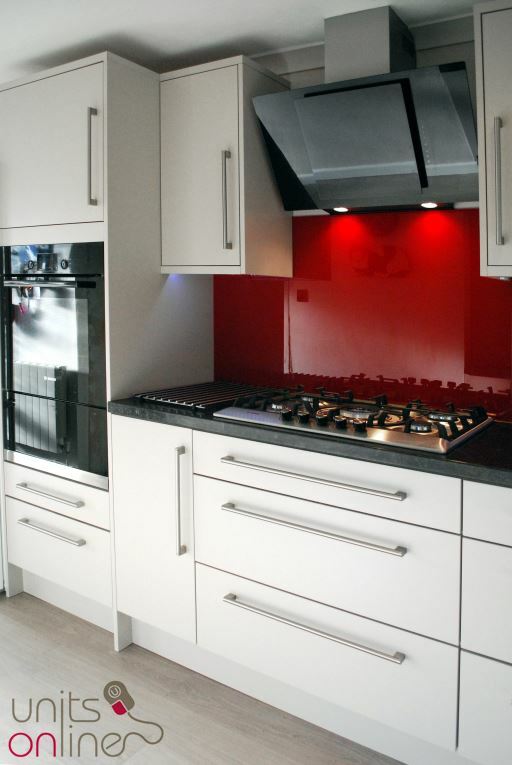 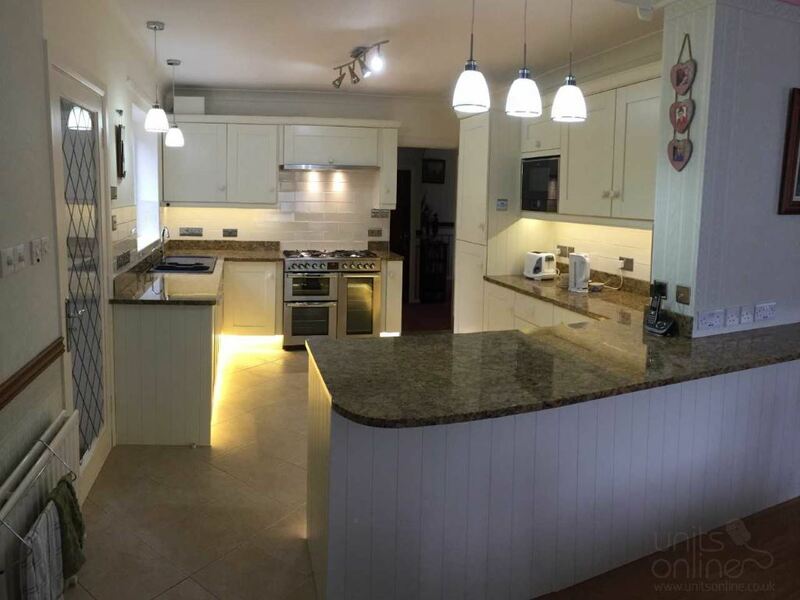 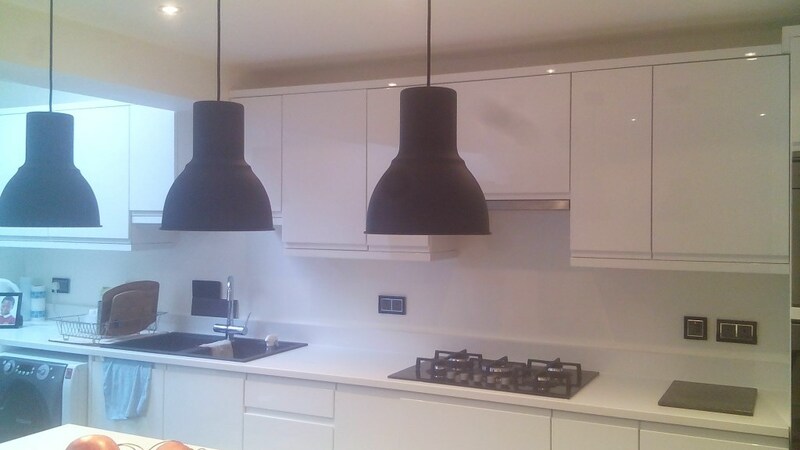 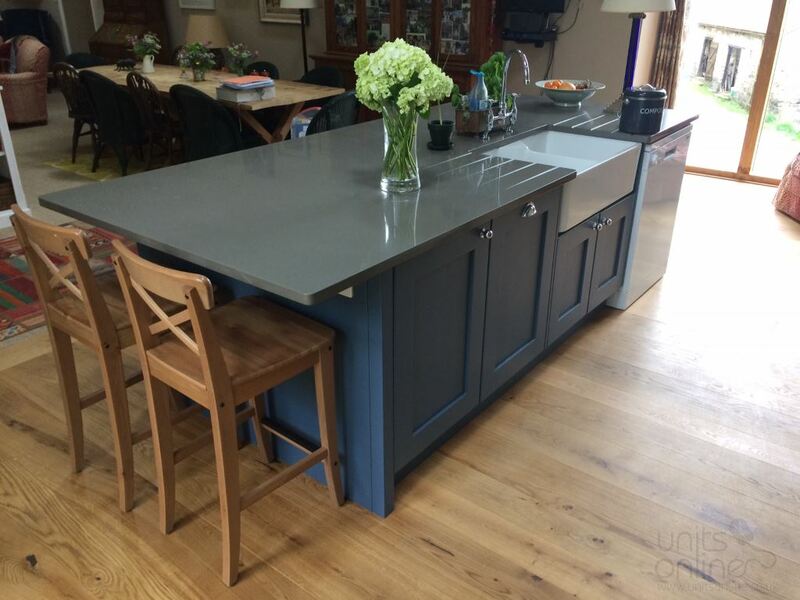 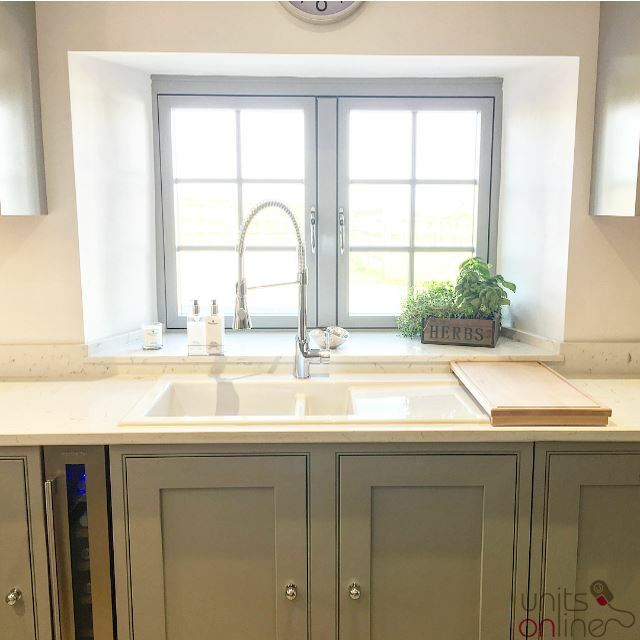 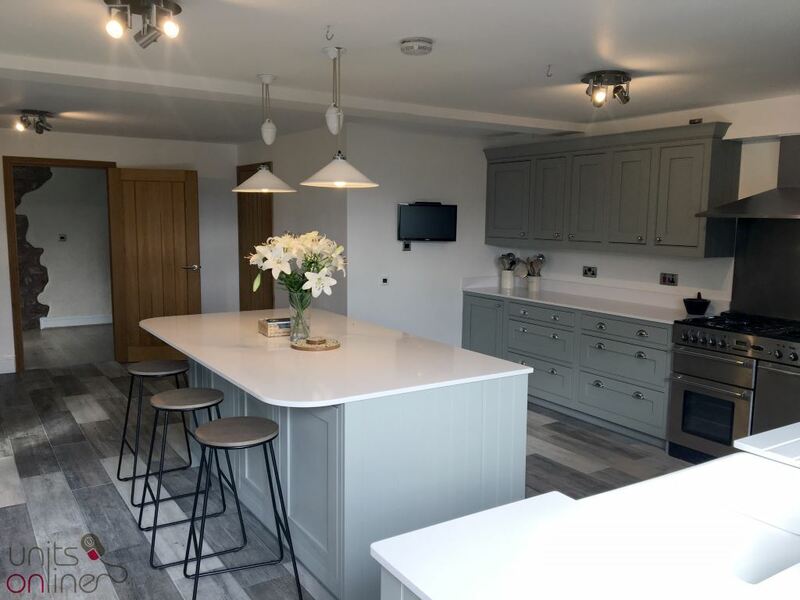 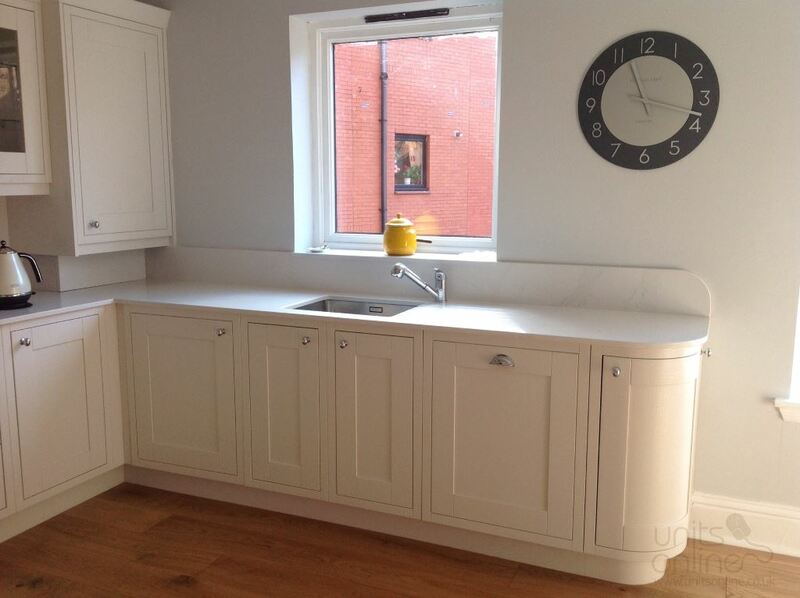 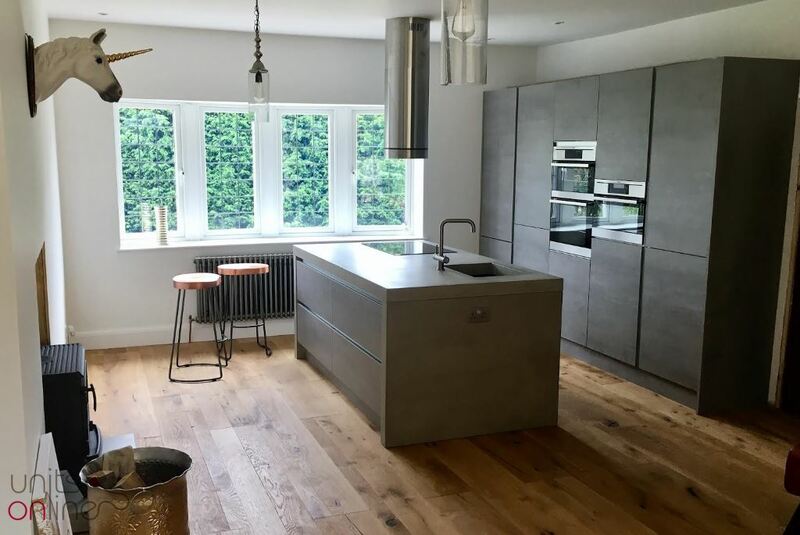 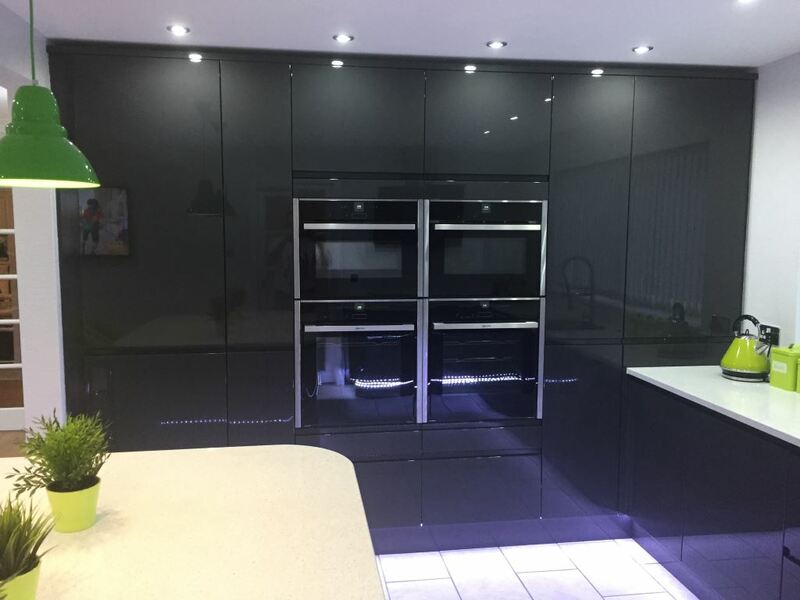 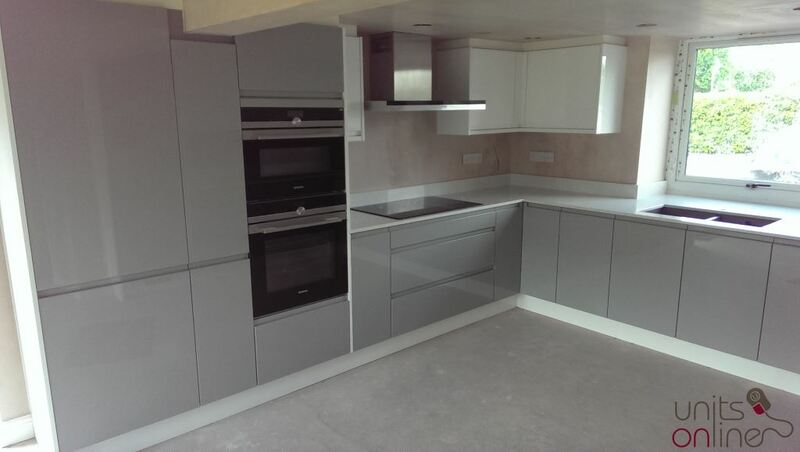 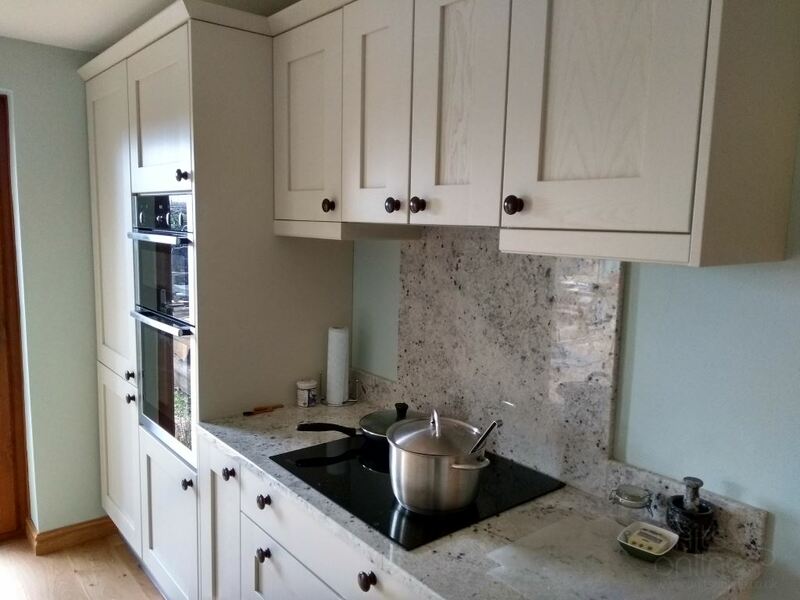 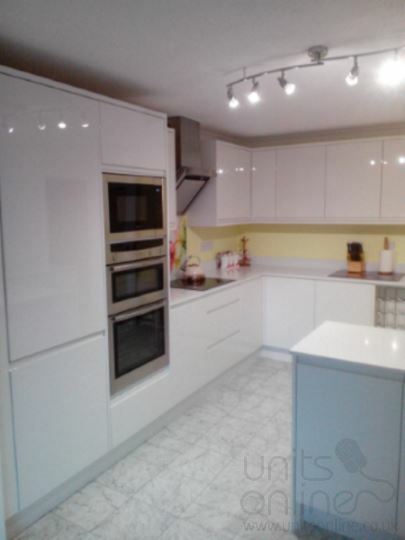 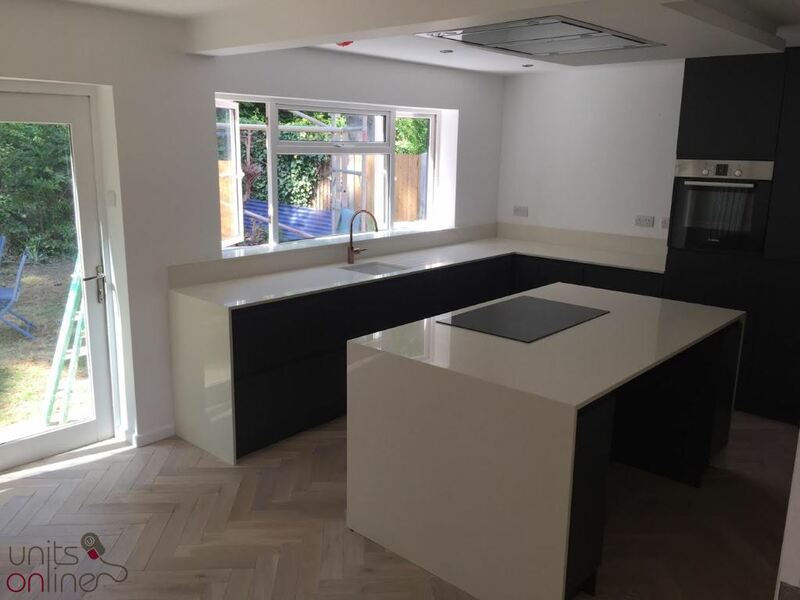 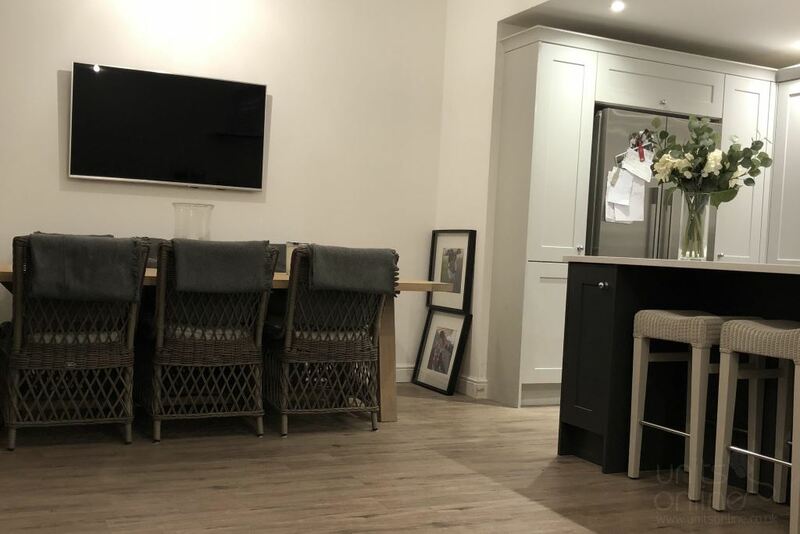 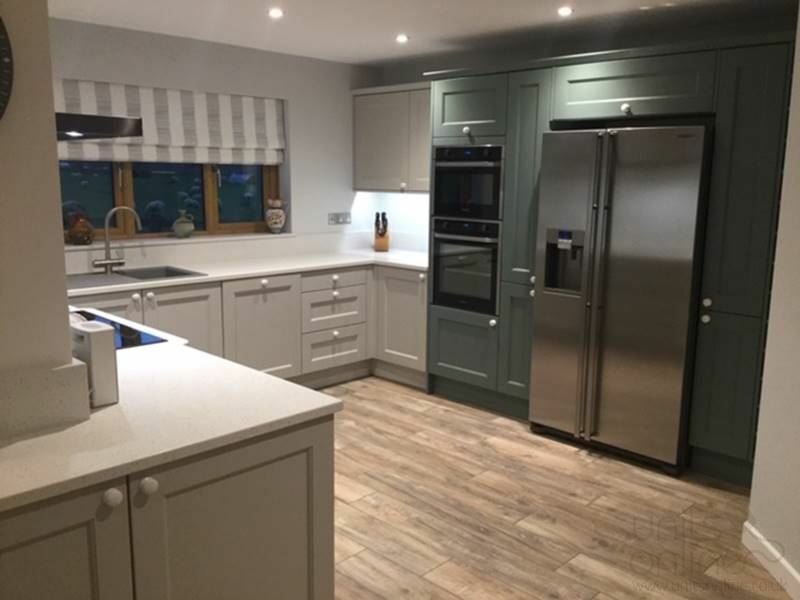 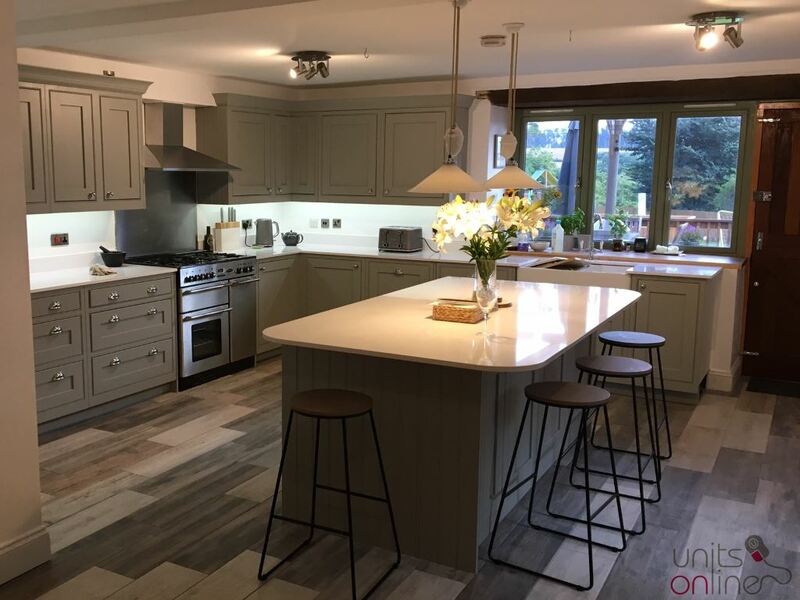 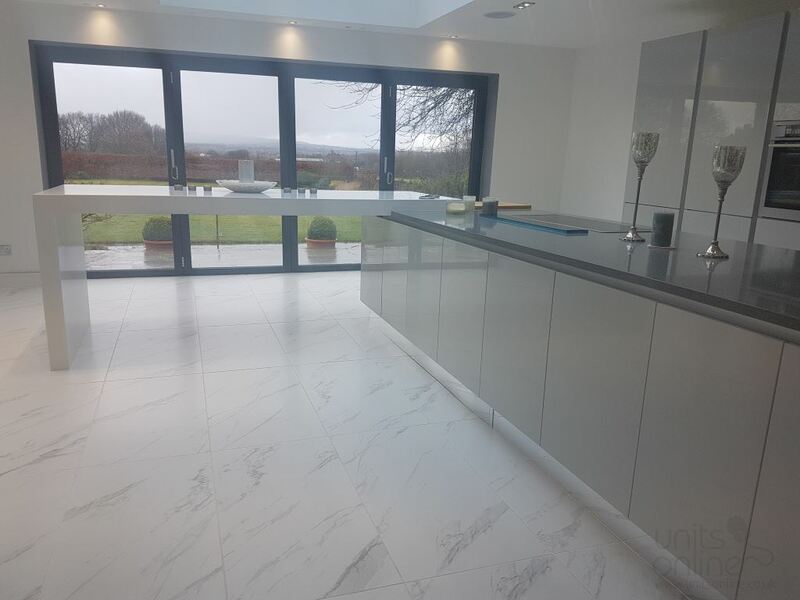 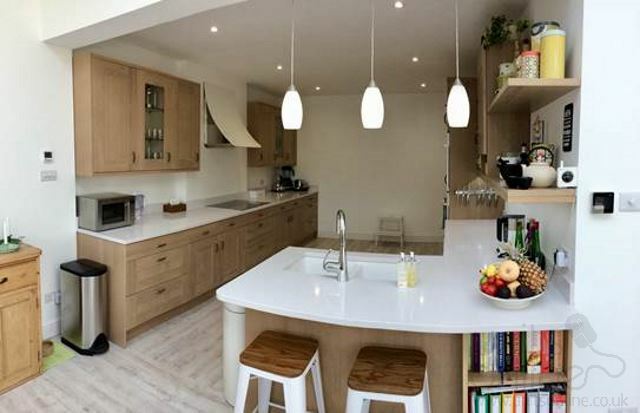 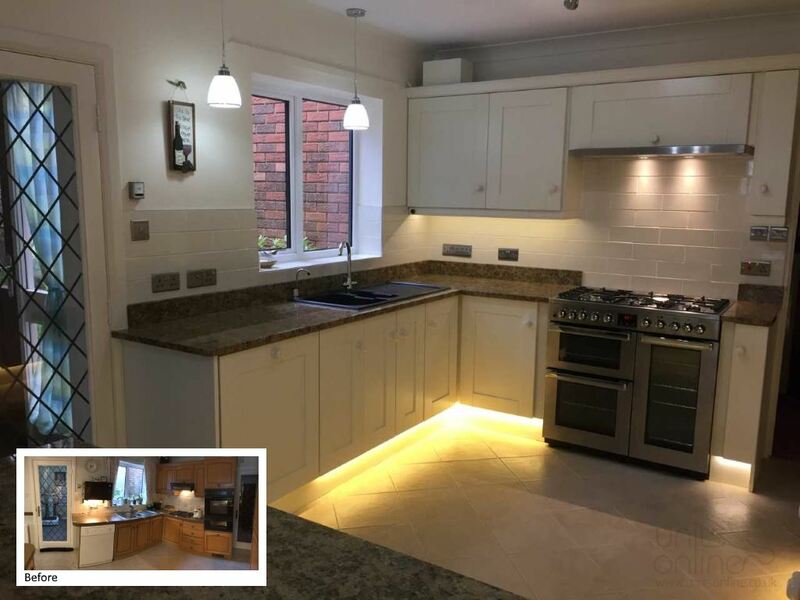 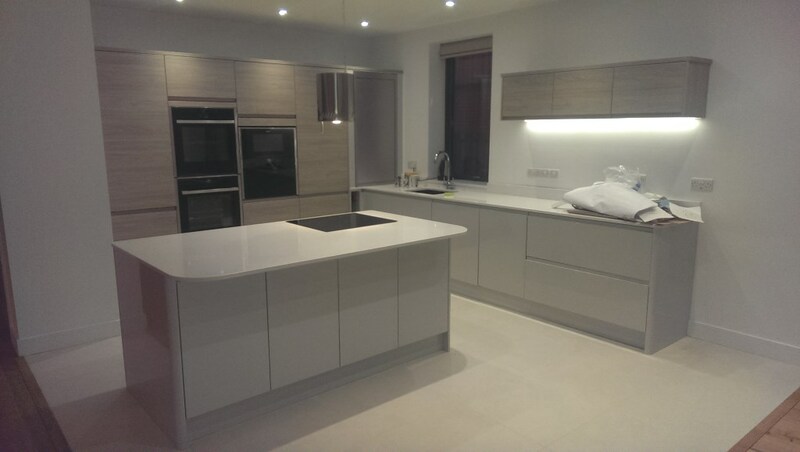 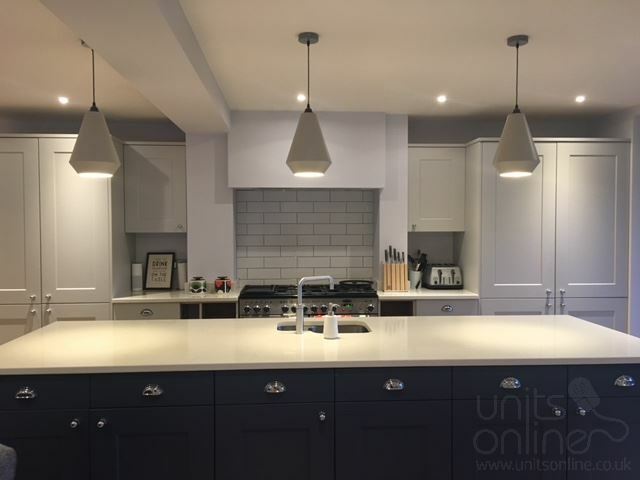 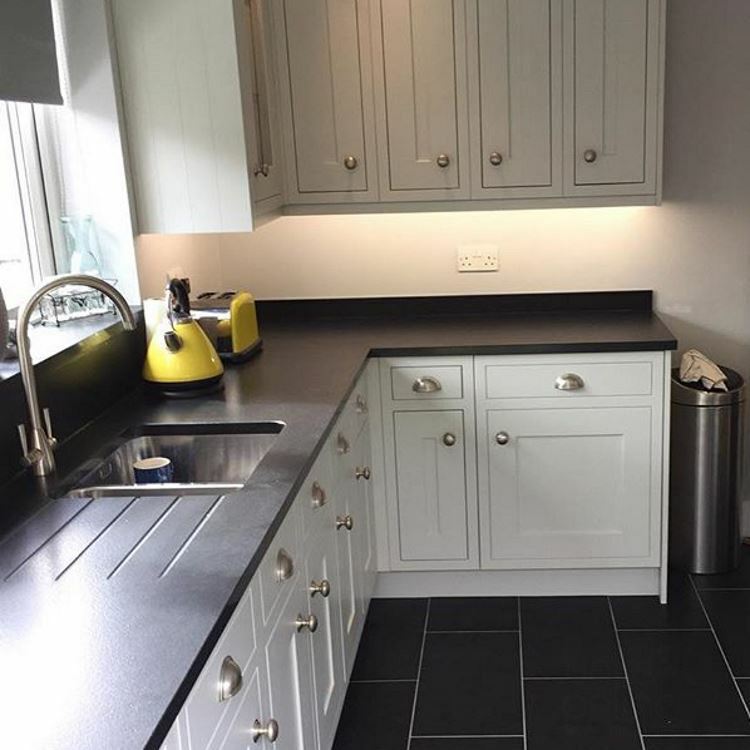 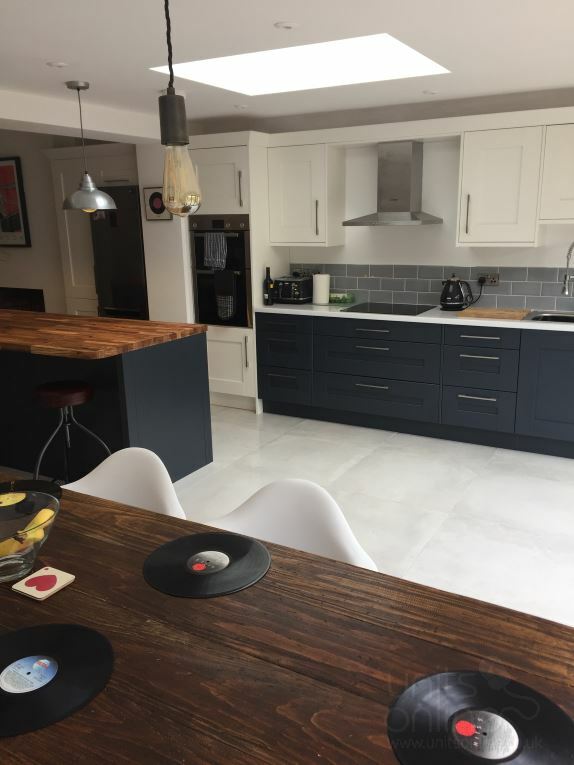 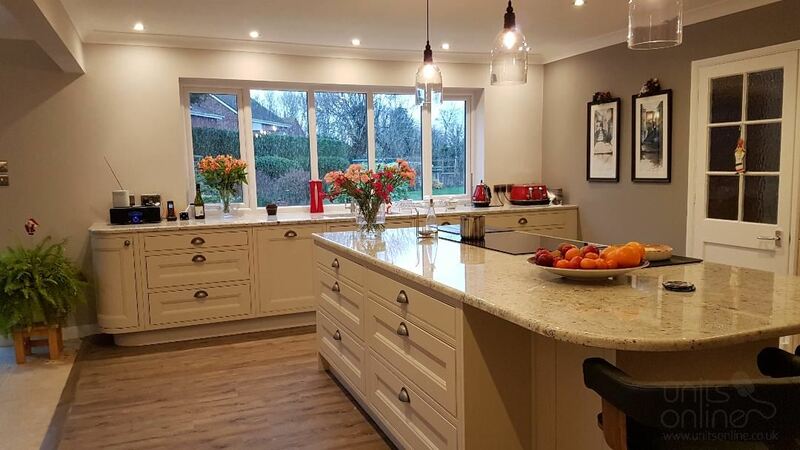 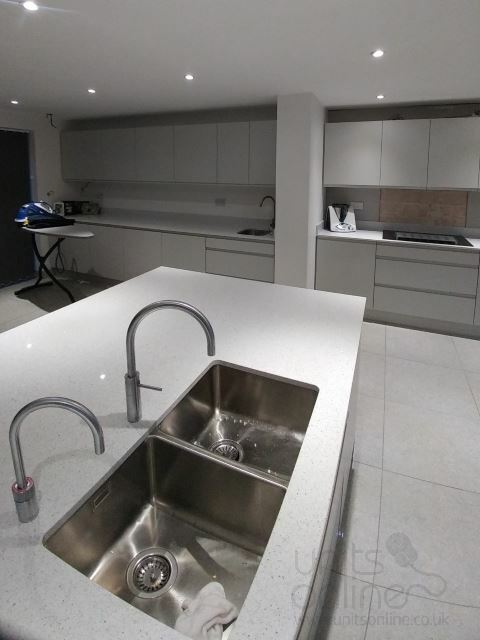 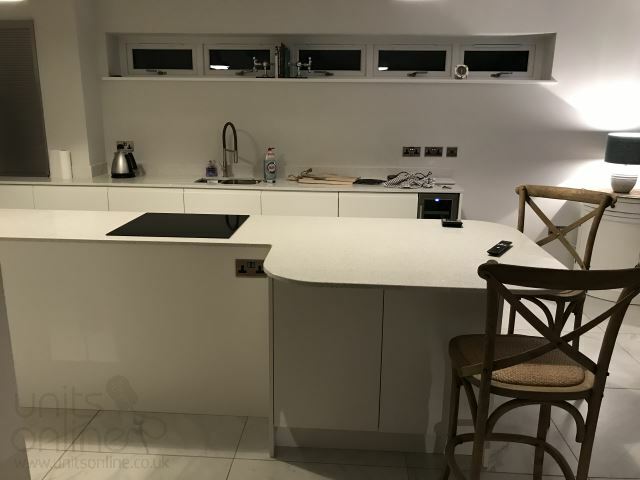 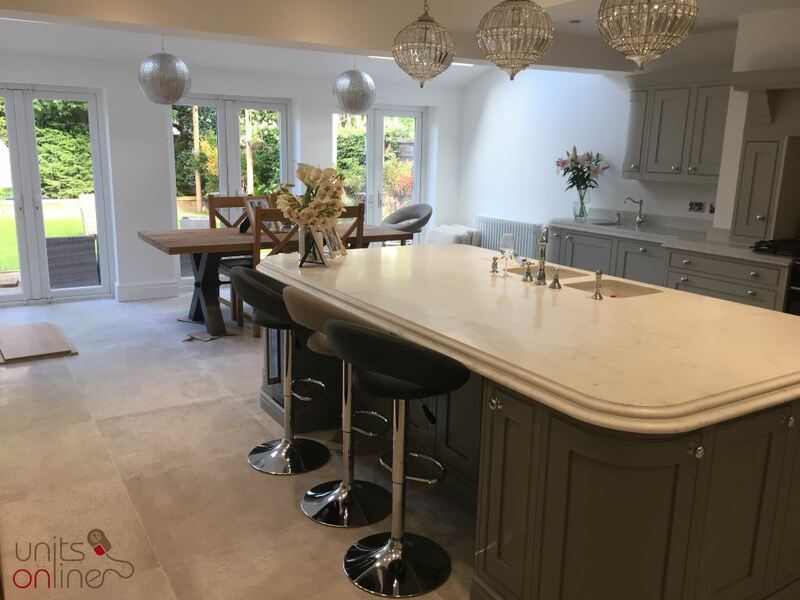 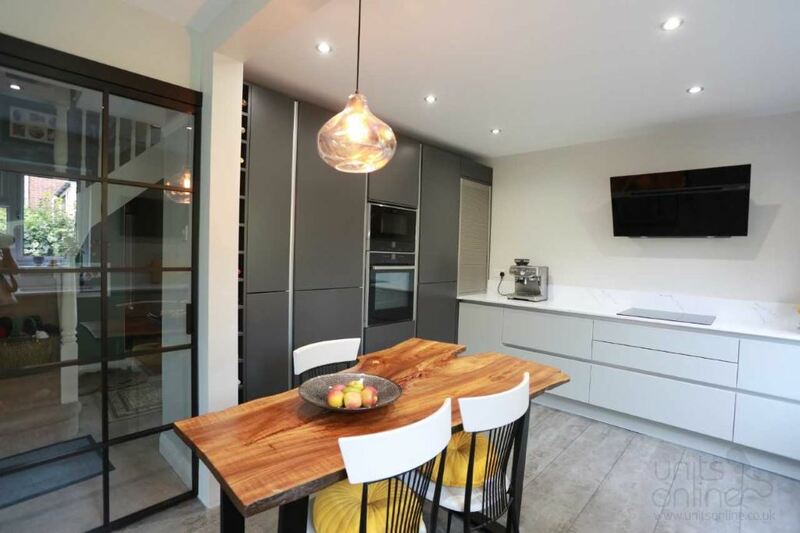 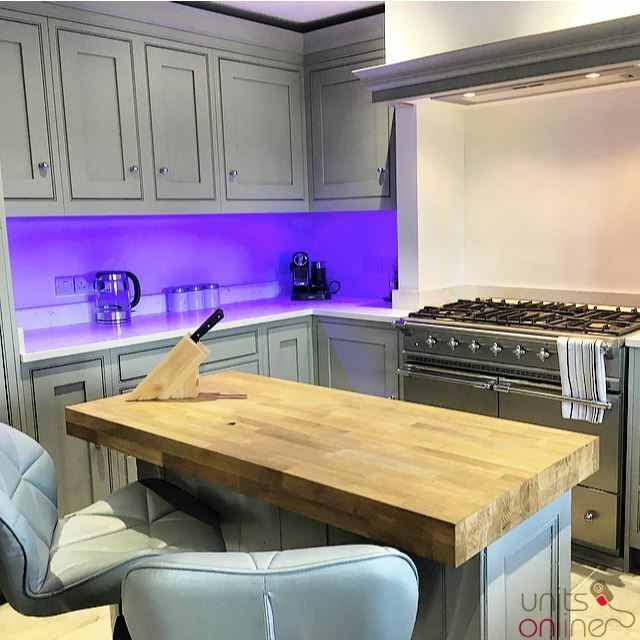 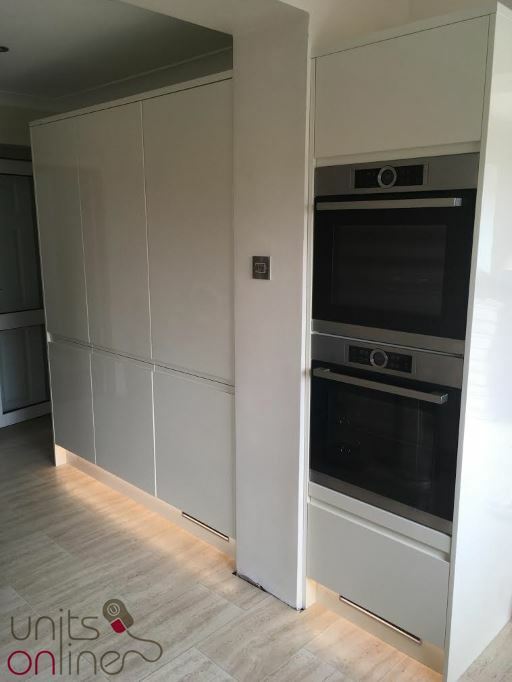 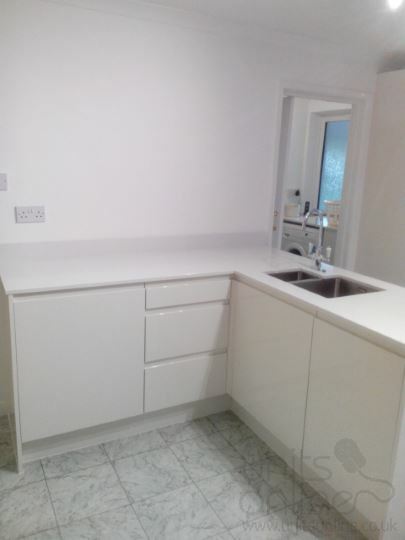 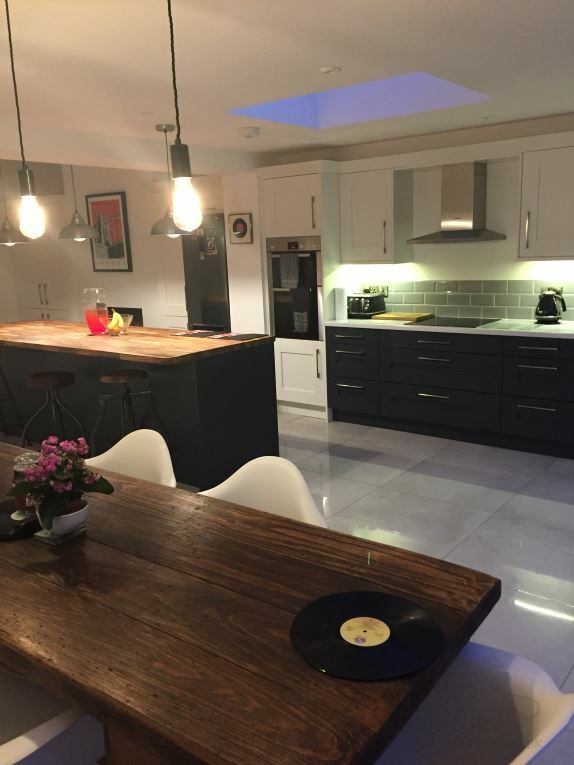 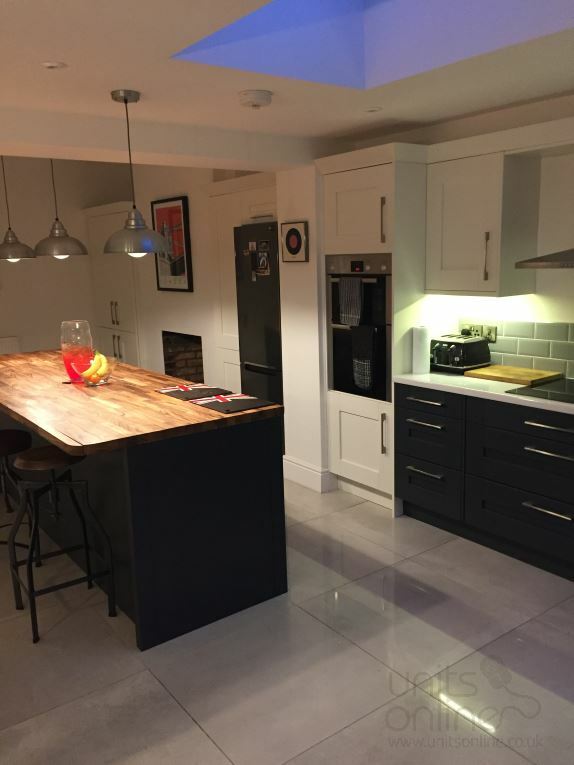 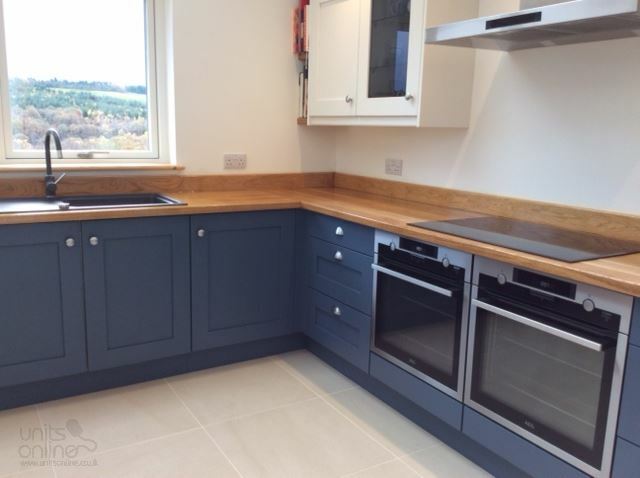 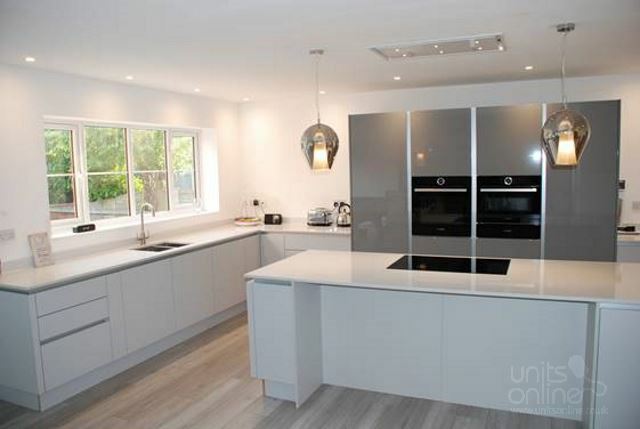 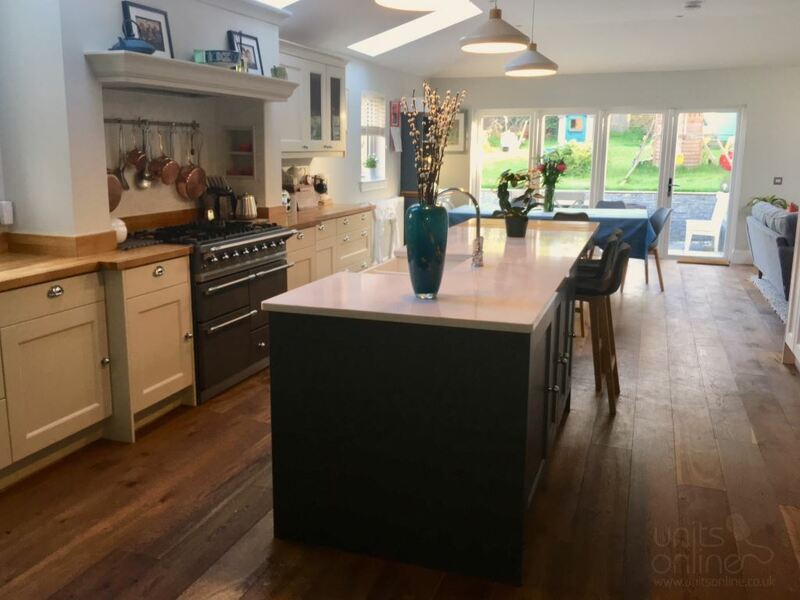 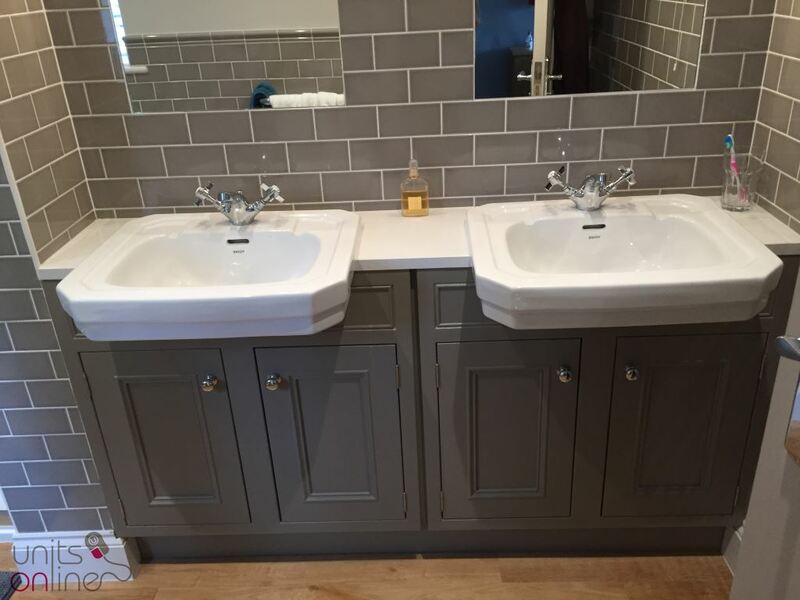 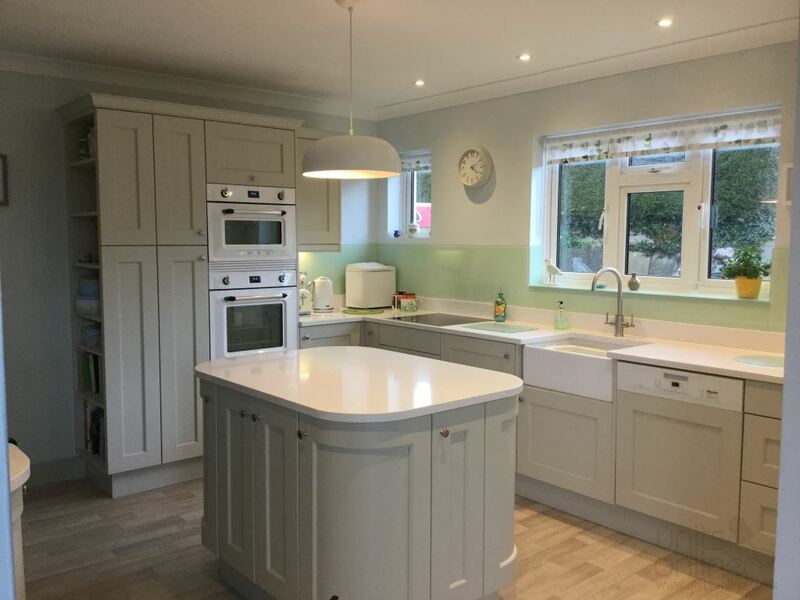 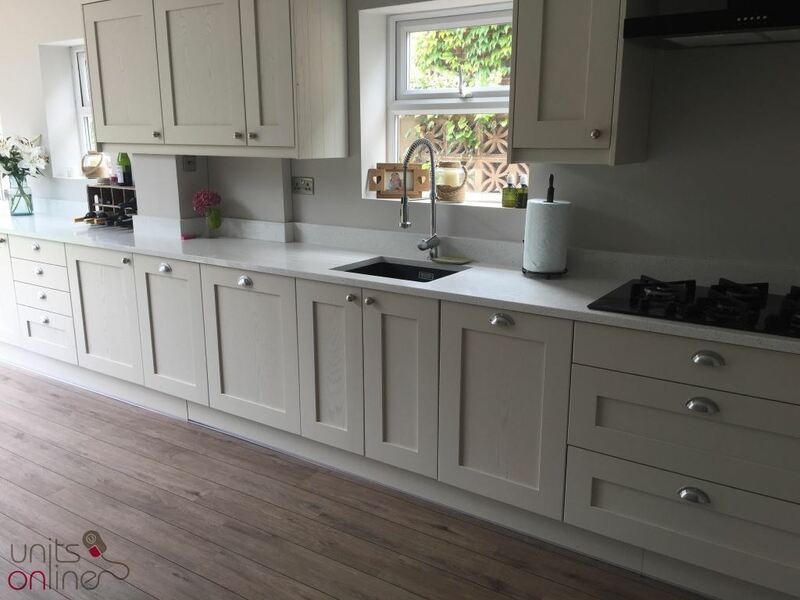 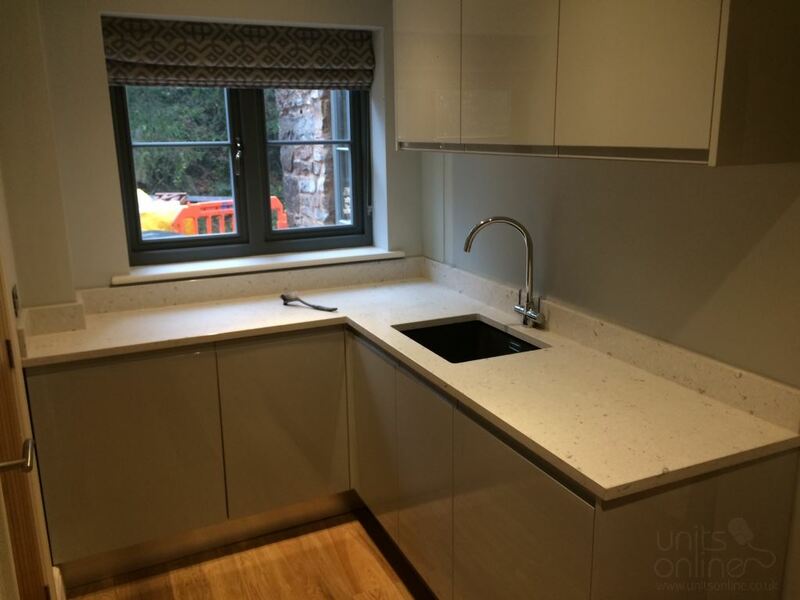 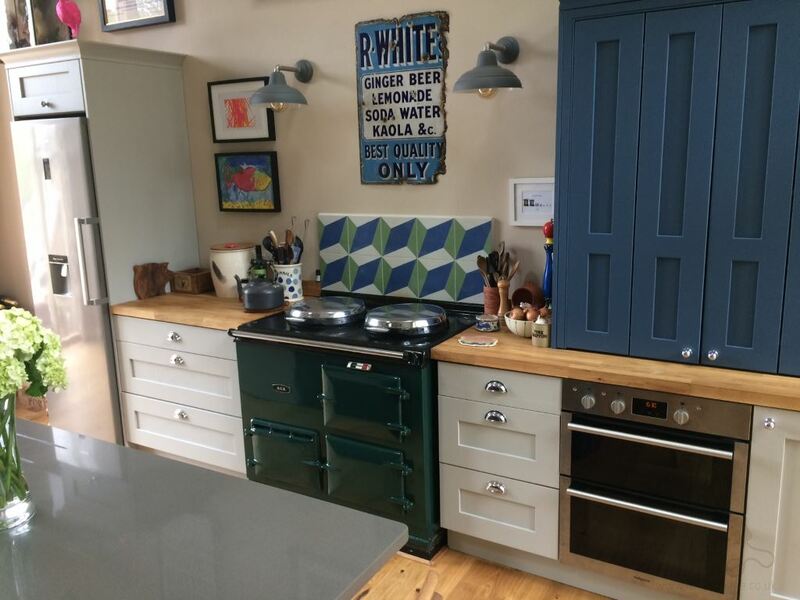 “I would like to express my gratitude to everyone at Units Online for helping us design our kitchen and then for supplying excellent quality units and fittings. 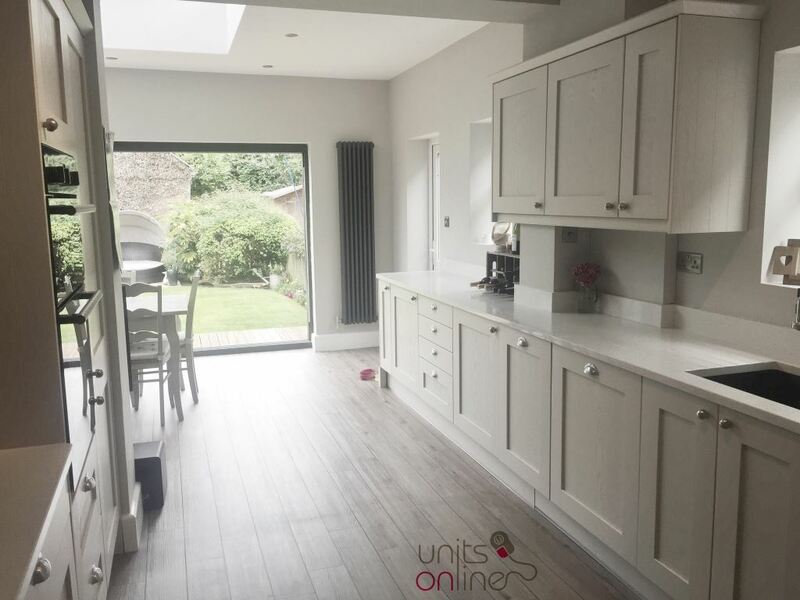 We were extremely impressed with the service, which for an online company was surprisingly very personal. 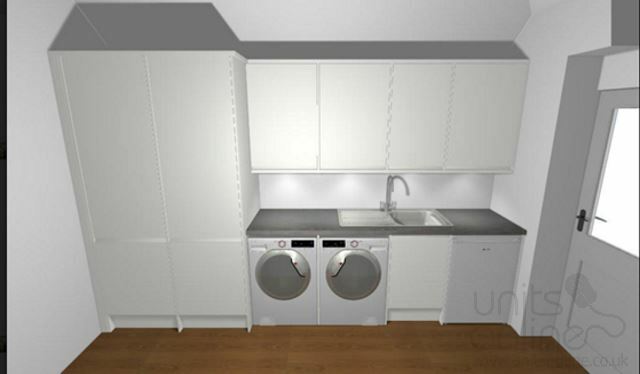 We opted for the design service (the cost of which was refunded as a deduction from our order) and from sending over a rough drawing of our initial ideas (a floorplan with measurements), we had several telephone conversations with Richard, who offered excellent advice and ideas for how we could achieve the two-colour scheme we loosely had in mind. 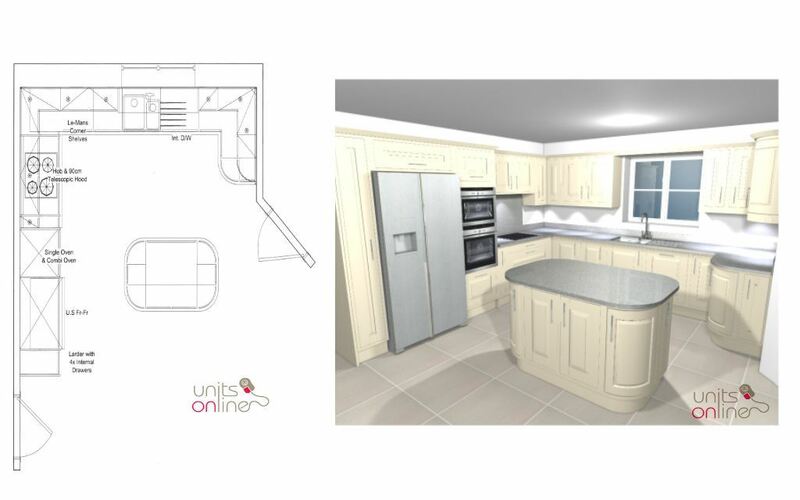 These ideas quickly evolved into detailed 3D images and floorplans, each time emailed over along with a link to a shopping basket of the items we would need to order so we could review prices. 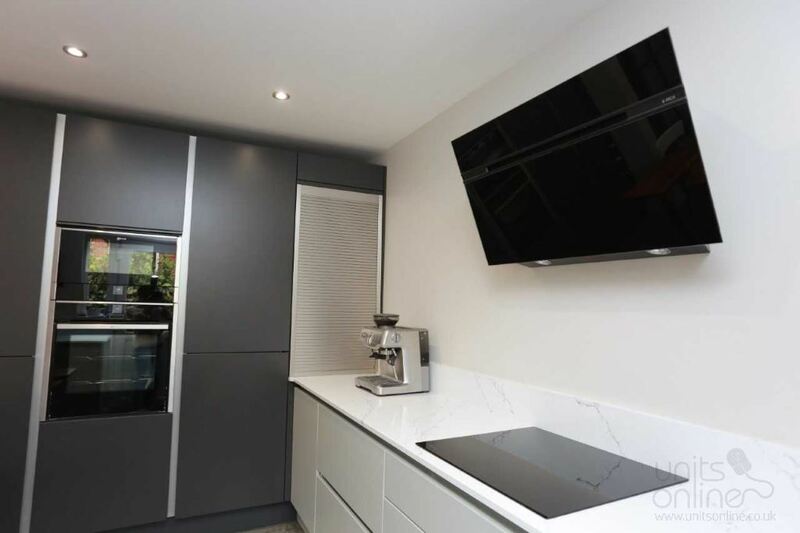 The 3D drawings were particularly useful, allowing us to discuss what we liked and didn't like before arriving at our final specification. 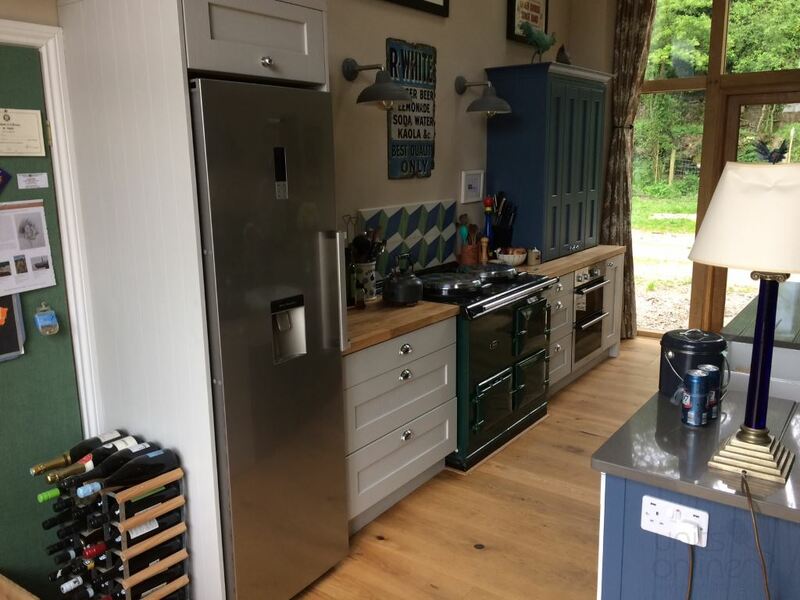 Any questions we had by email were quickly answered by return of email or if we phoned Richard he was usually available to speak. 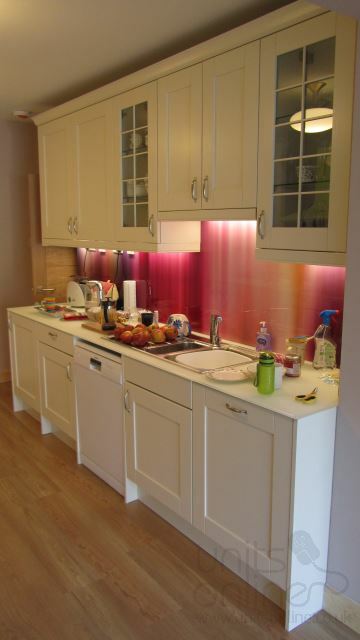 If not colleagues were also very helpful. 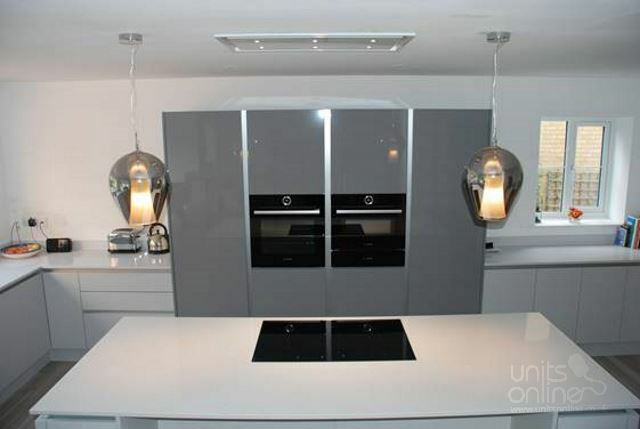 We then ordered. 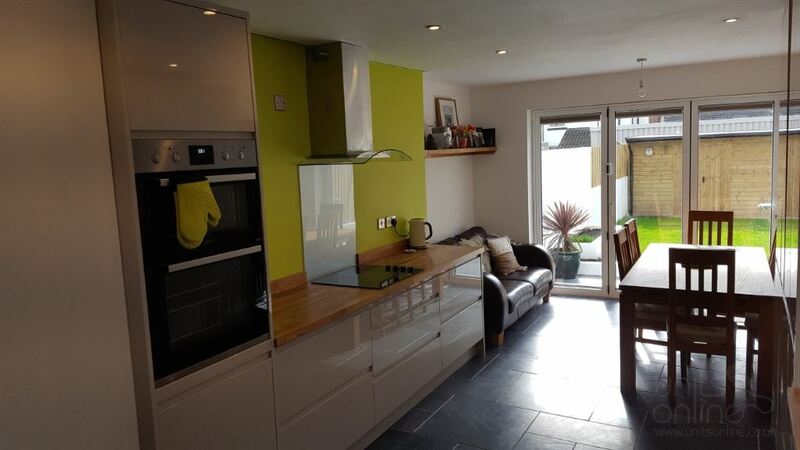 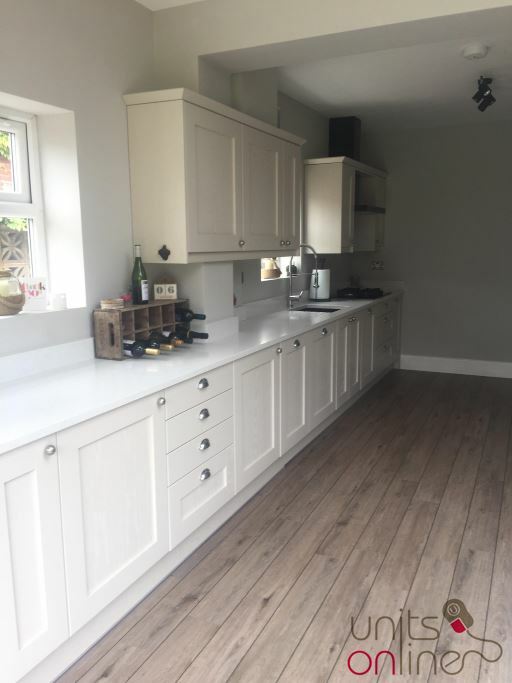 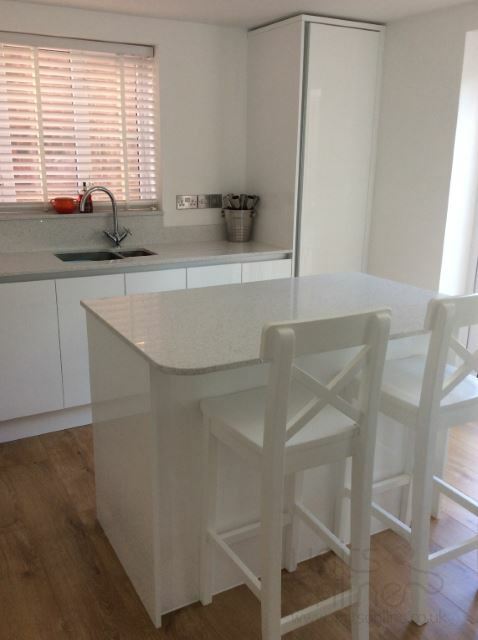 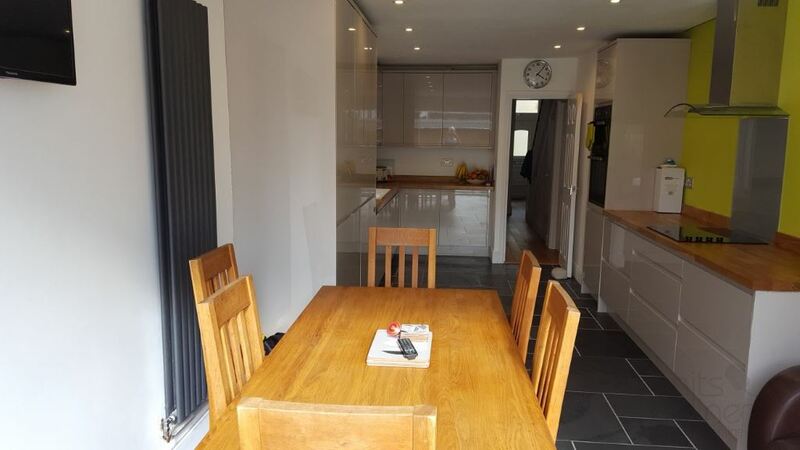 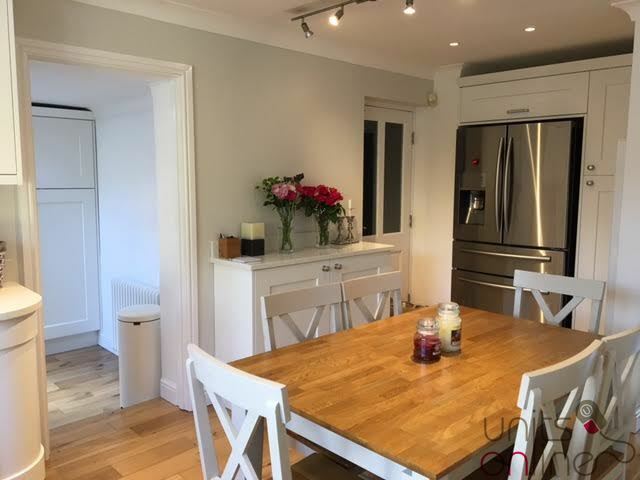 Richard was also very accommodating to our timetable and managed to get the kitchen built and delivered so it could be fitted by our moving in date. 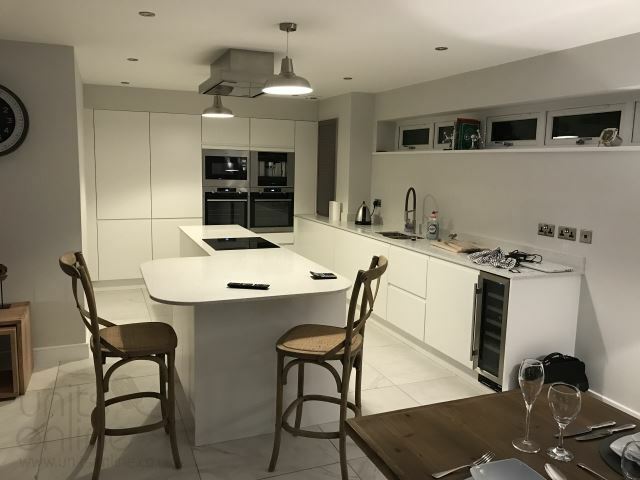 We secured our own local kitchen fitter who charged a fixed price for his time (he also did an excellent job, if you need a fitter in the Essex area let Richard know and I will pass on his details), bought our appliances online (after much research and shopping around) and we already had an electrician doing the rest of the house.